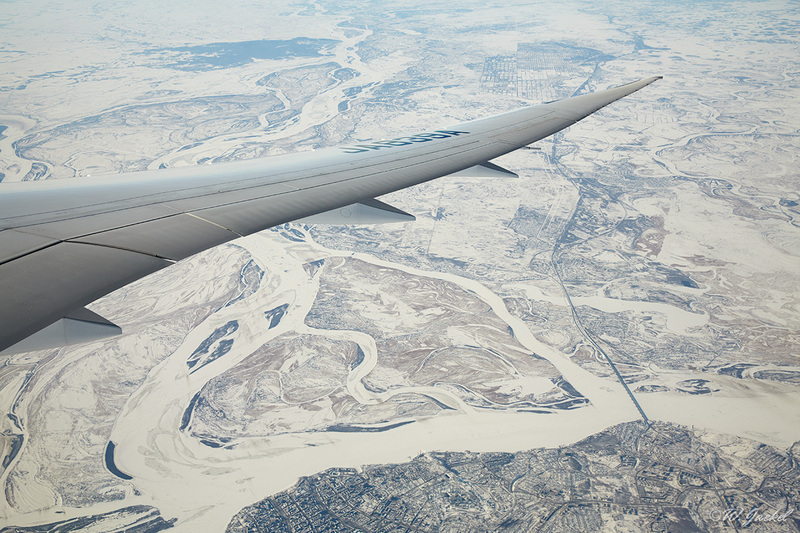 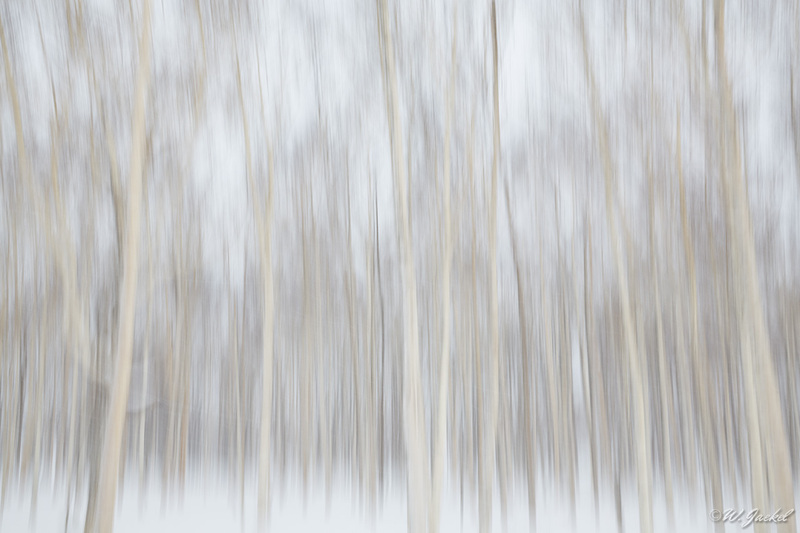 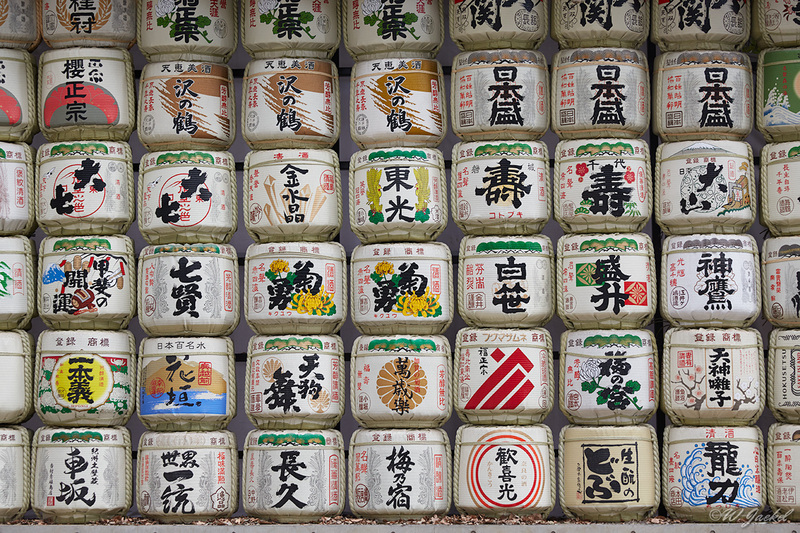 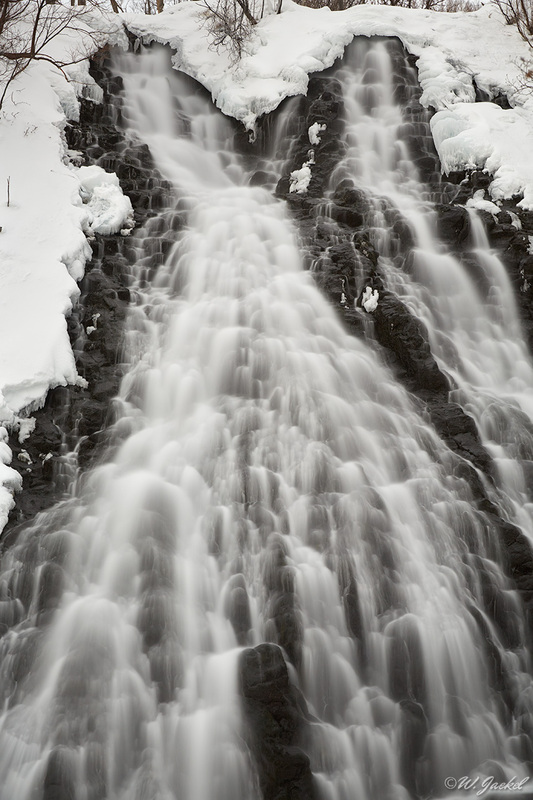 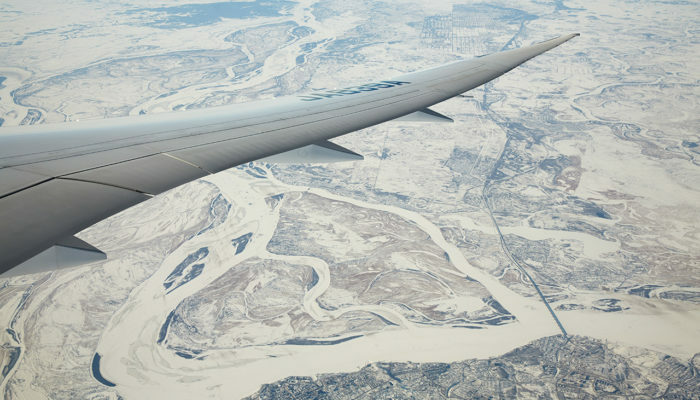 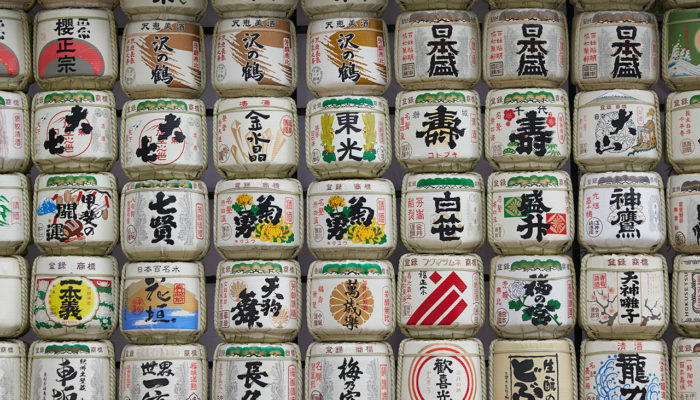 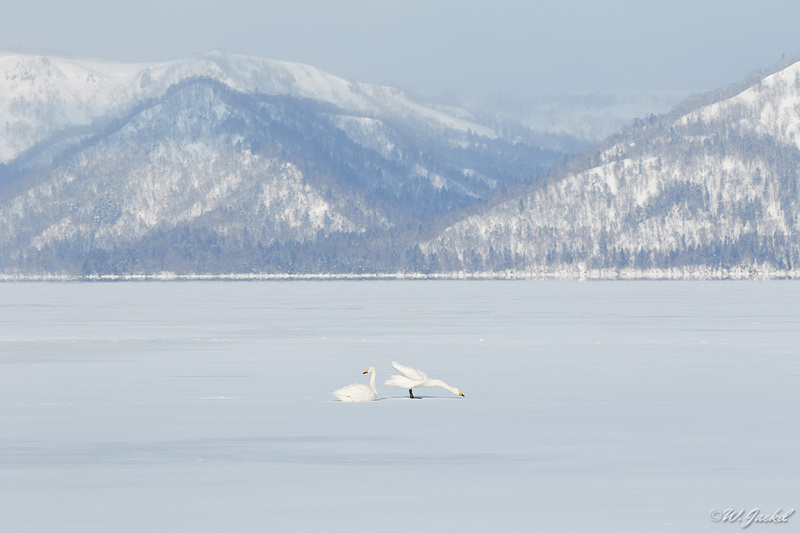 In February 2016 I had joined a 10days photo tour to Japan. 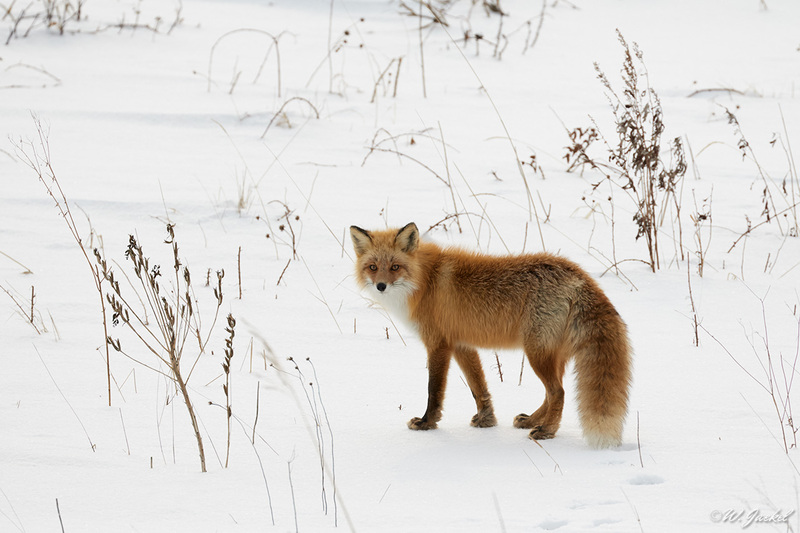 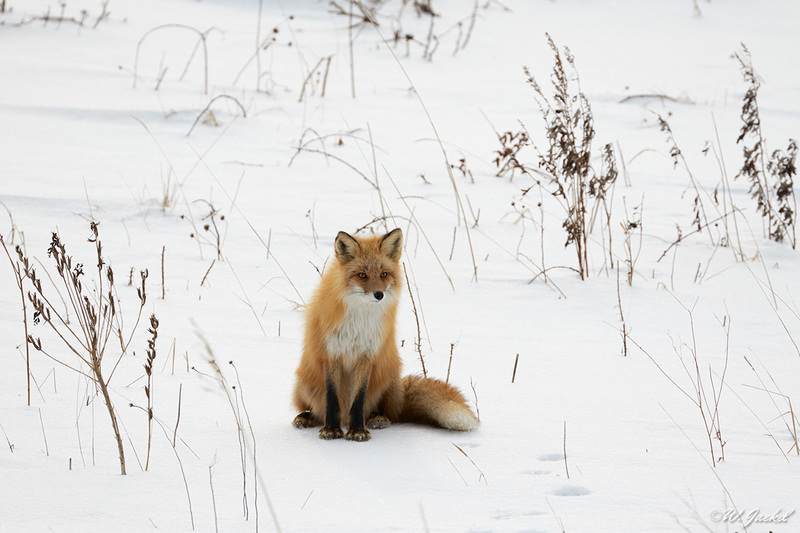 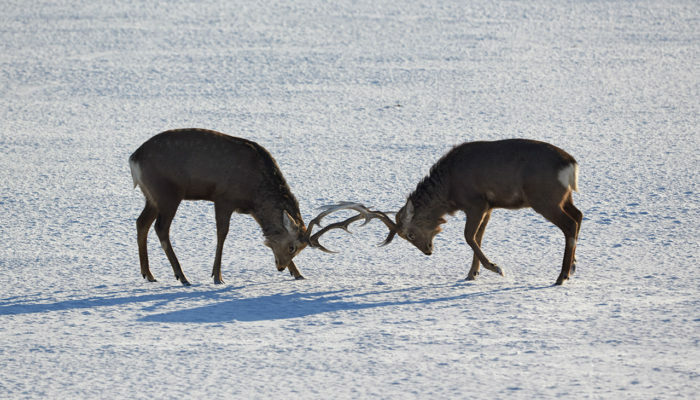 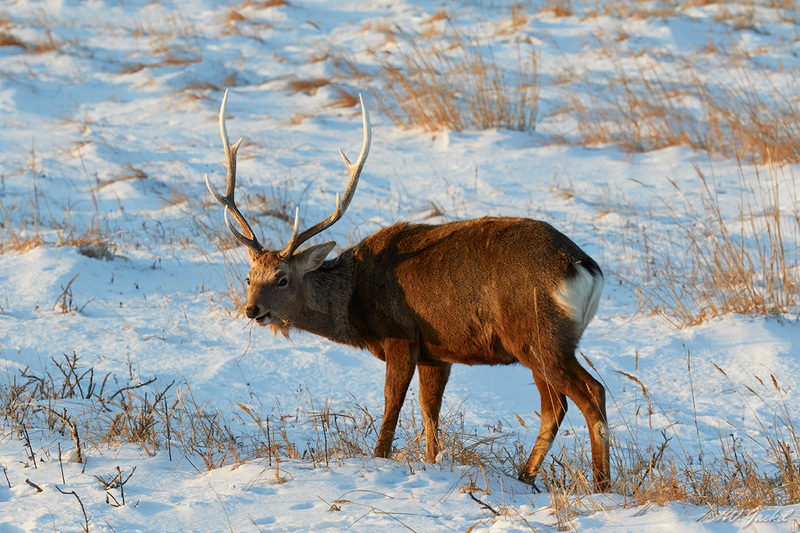 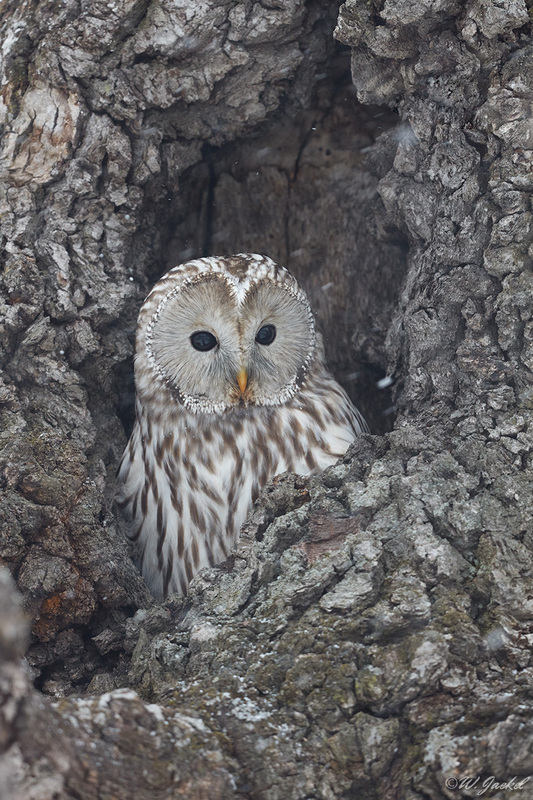 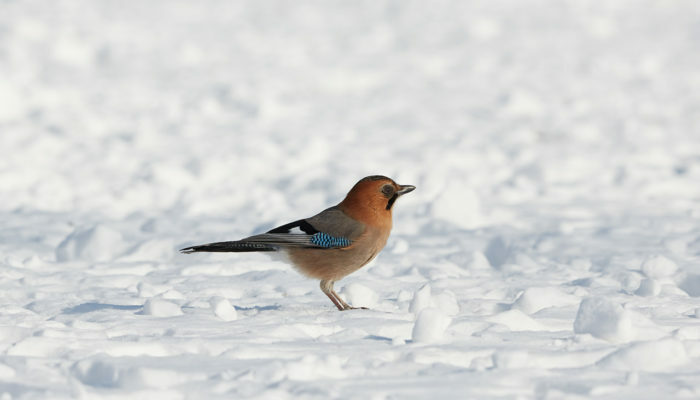 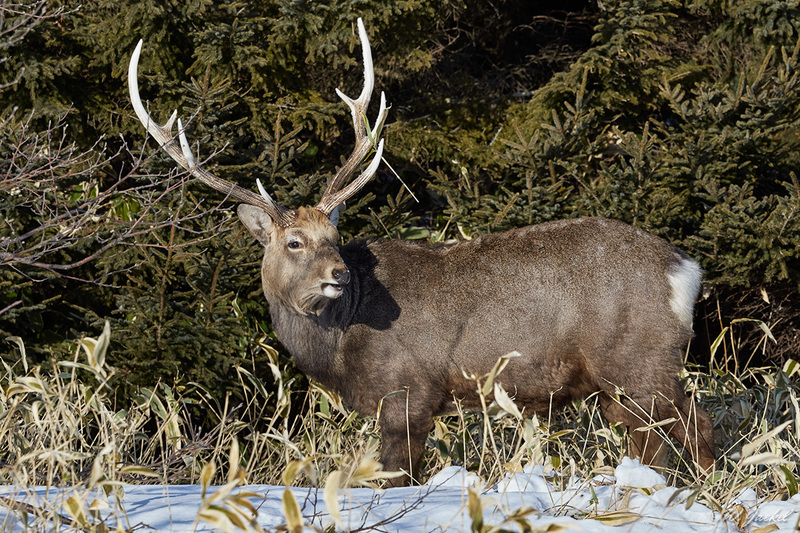 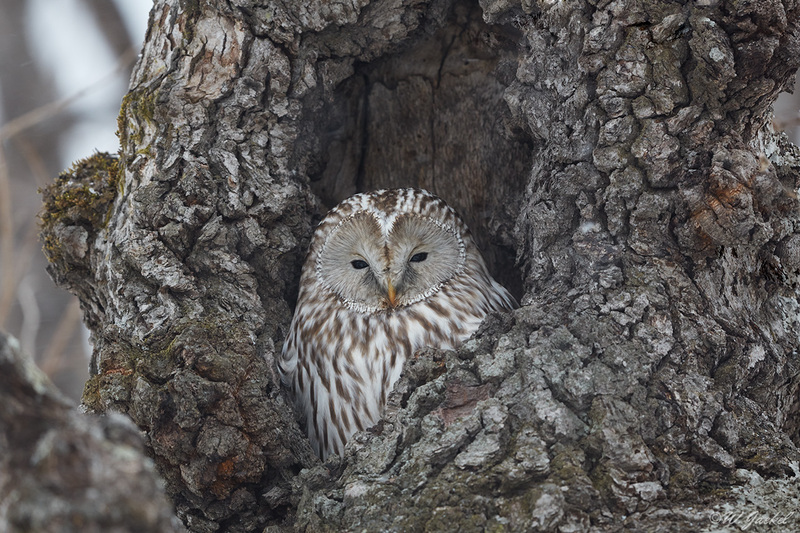 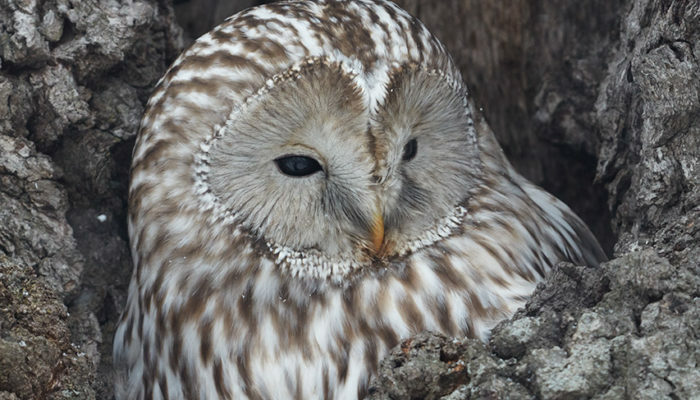 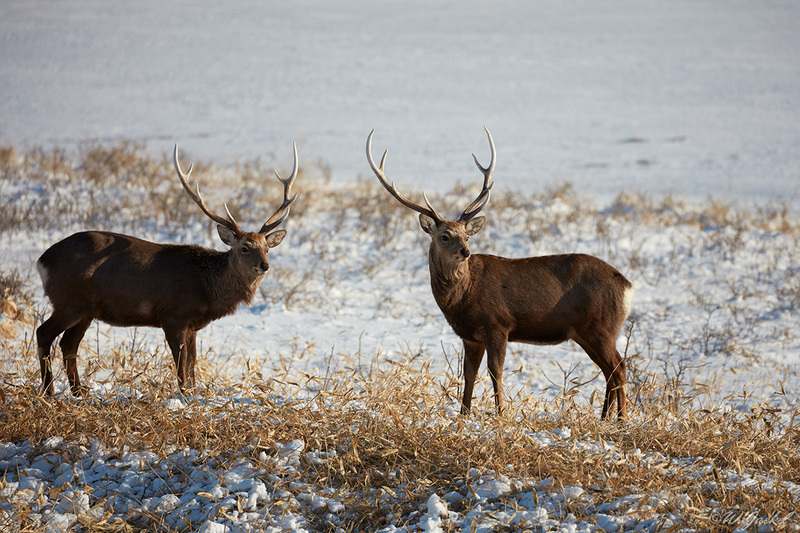 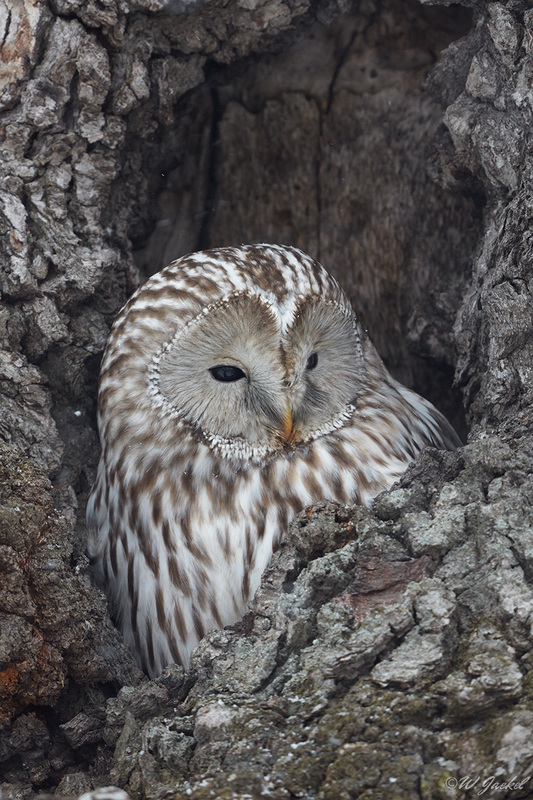 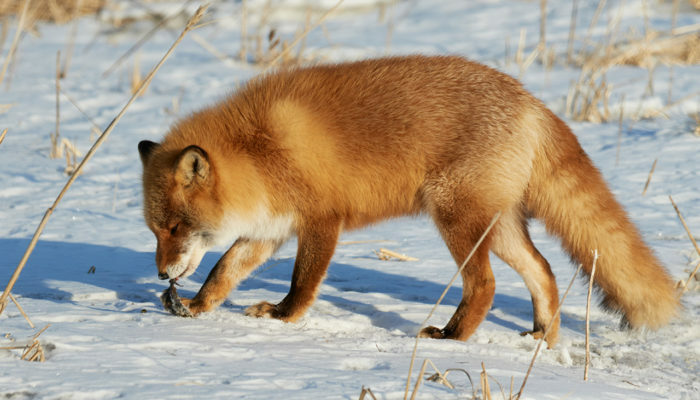 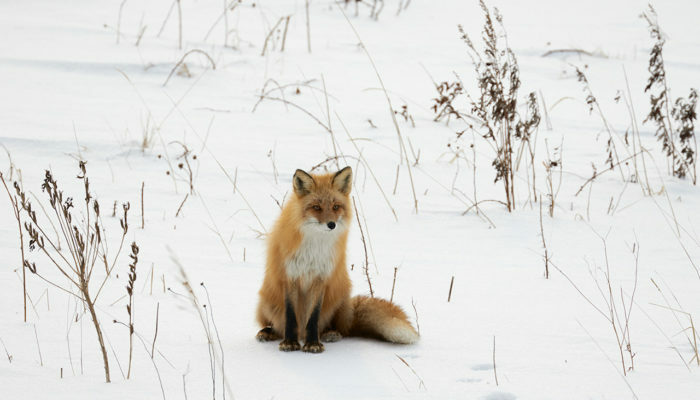 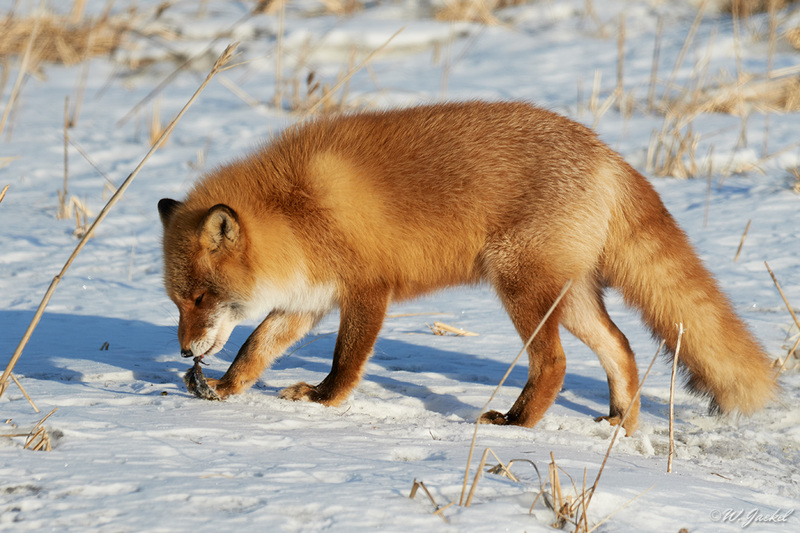 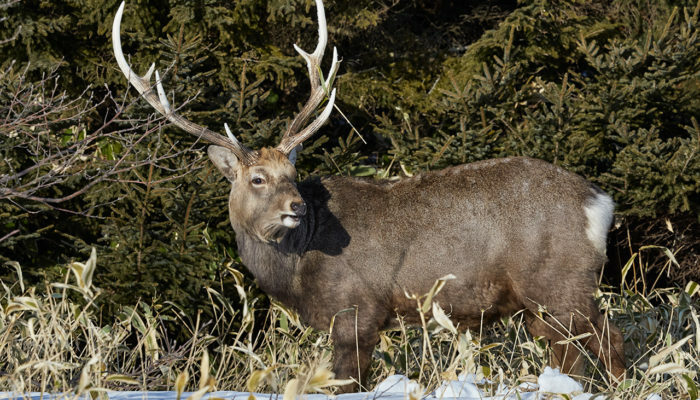 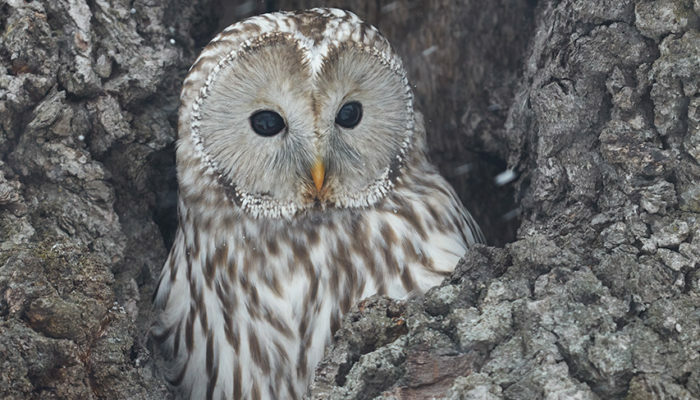 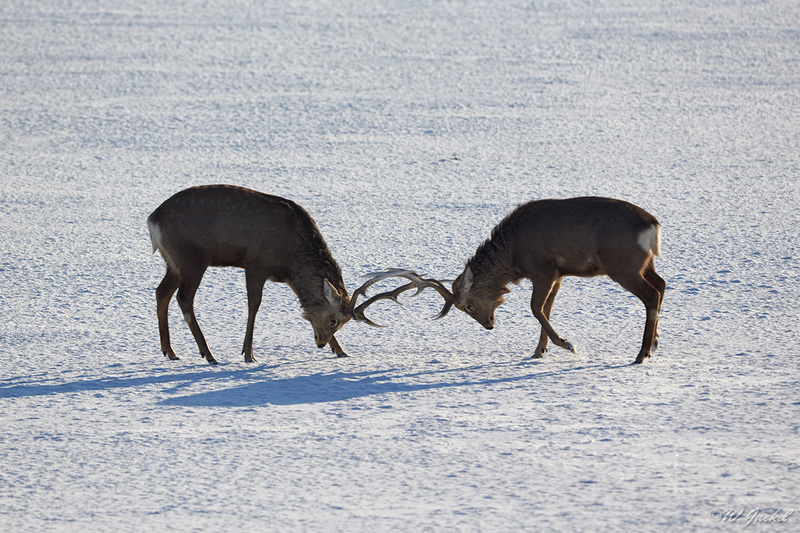 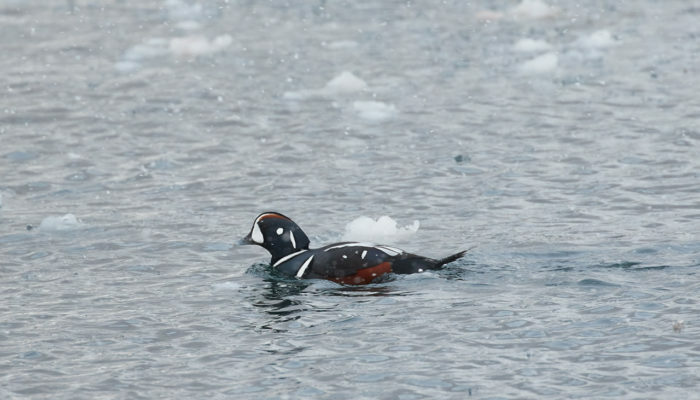 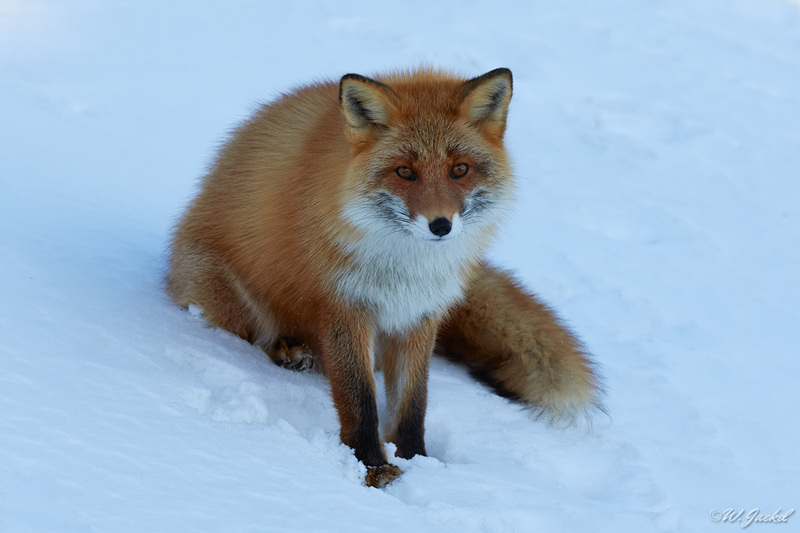 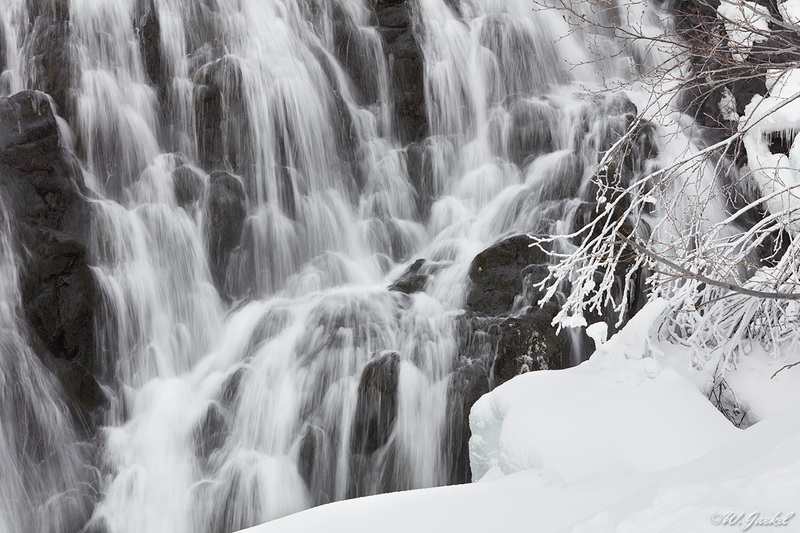 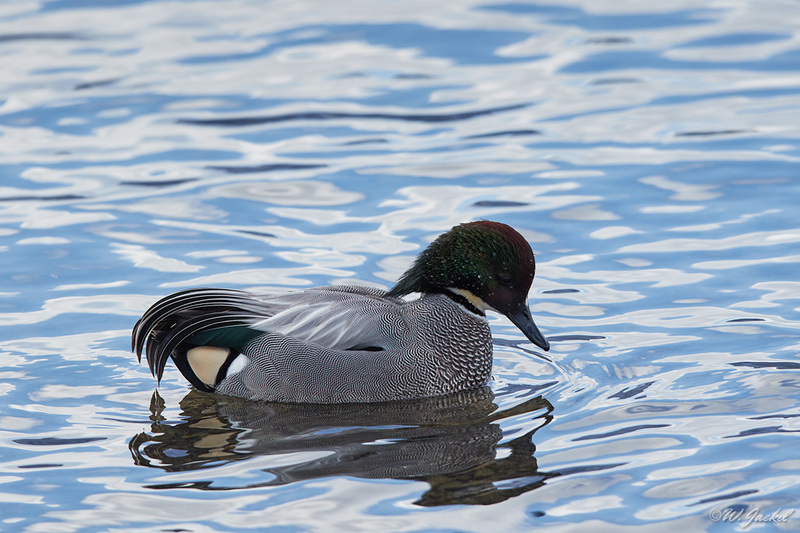 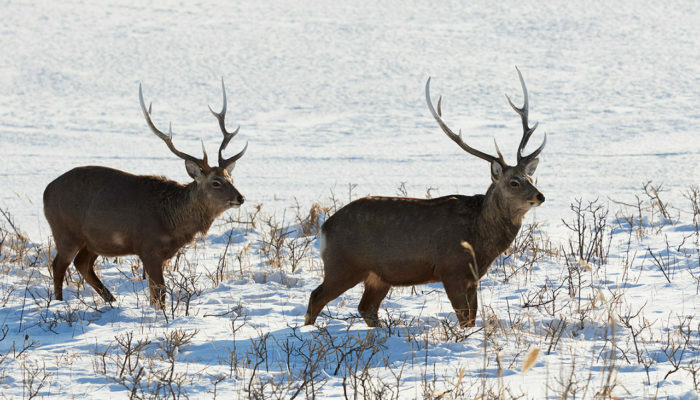 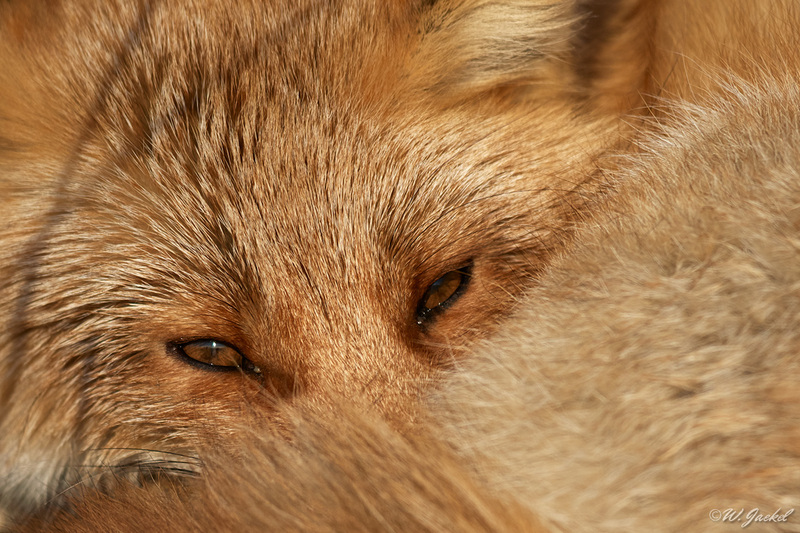 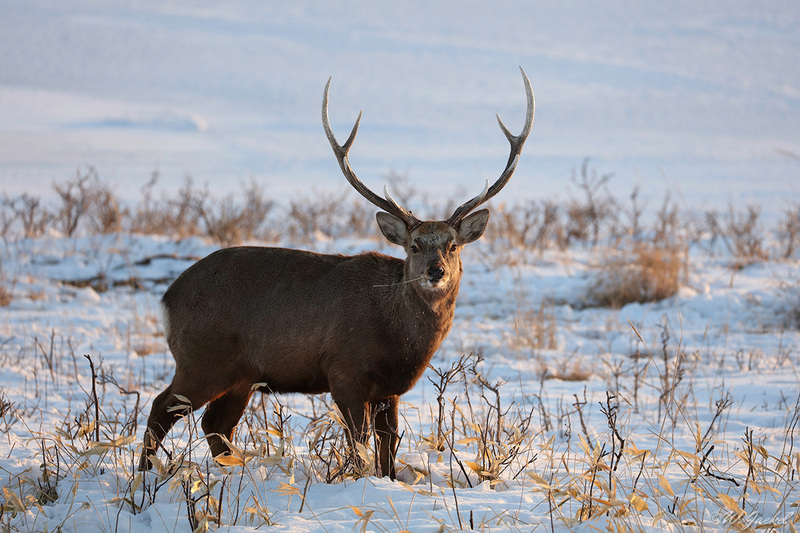 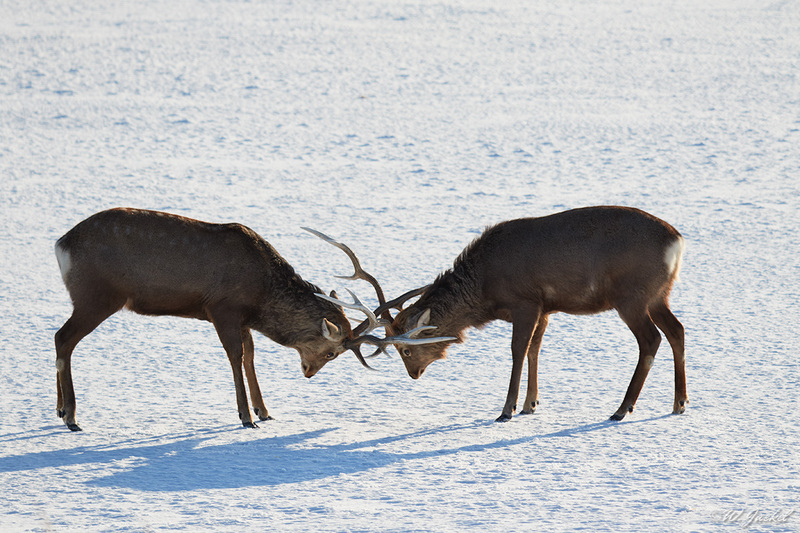 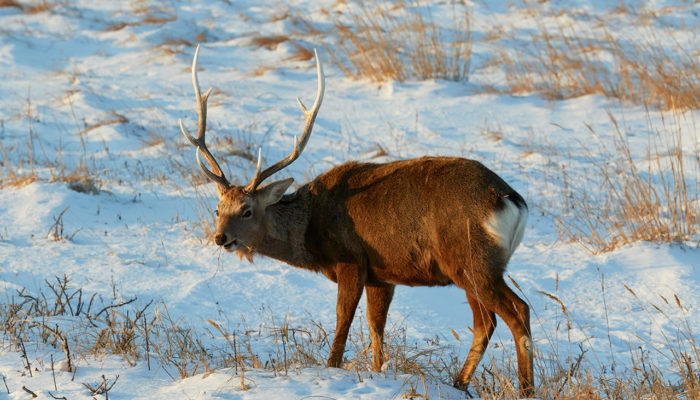 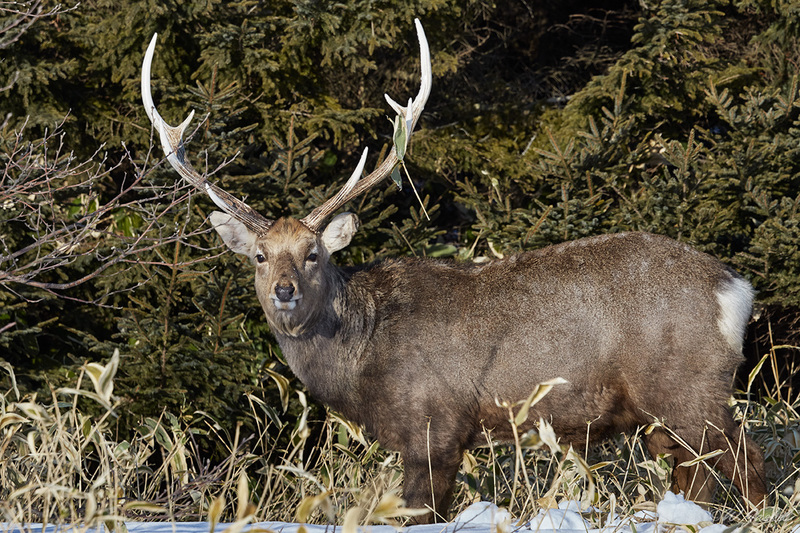 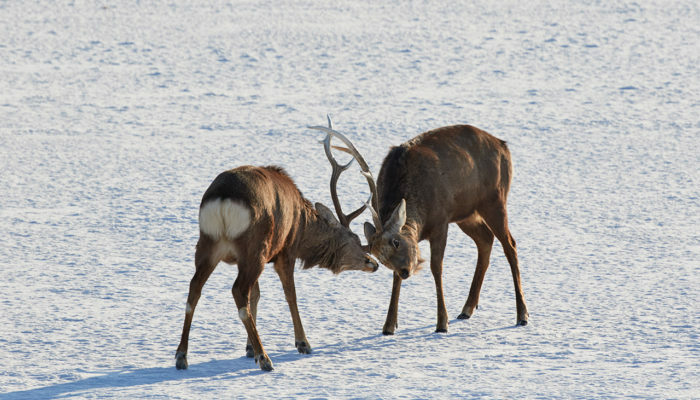 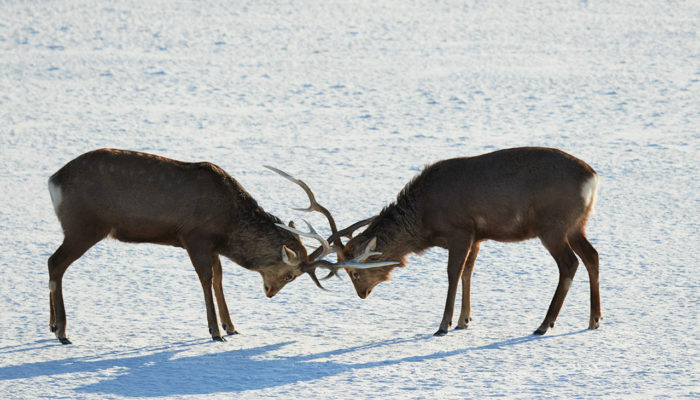 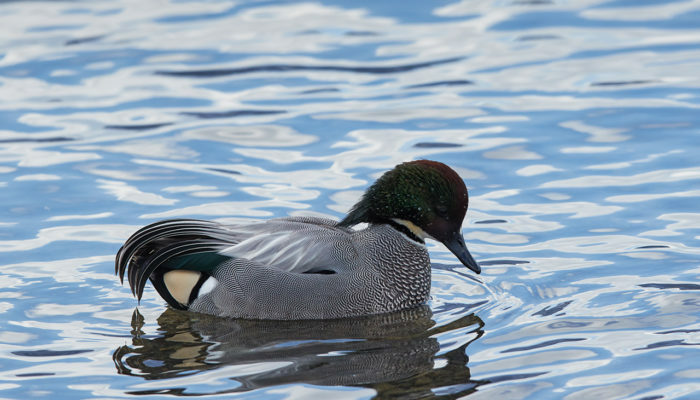 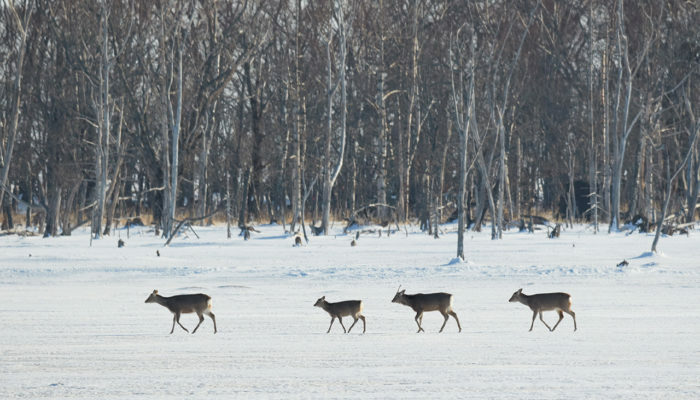 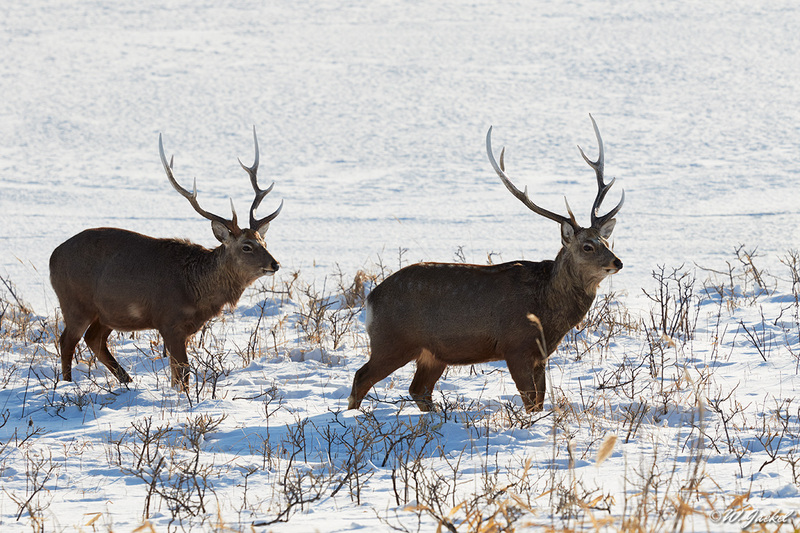 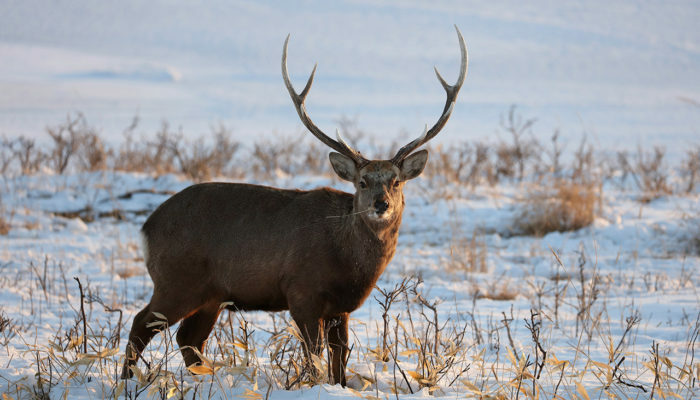 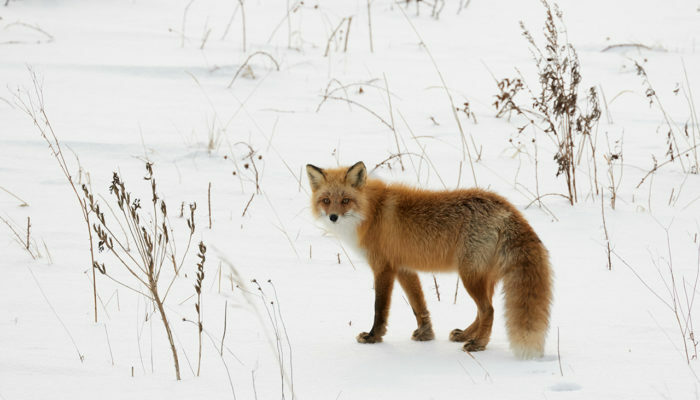 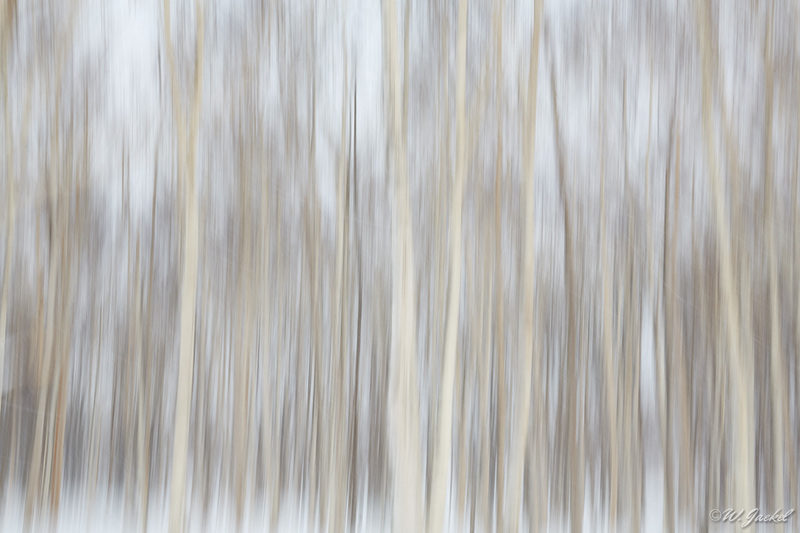 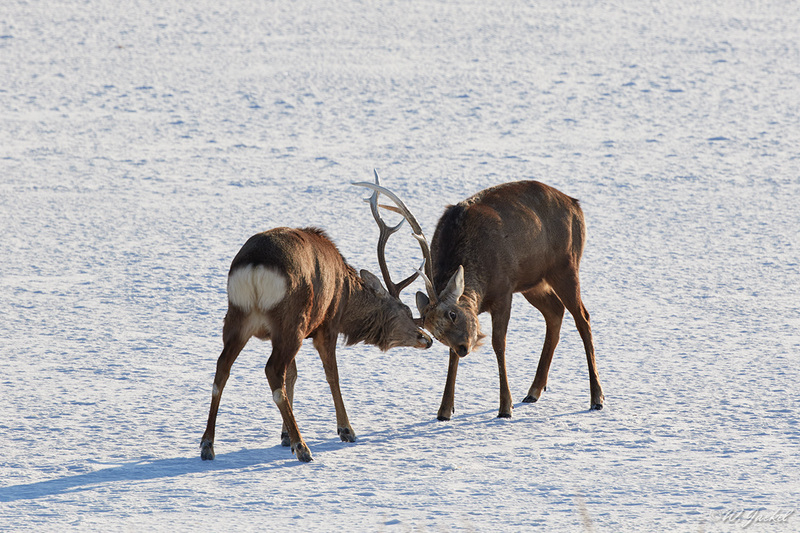 Photographing the famous winter wildlife has been on my wish list for many years. 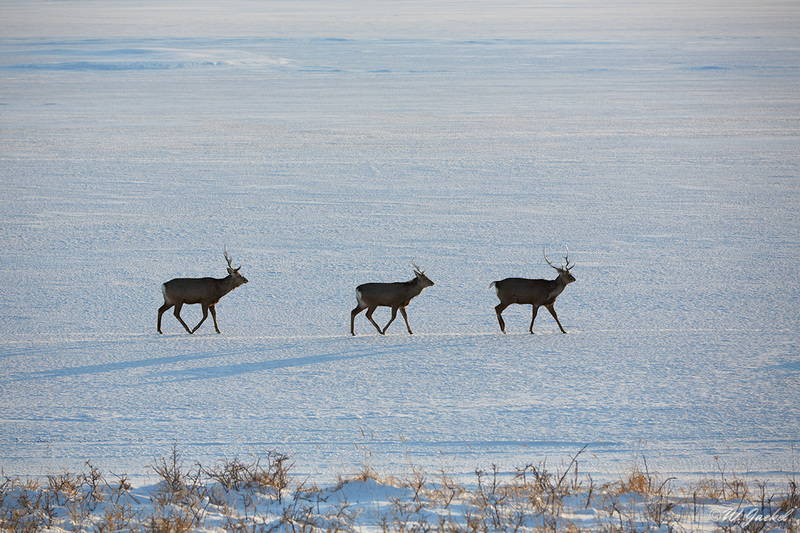 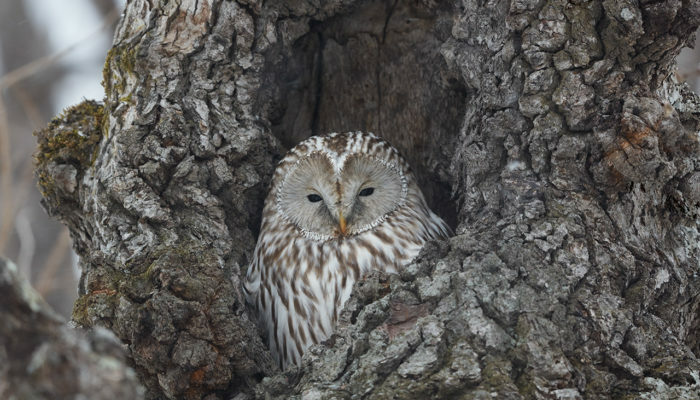 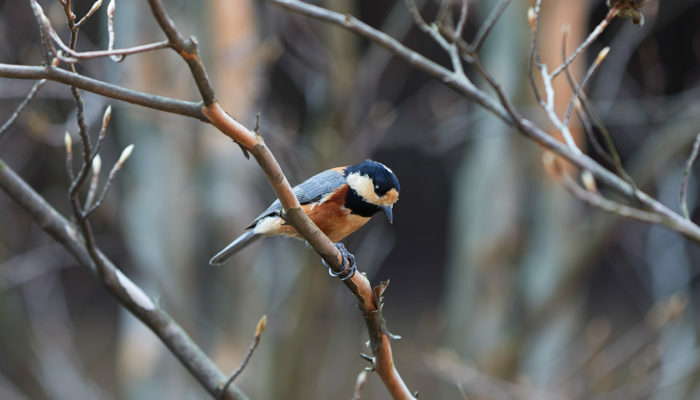 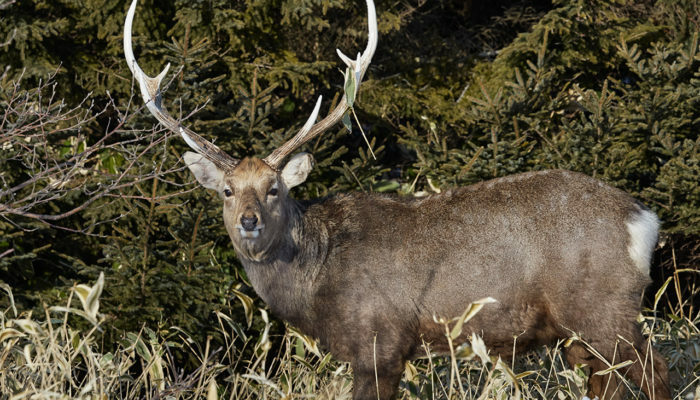 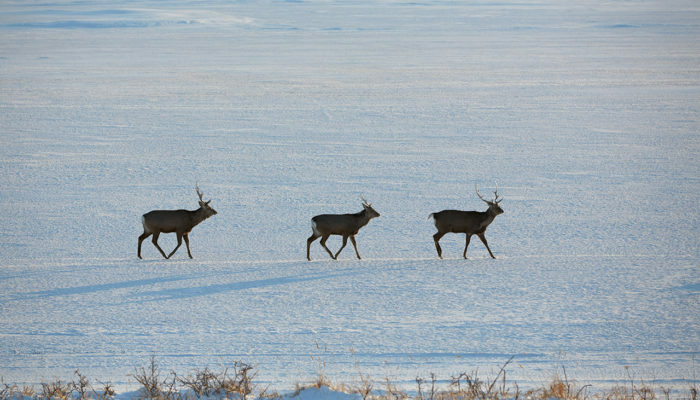 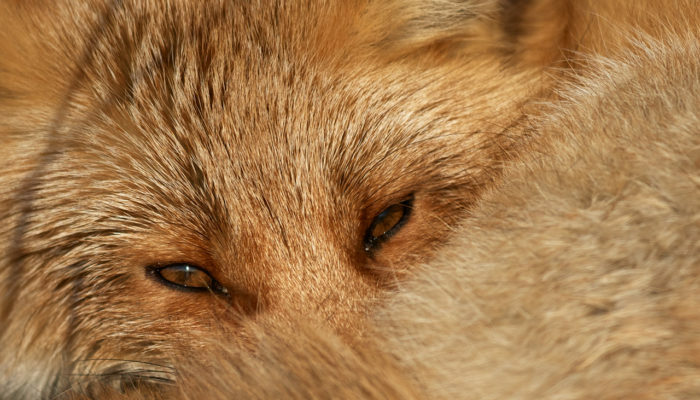 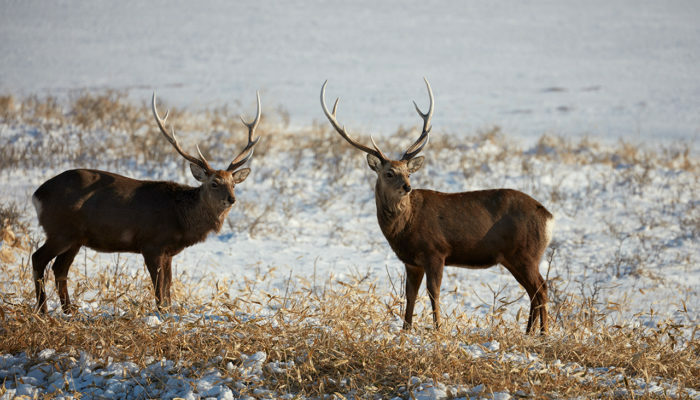 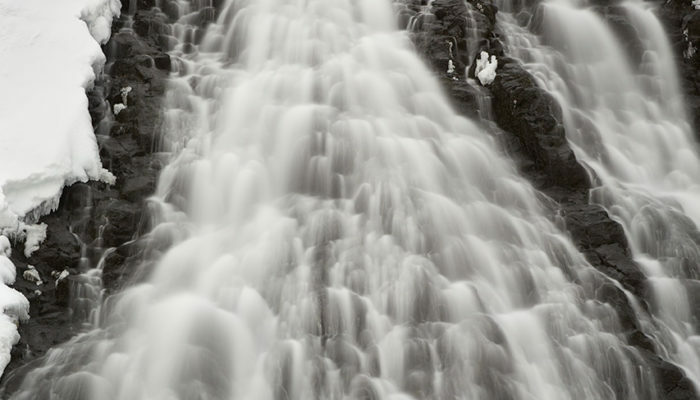 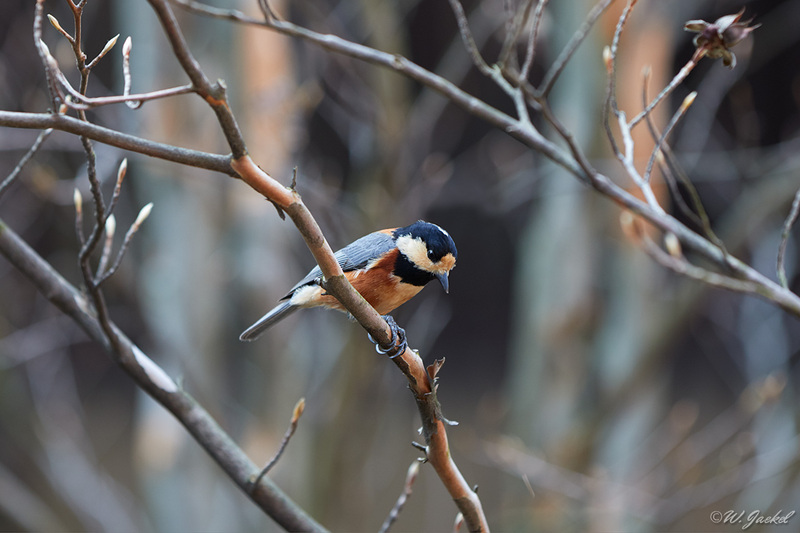 At that time of the year there are 4 main hotspots for wildlife photography. 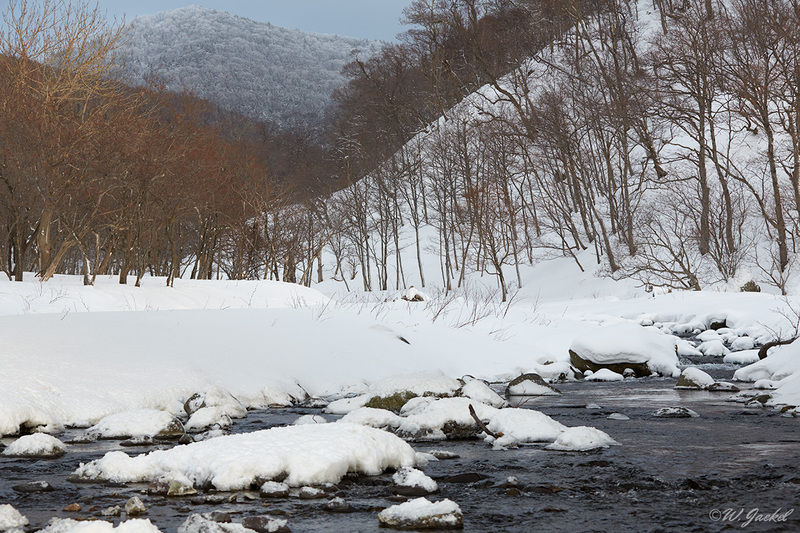 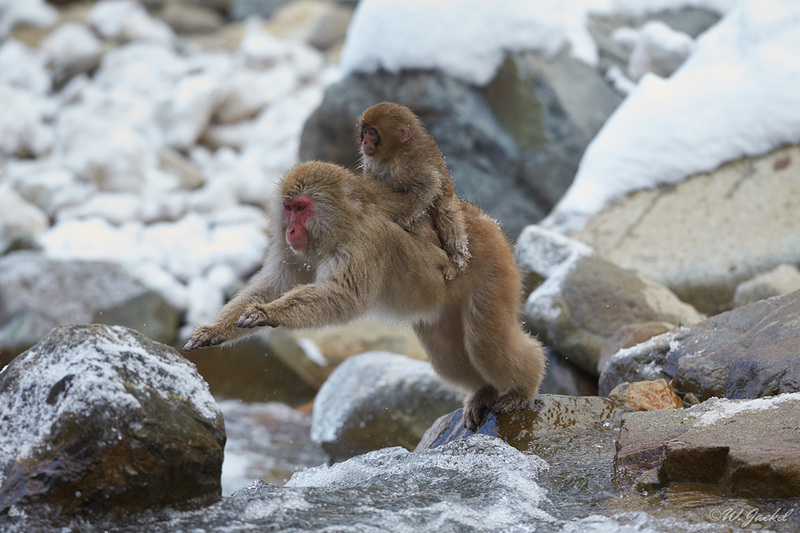 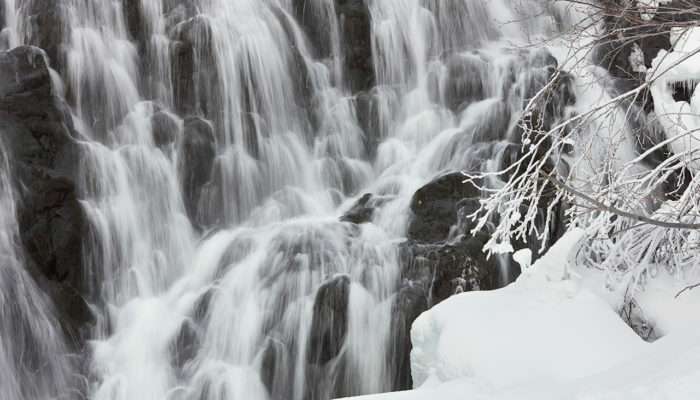 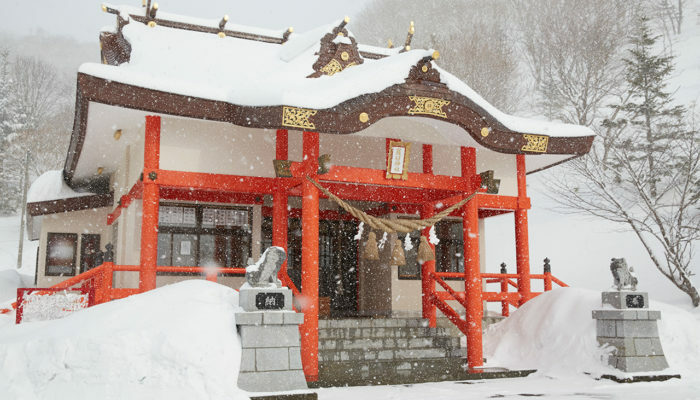 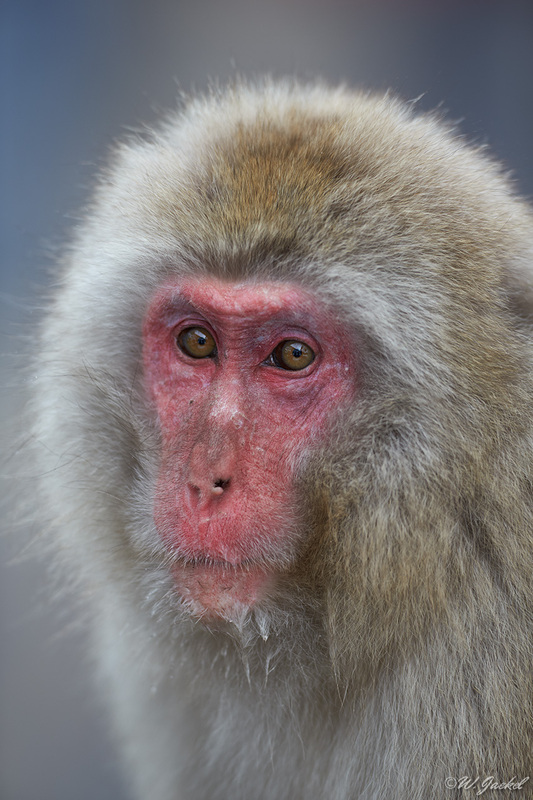 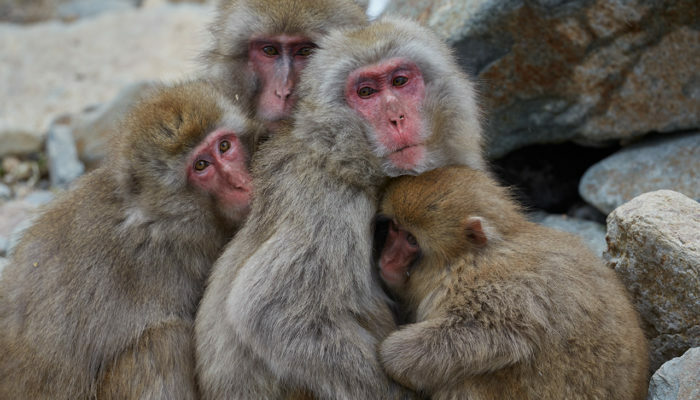 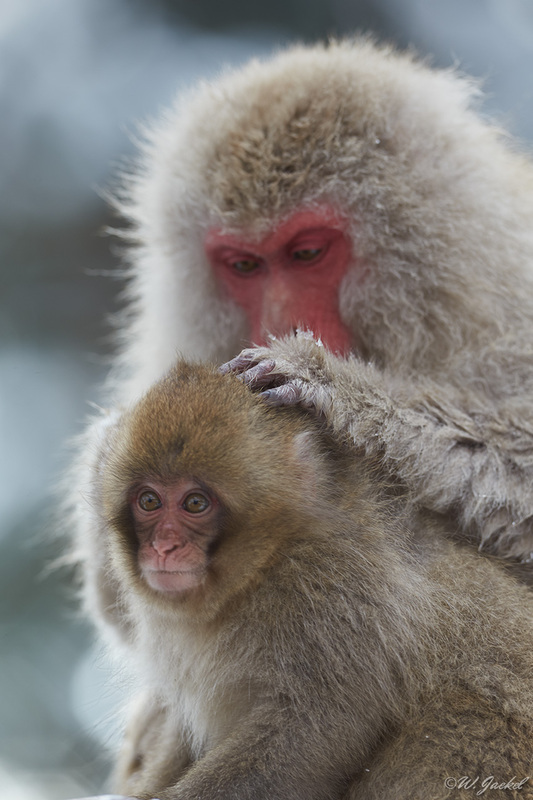 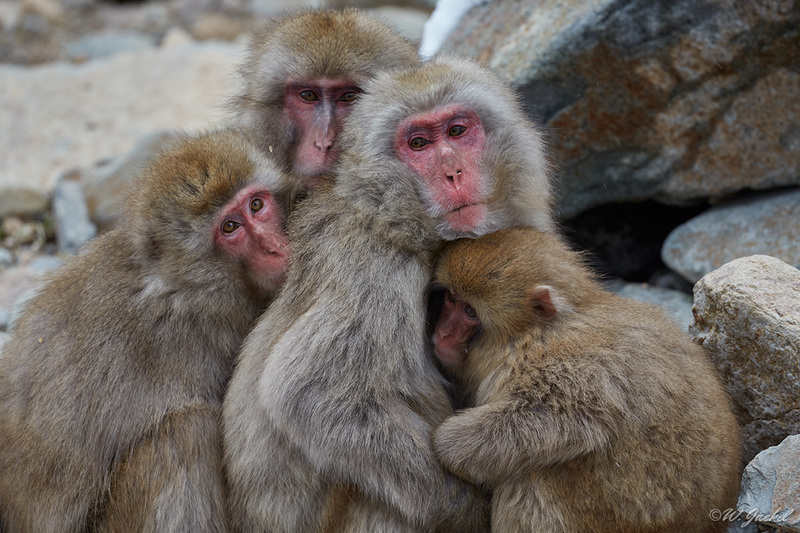 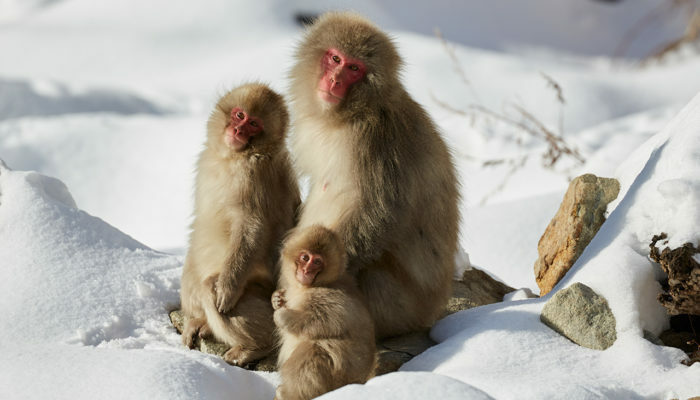 Starting from Tokio we first went to the Nagano prefecture to photograph the Snow Monkeys at the Monkey Park which is situated in the northern Japanese alps on the west side of main island of Honshu. 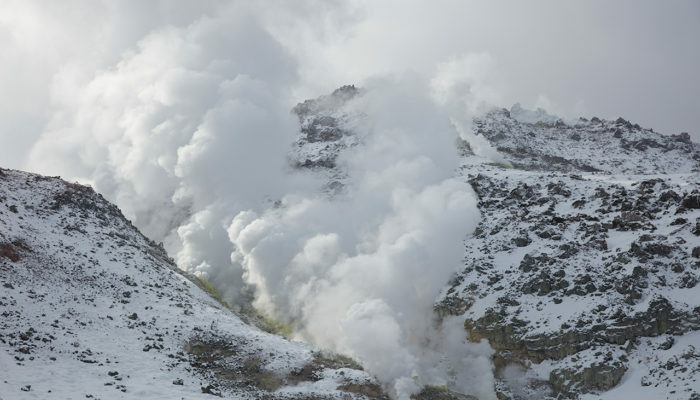 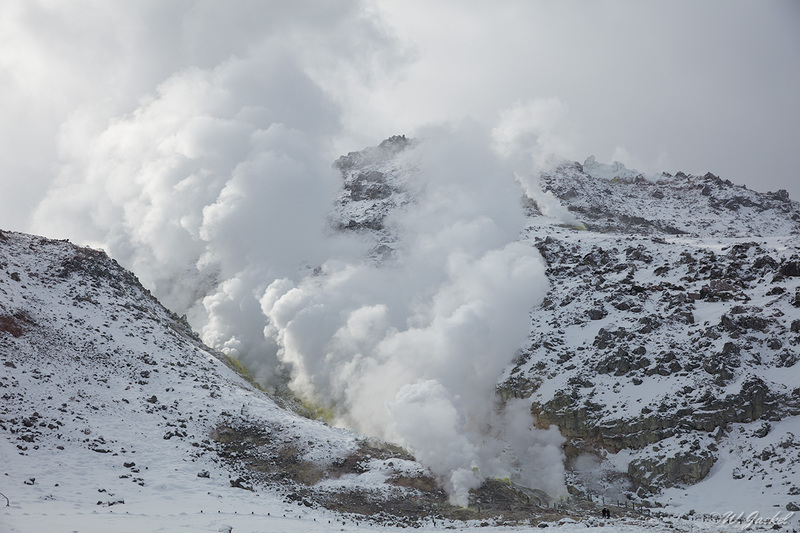 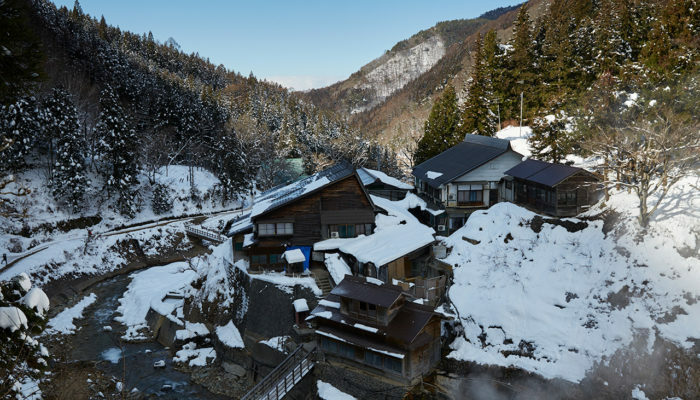 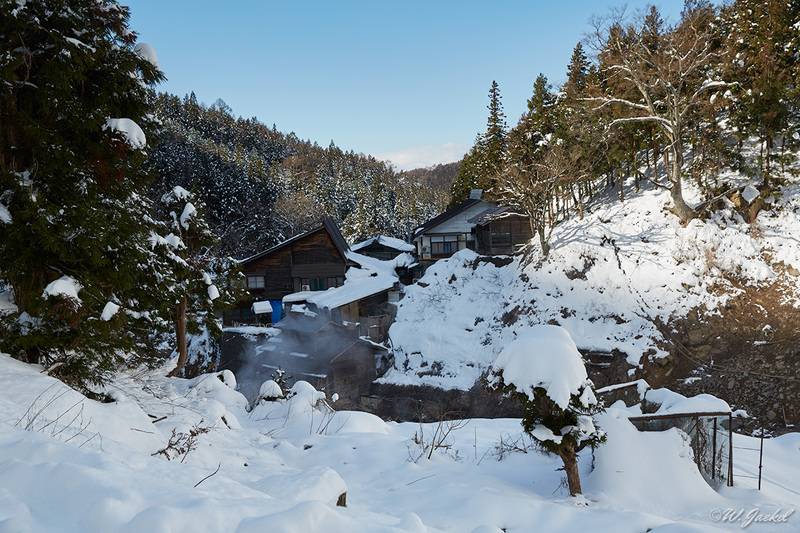 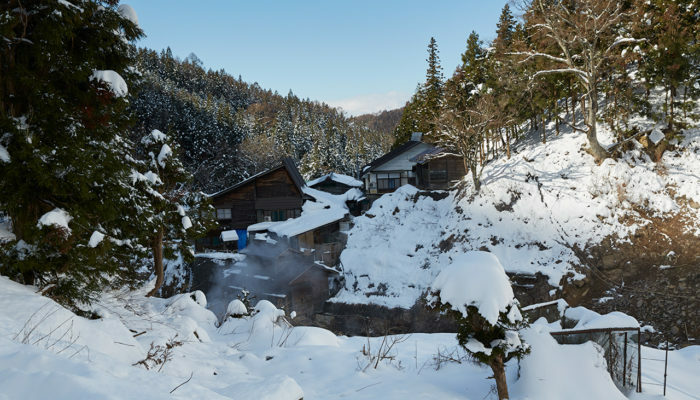 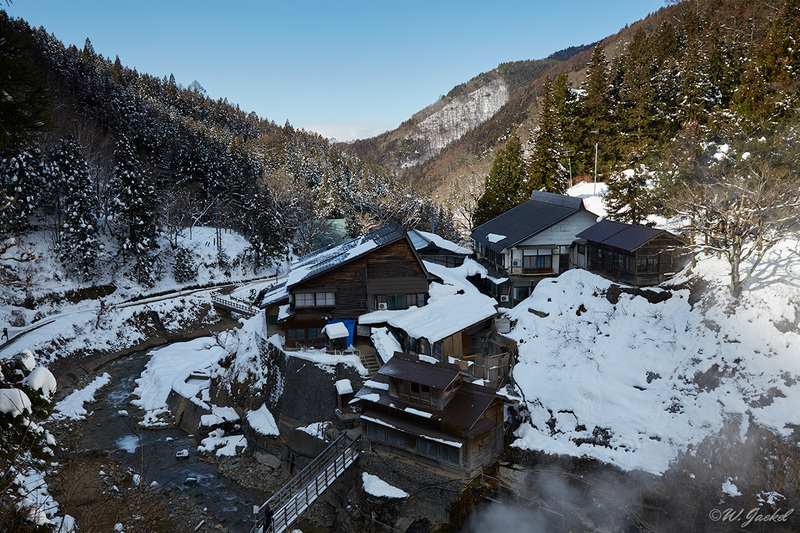 At an elevation of 850 meters, the area is called Jigokudani (“Hell’s Valley”) due to the steep cliffs and hot water steaming out from the earth’s surface. 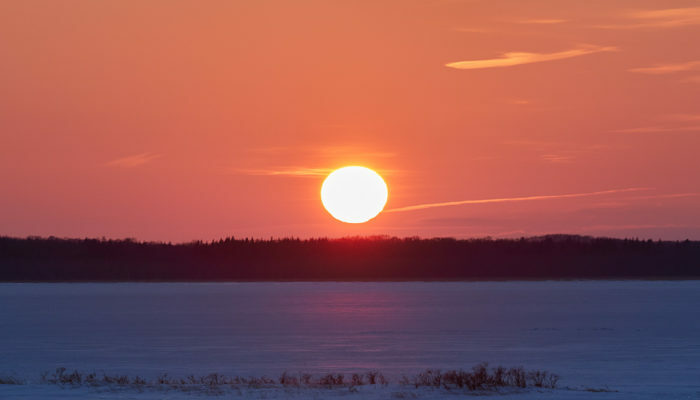 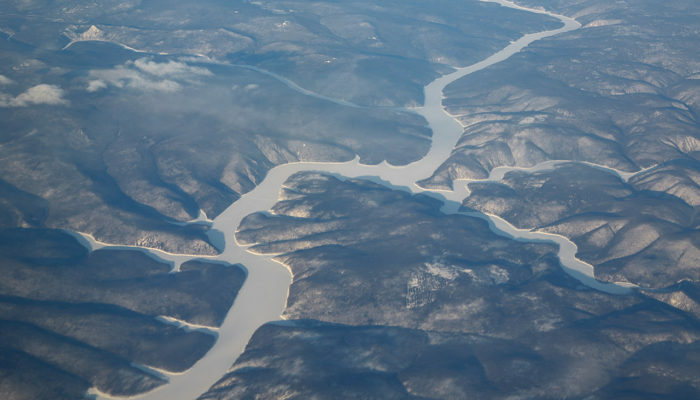 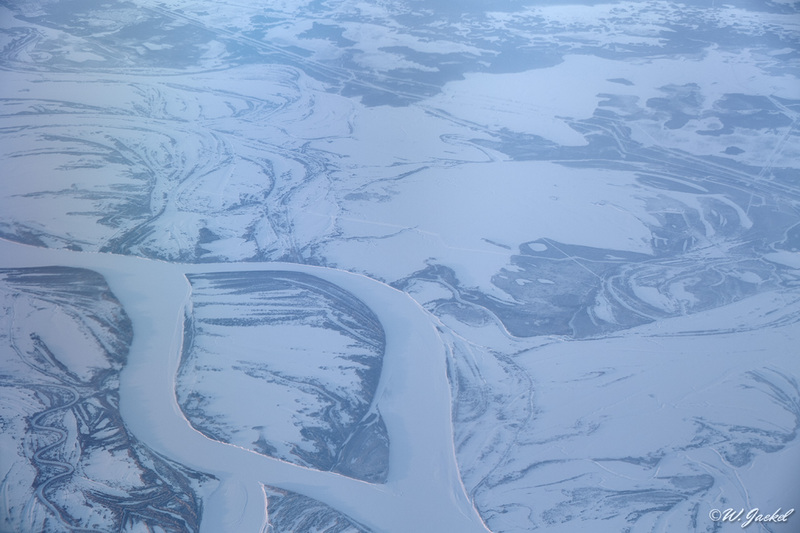 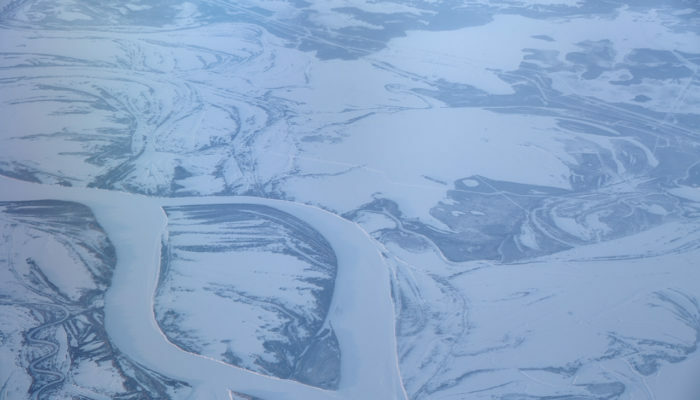 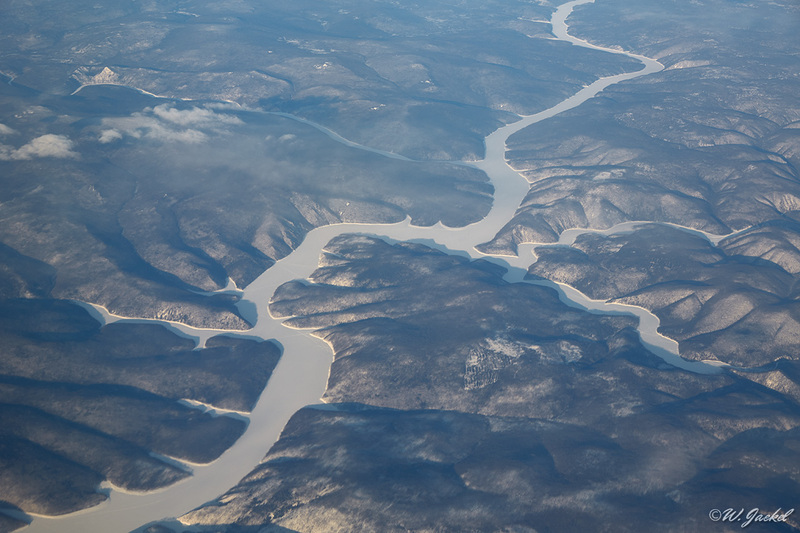 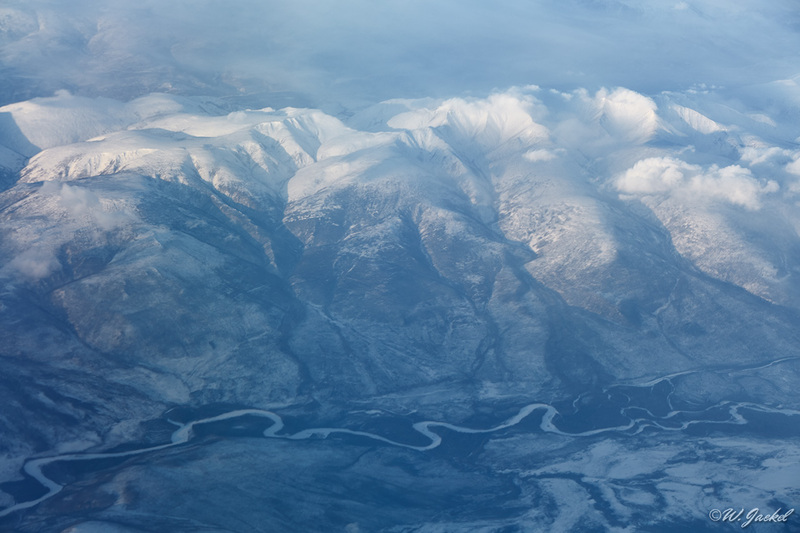 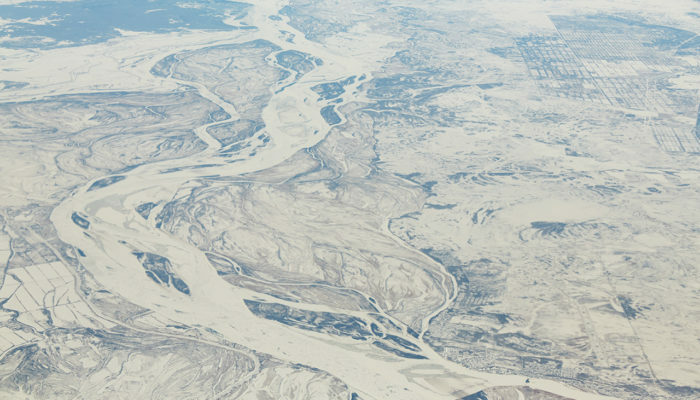 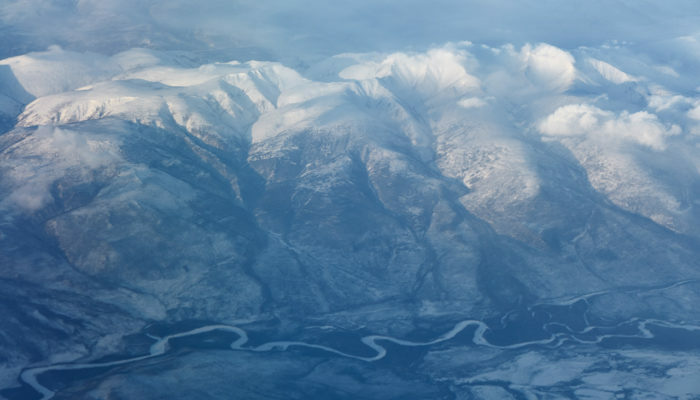 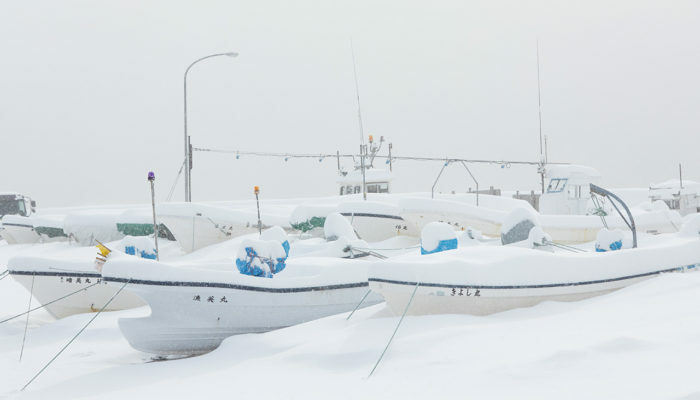 It’s also a pretty harsh environment in winter with snow on the ground for a third of the year. 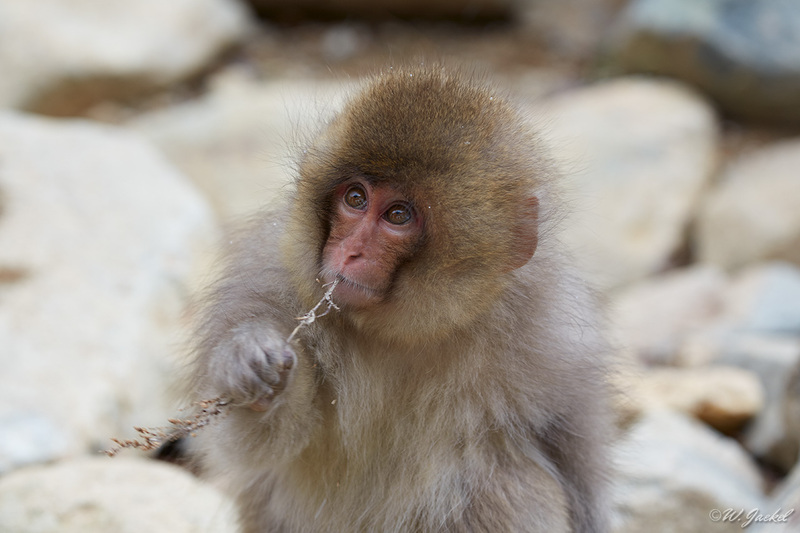 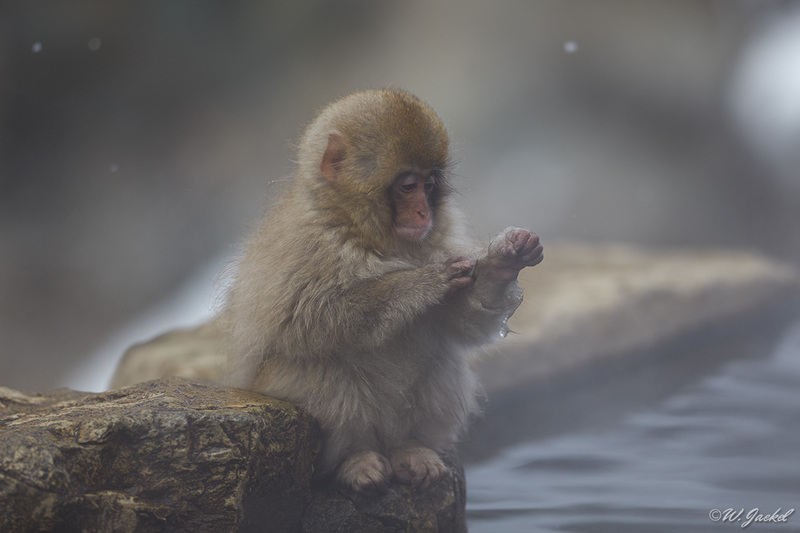 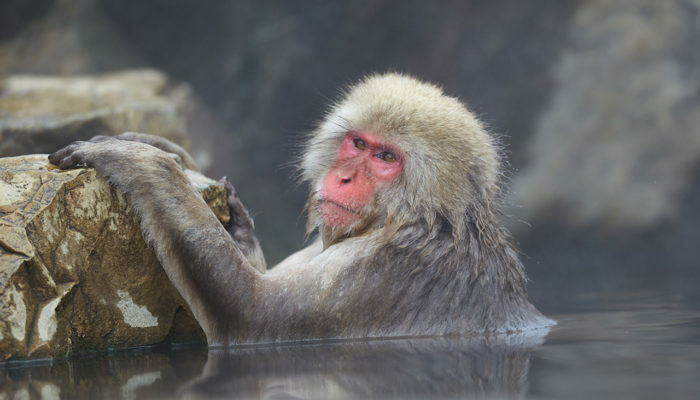 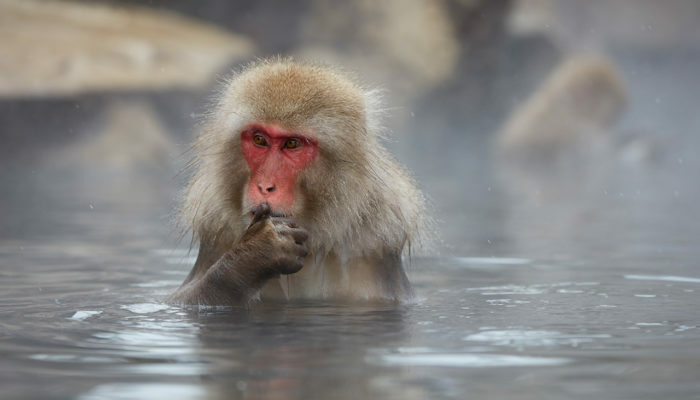 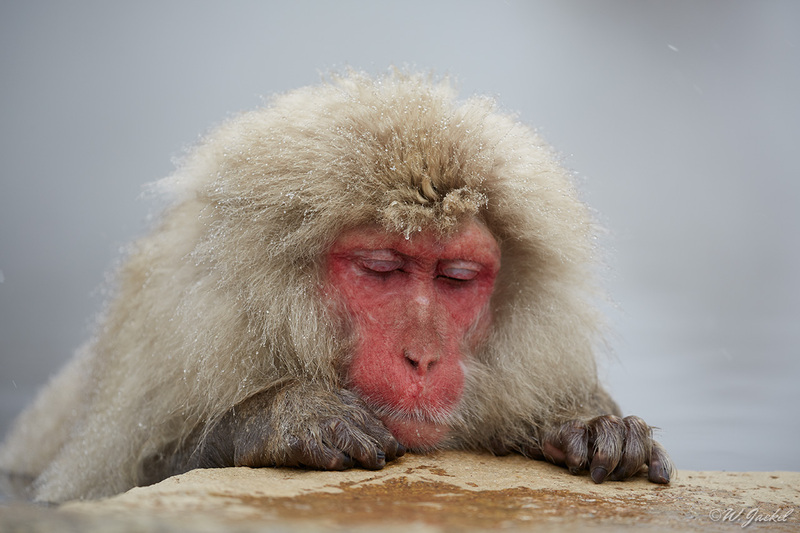 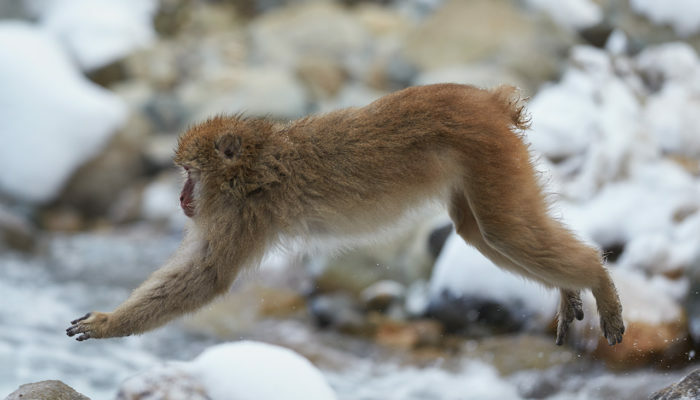 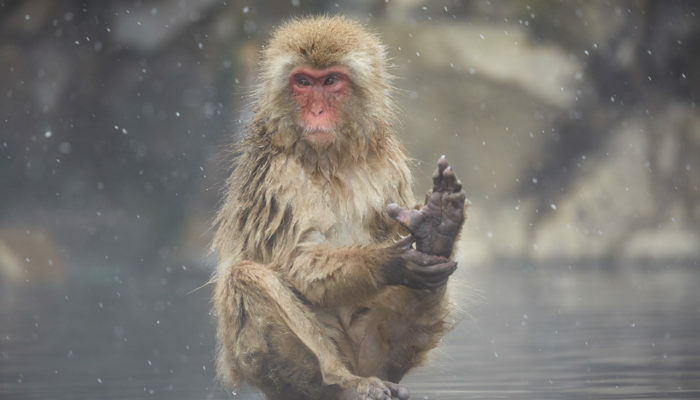 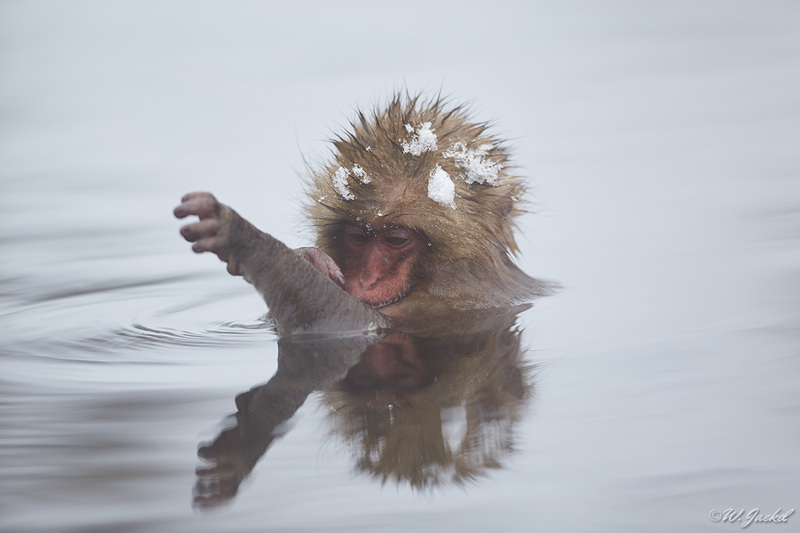 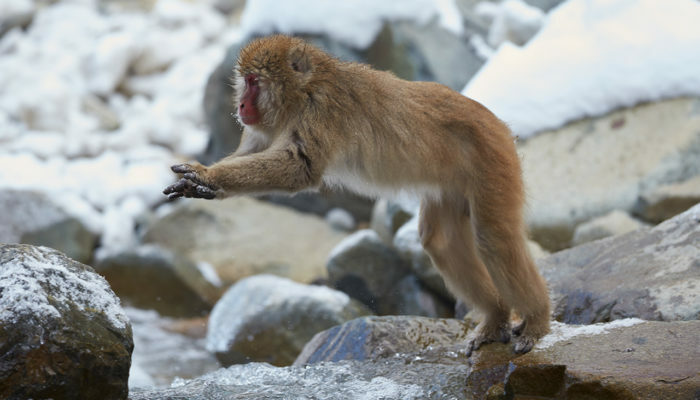 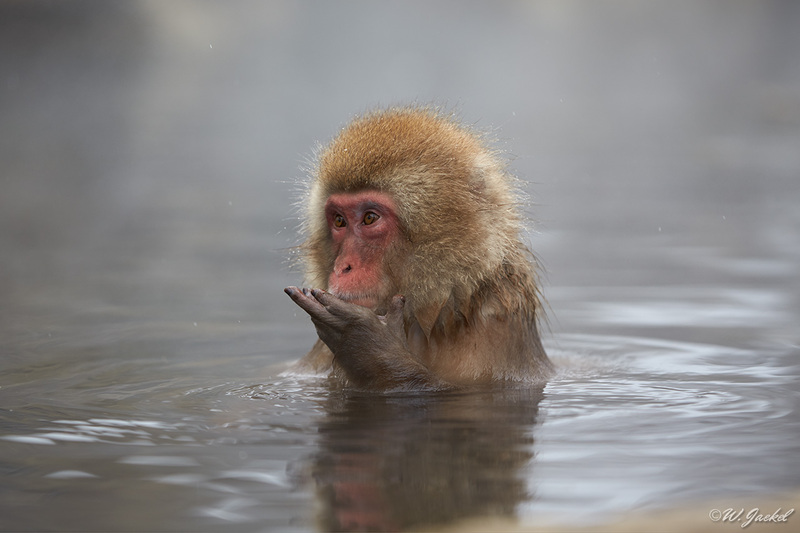 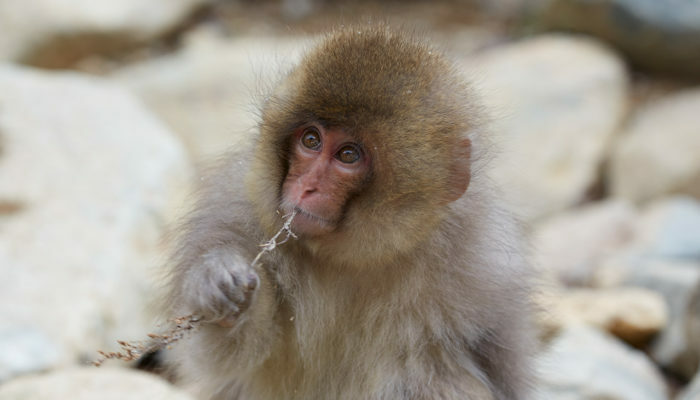 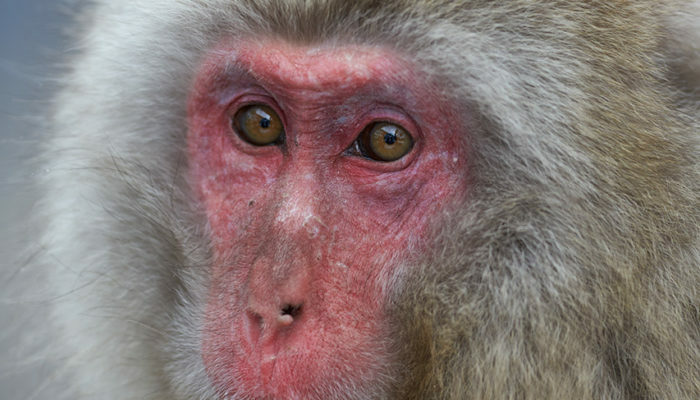 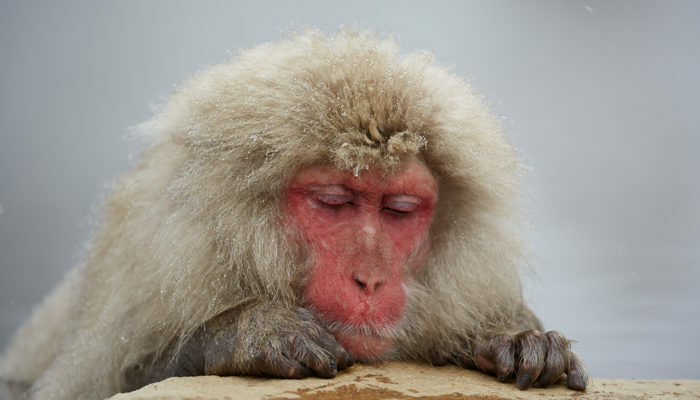 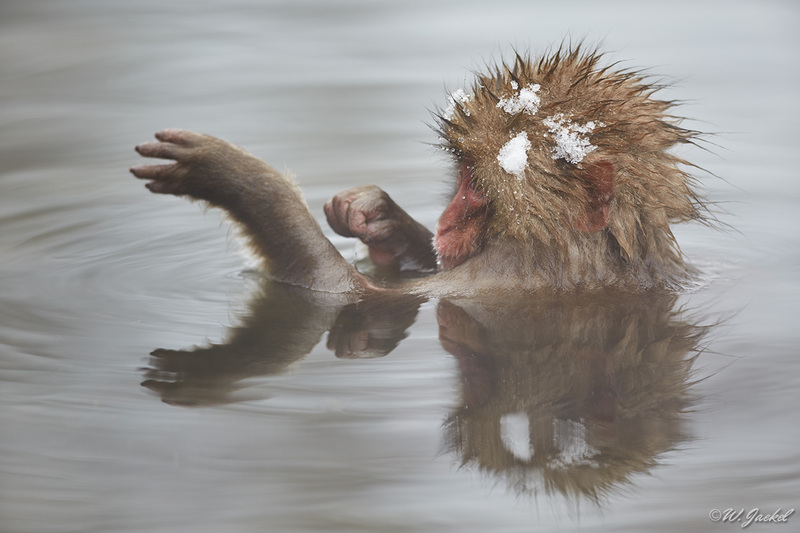 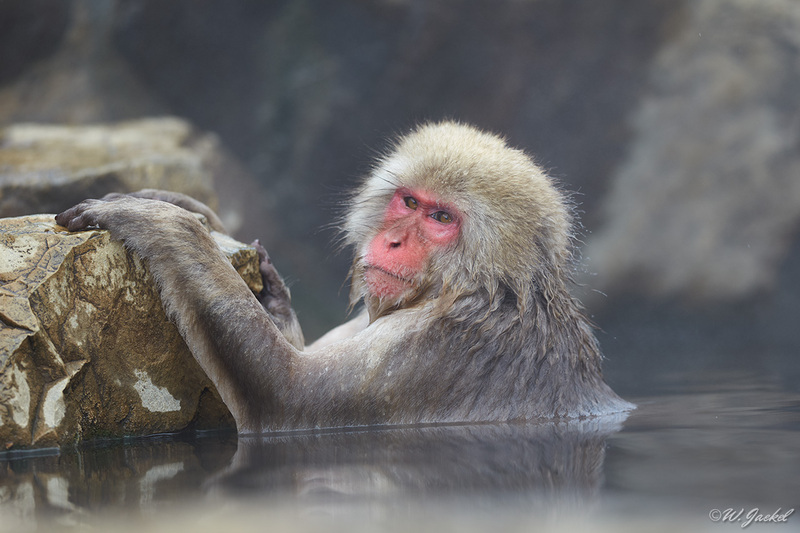 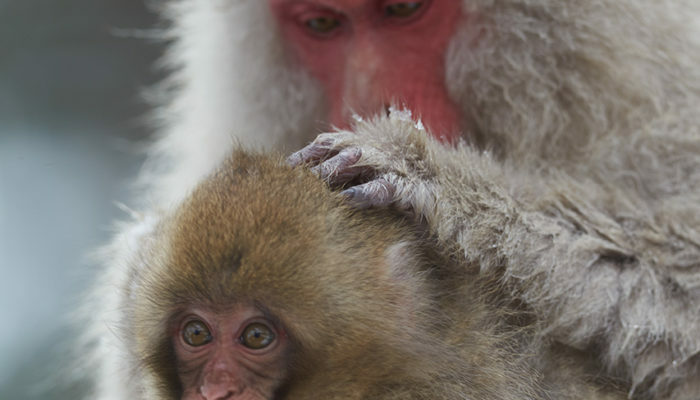 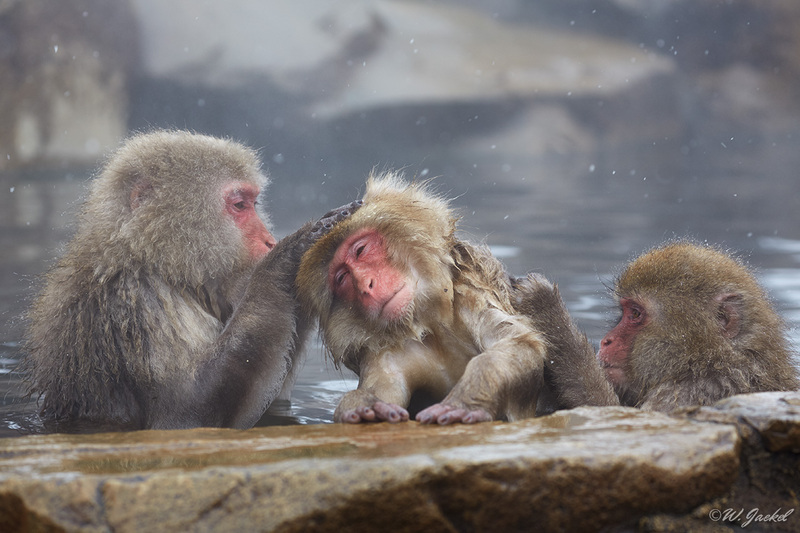 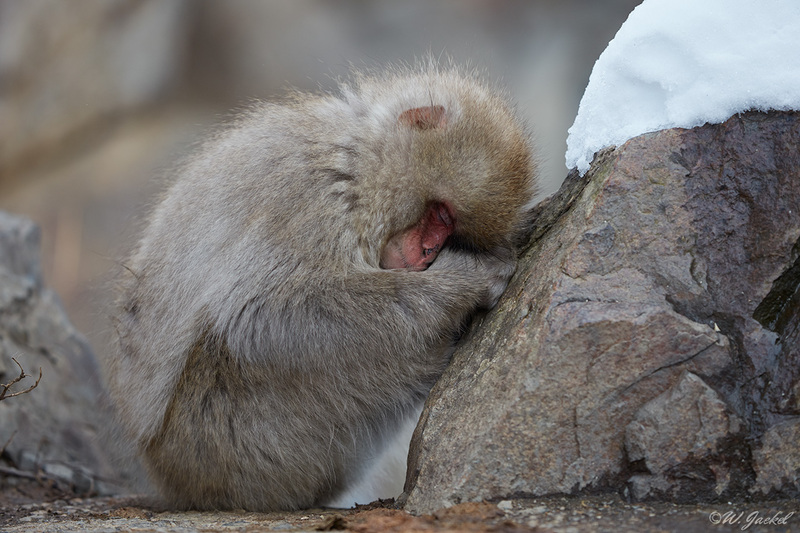 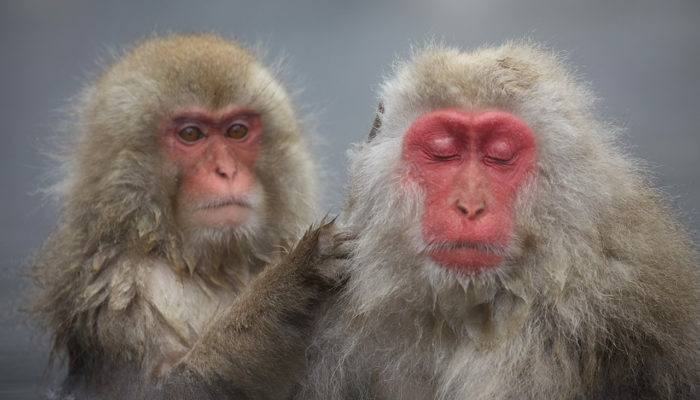 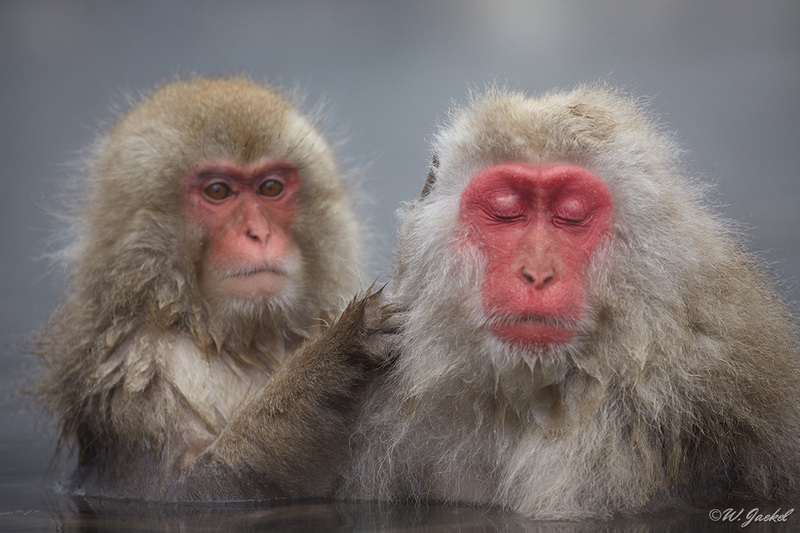 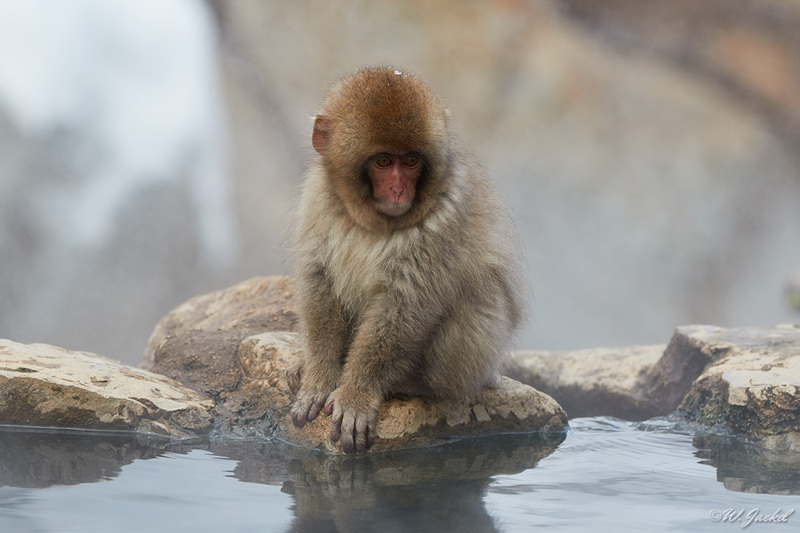 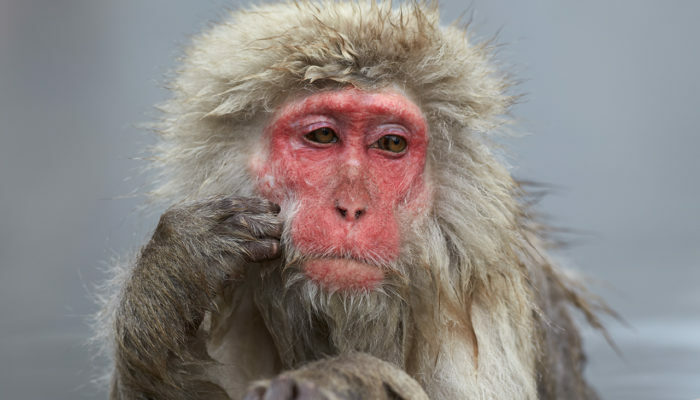 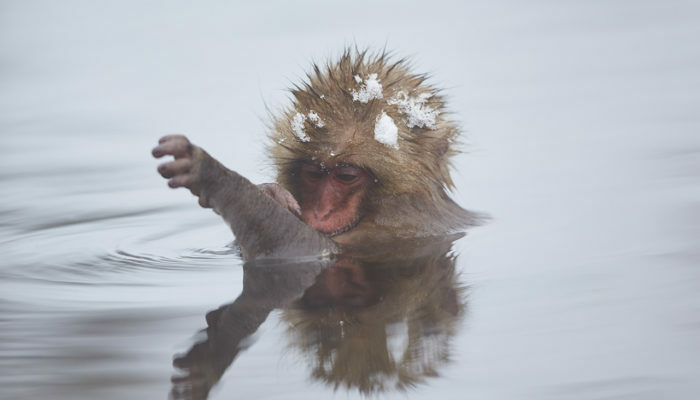 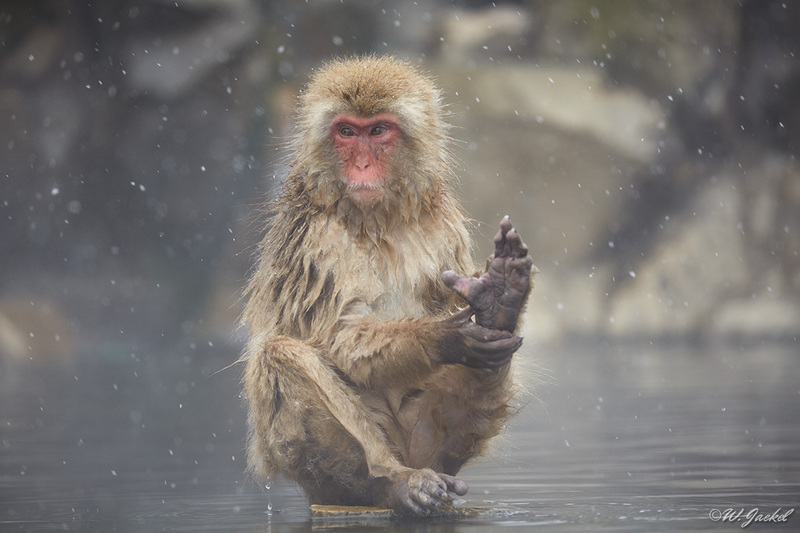 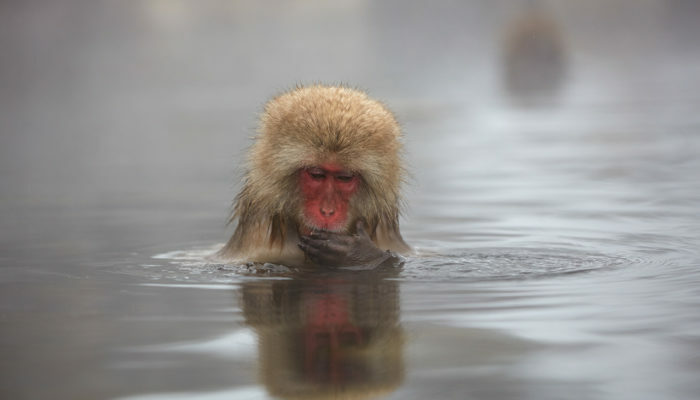 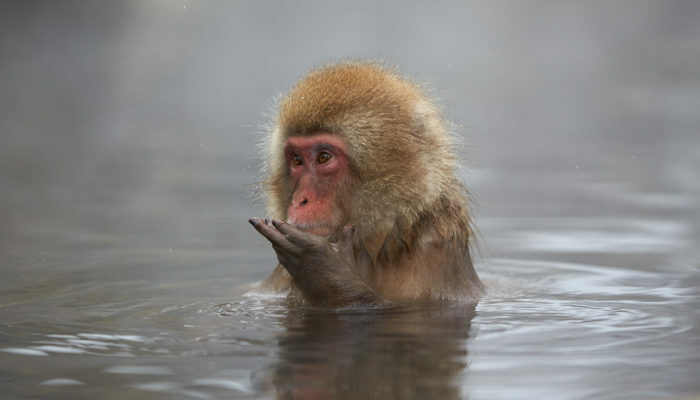 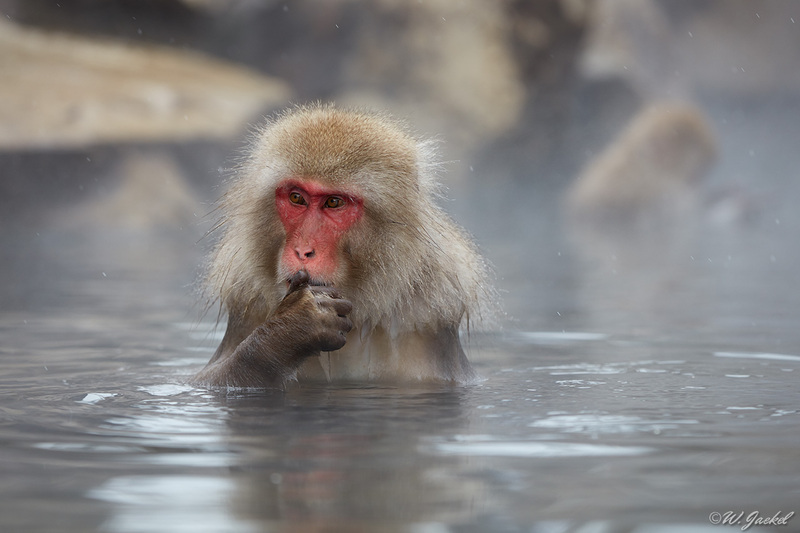 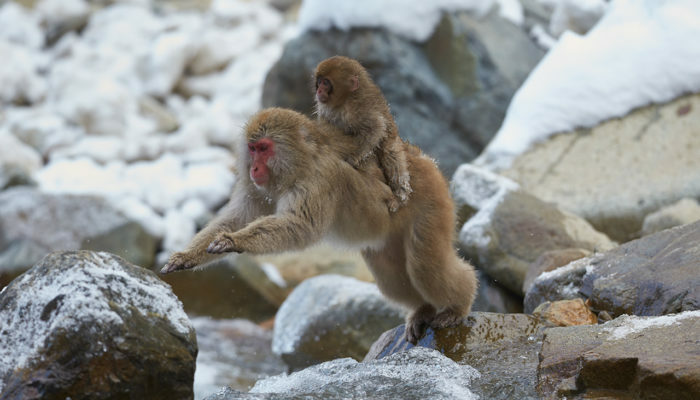 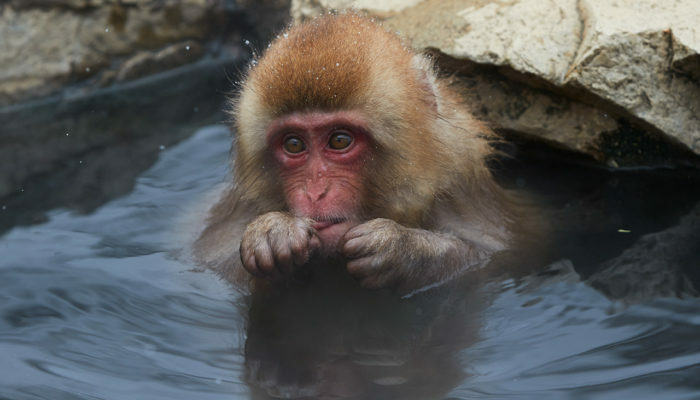 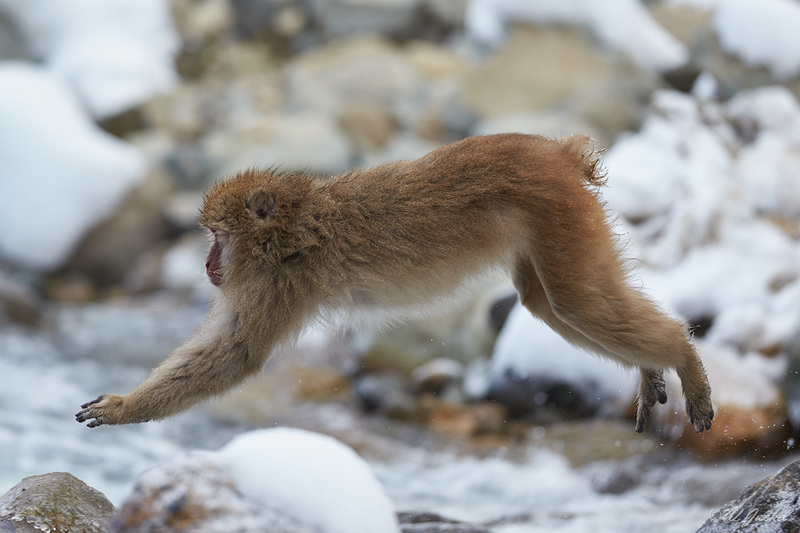 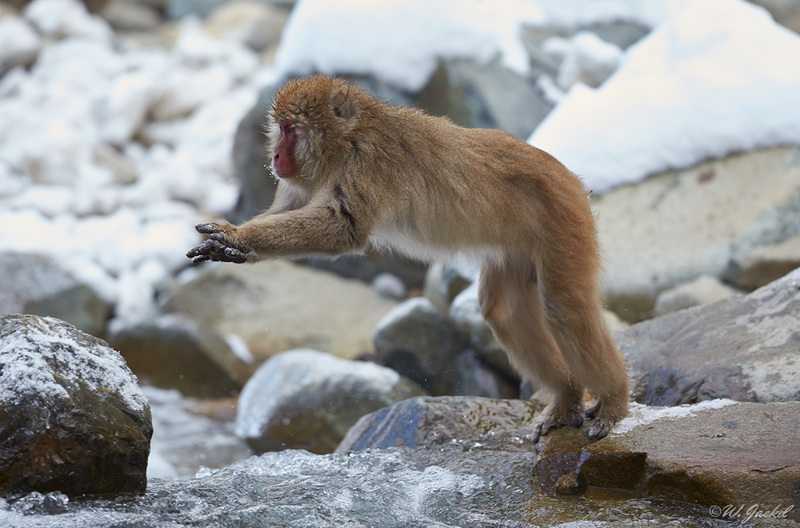 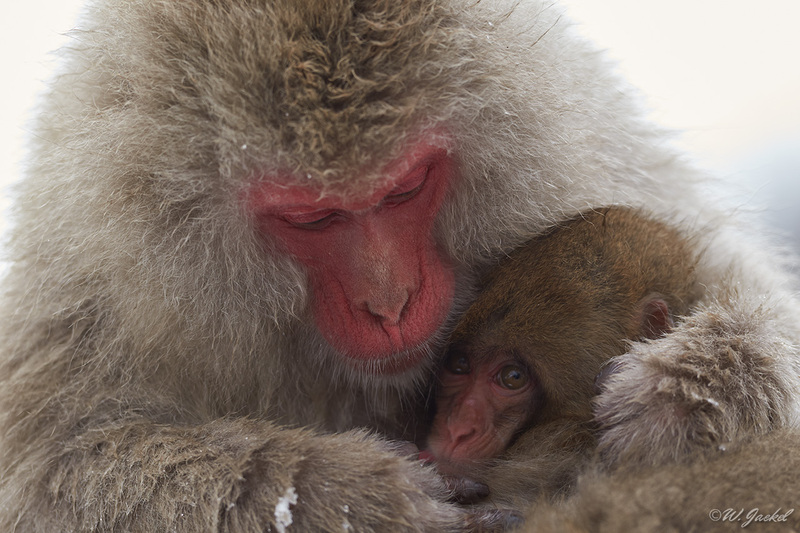 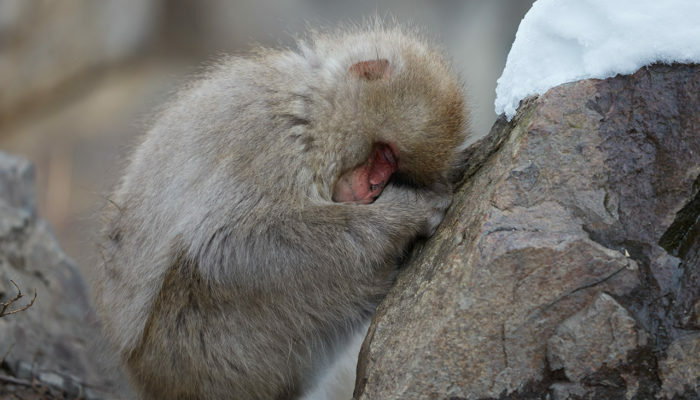 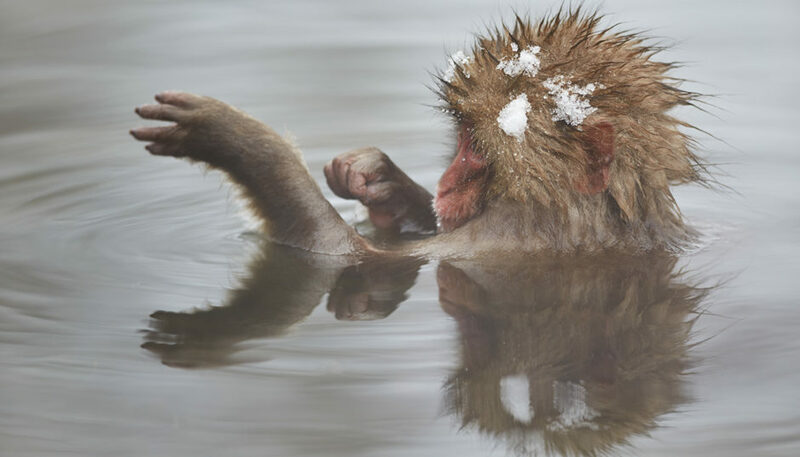 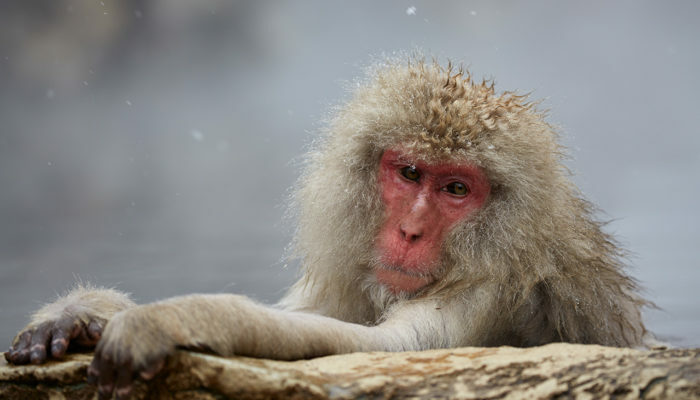 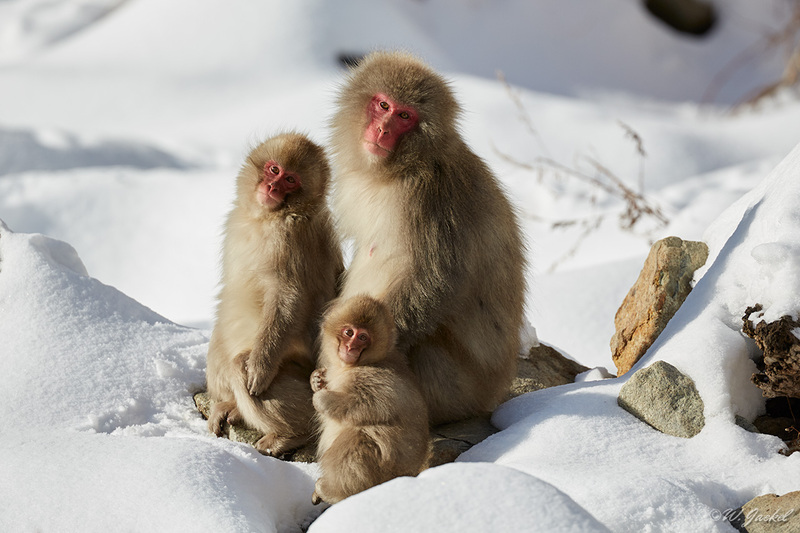 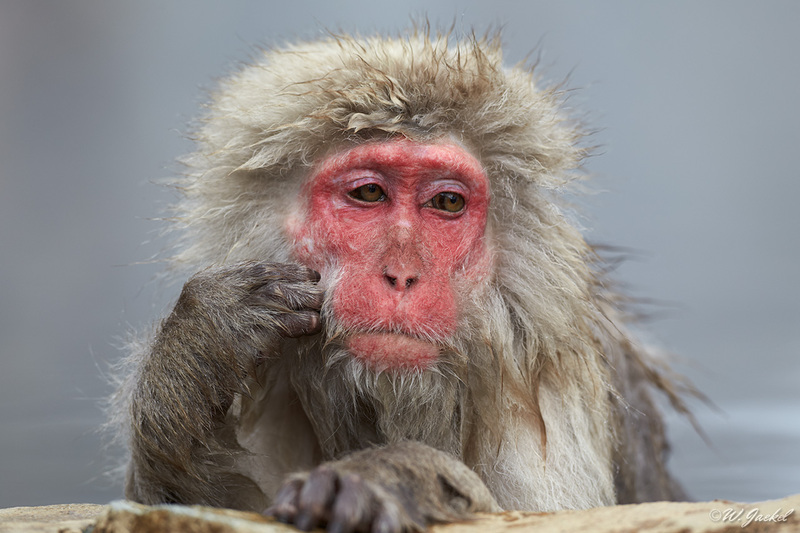 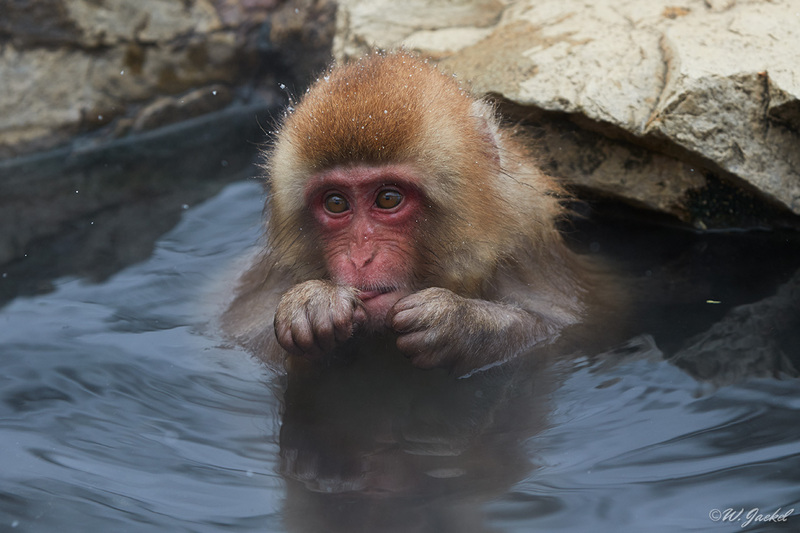 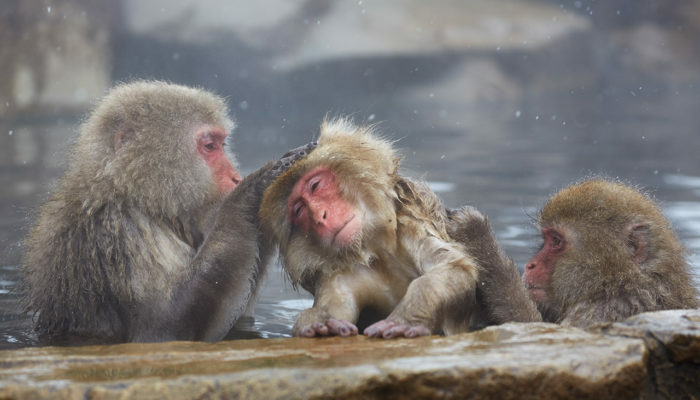 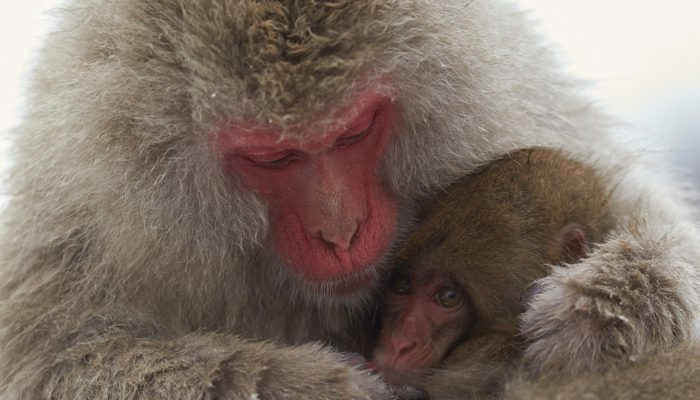 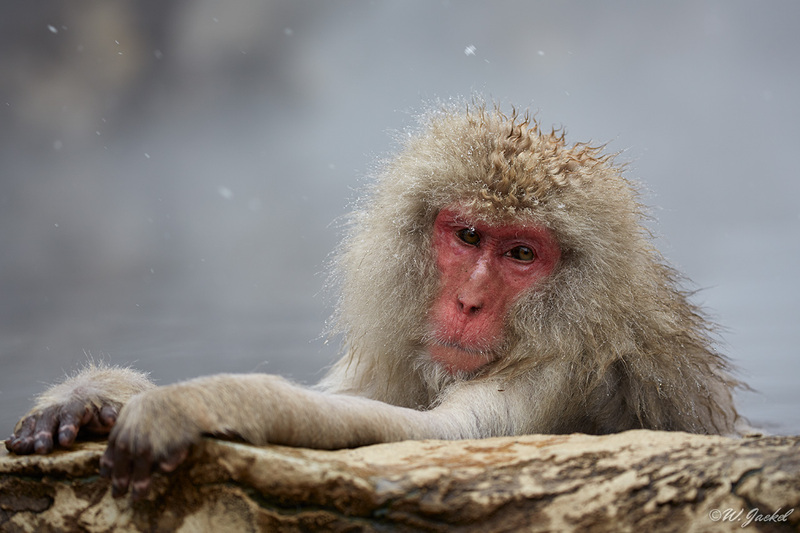 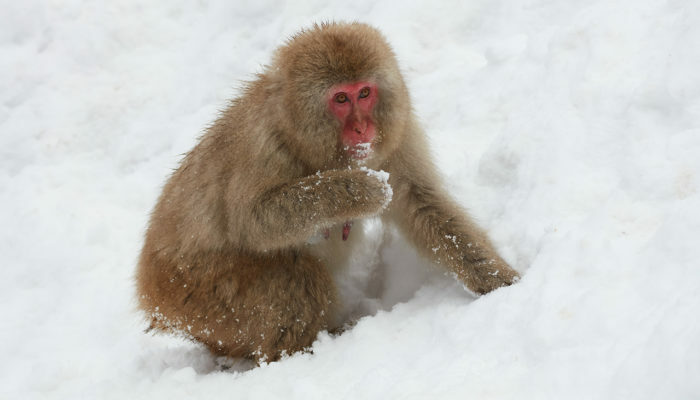 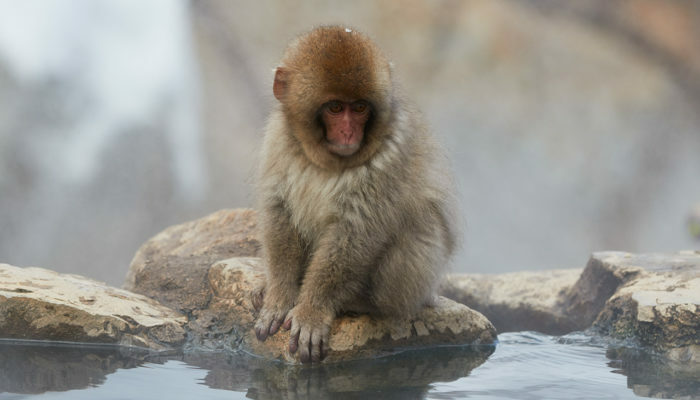 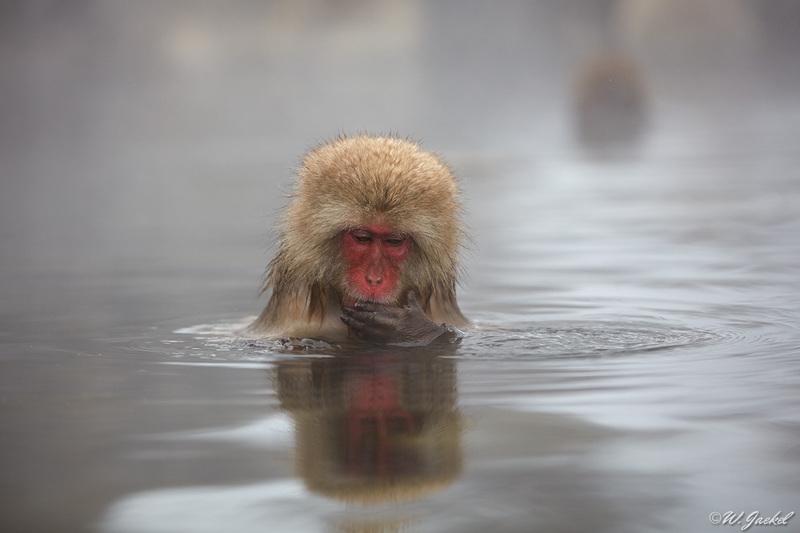 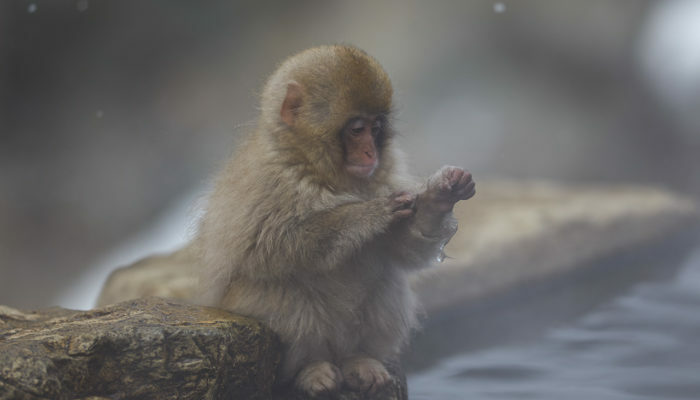 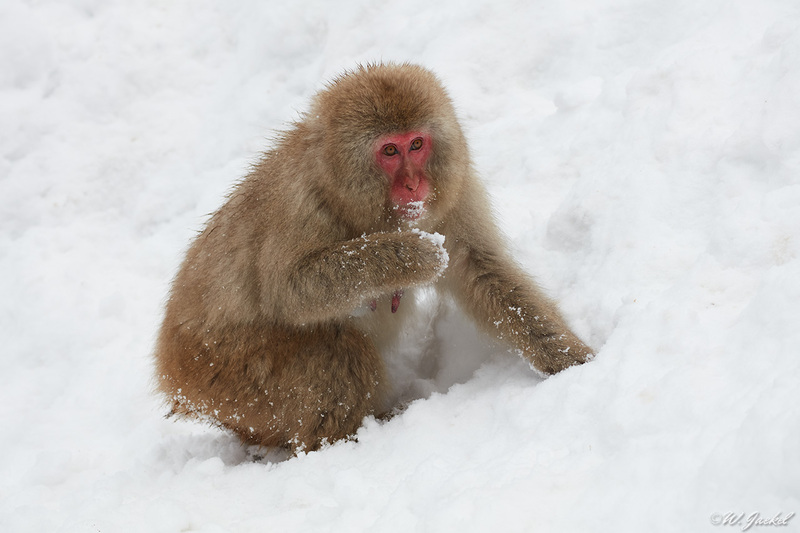 The snow monkeys also known as Japanese Makaques are the most northern-living non-human primates, surviving winter temperatures of below -15 °C . 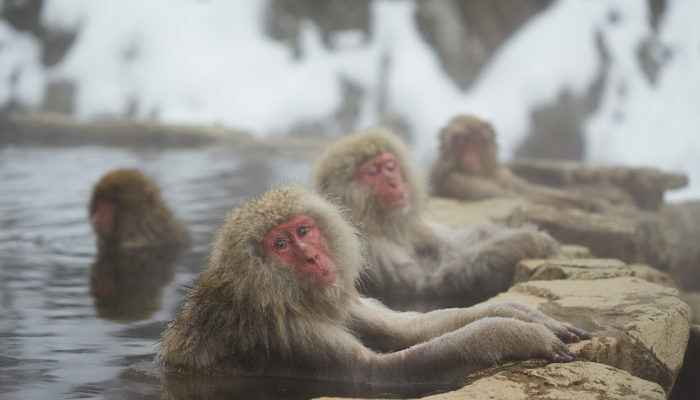 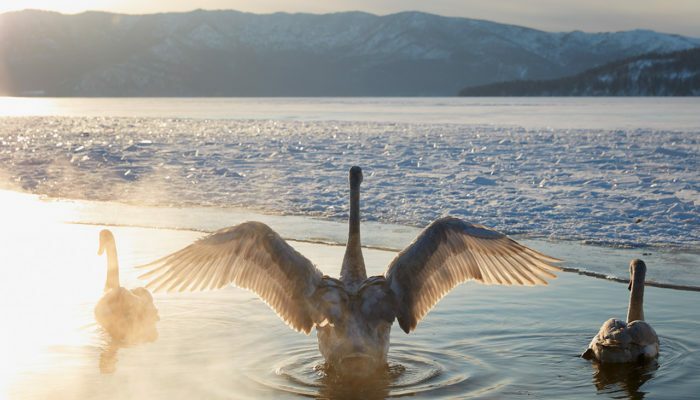 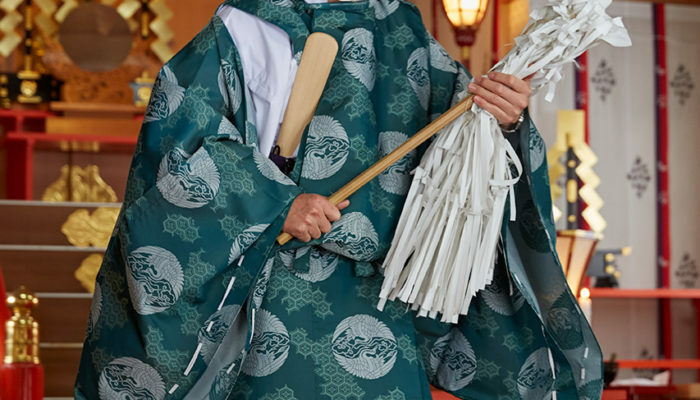 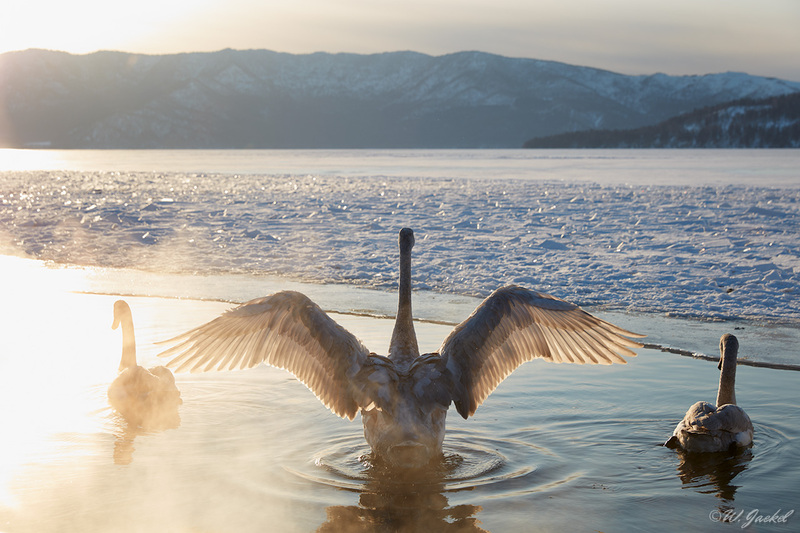 They are world-famous for their habit to bathe in an onsen hot spring. 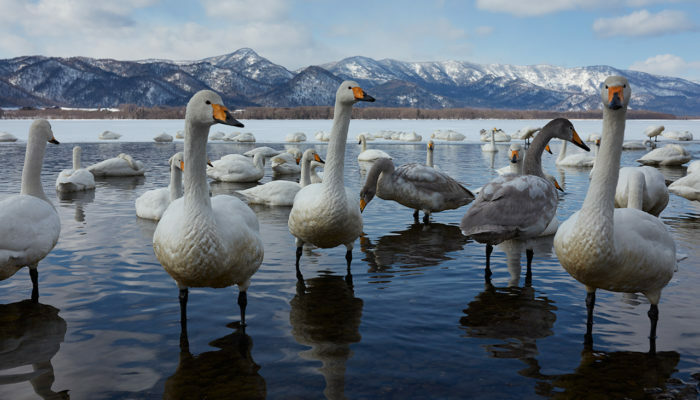 For the most part, I used the 70-200mm/f2.8 II , 100-400mm/f 4.5-5.6 II and 24-70mm/f2.8 II lenses on my FF cameras (Canon EOS 1Dx, 5DsR and 5D Mark III) there. 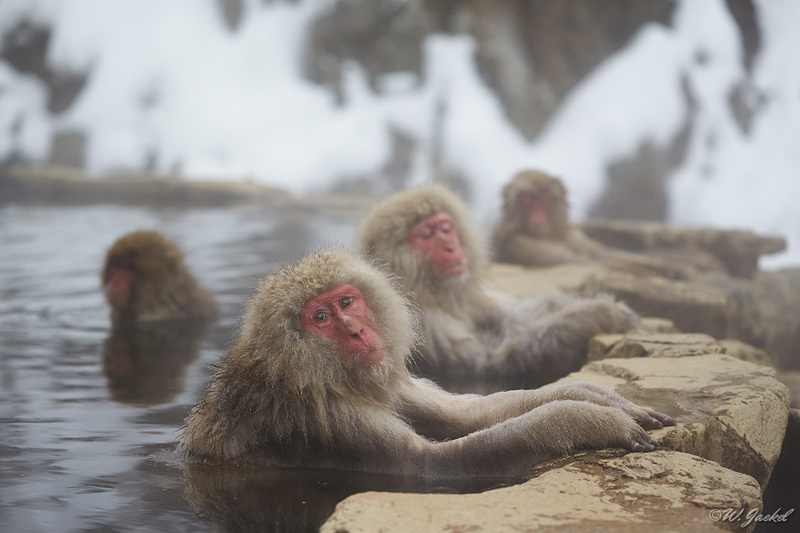 After 3 days of watching and photographing the monkeys chilling out in the hot spring water and playing or huddling together in the surroundings with their facial expressions so human-like , we took the airplane from Tokio to the northern island of Hokkaido to visit the Kushiro area on the Shirotoko peninsula for the Japanese Red-crowned Cranes. 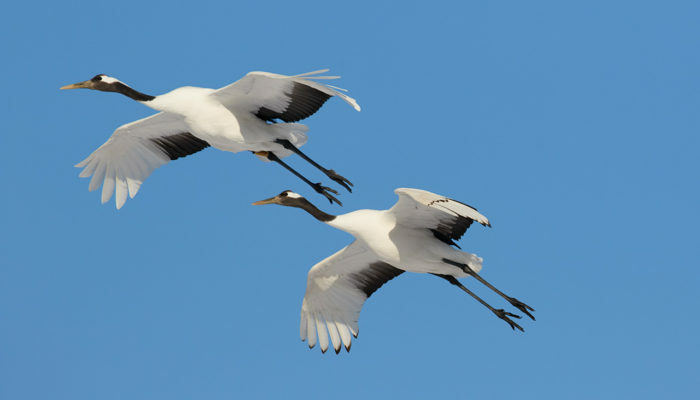 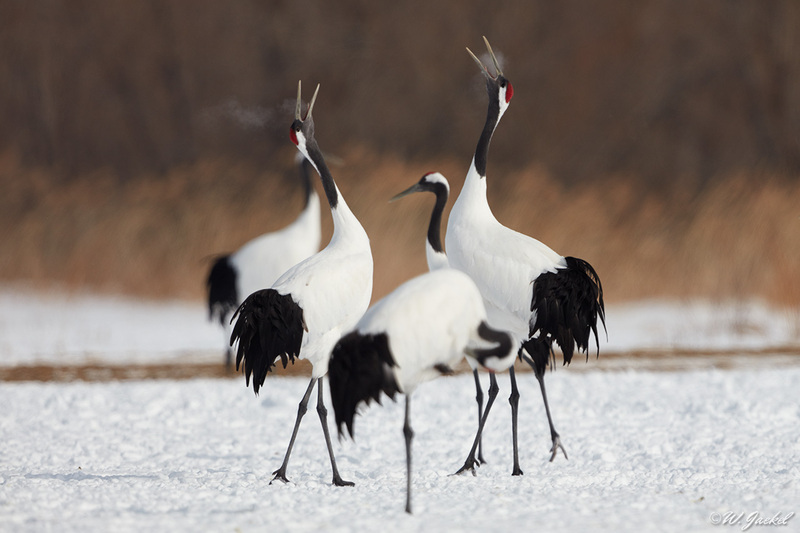 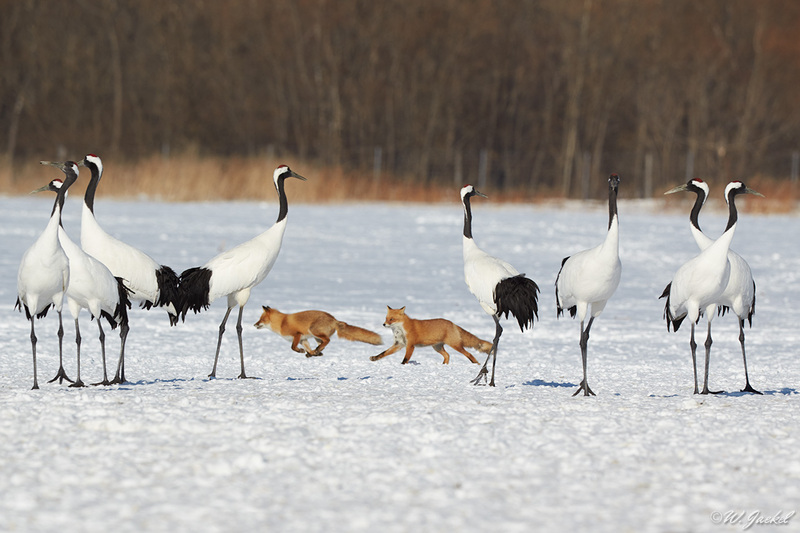 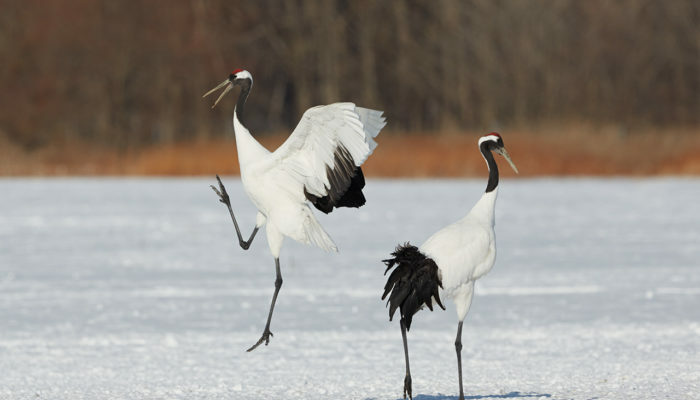 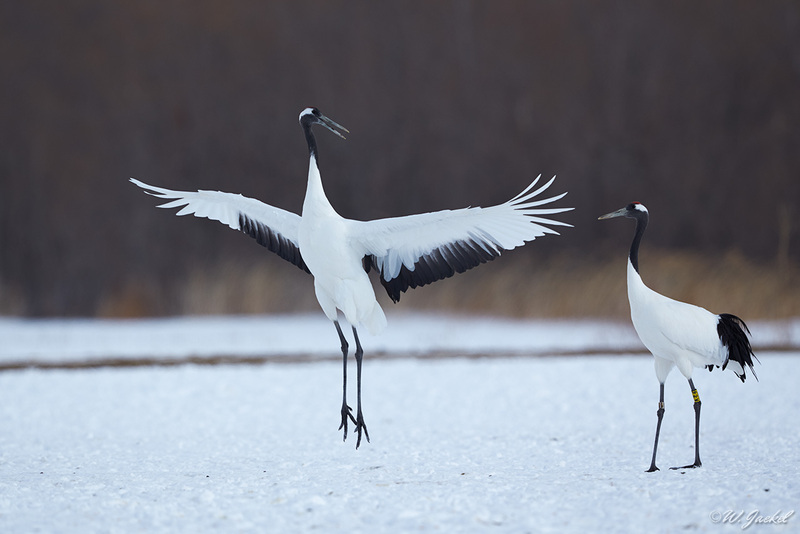 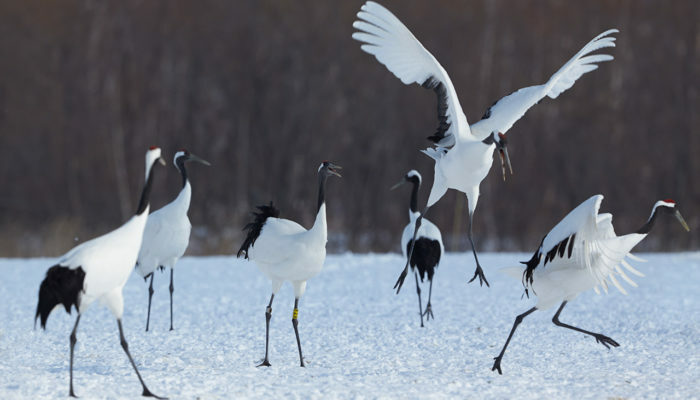 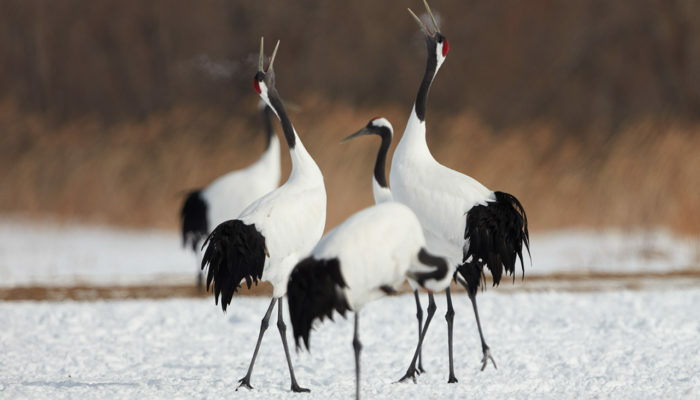 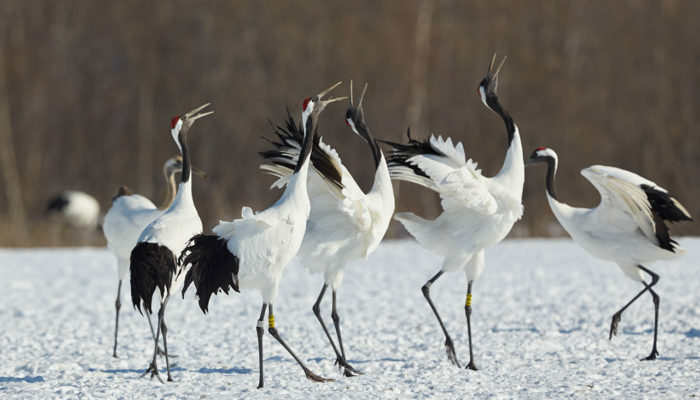 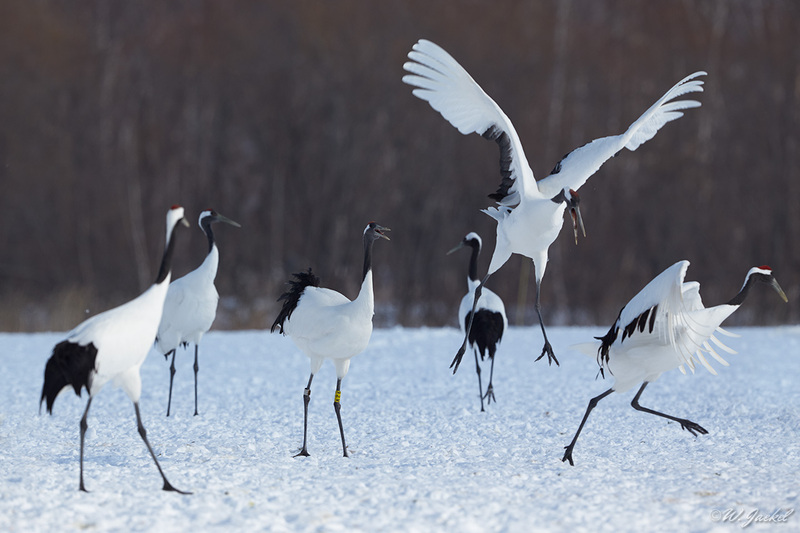 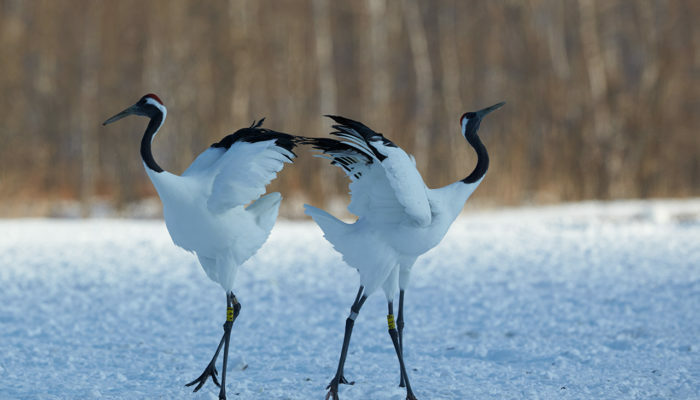 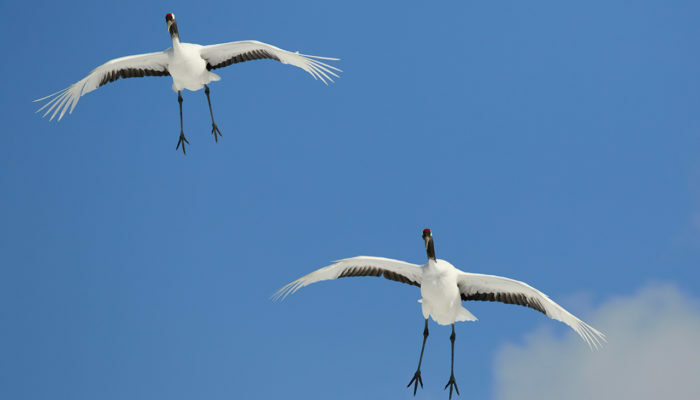 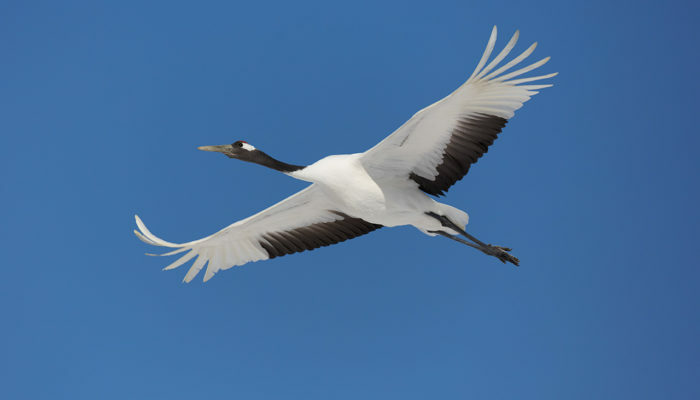 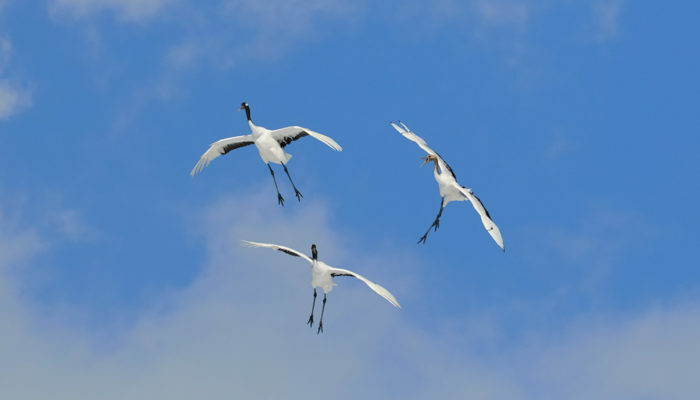 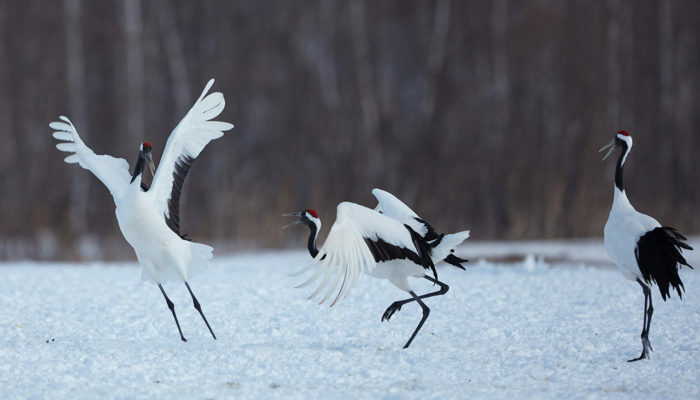 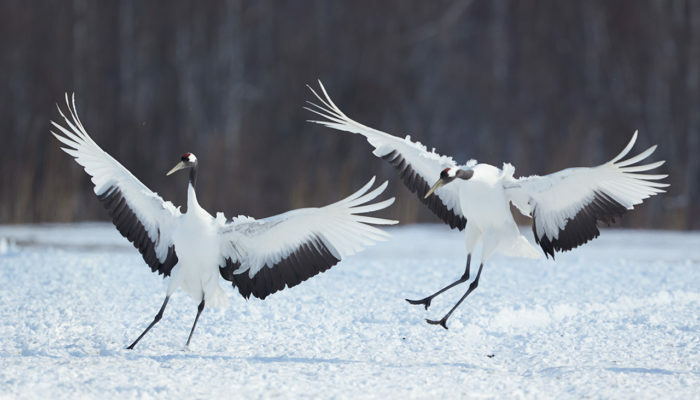 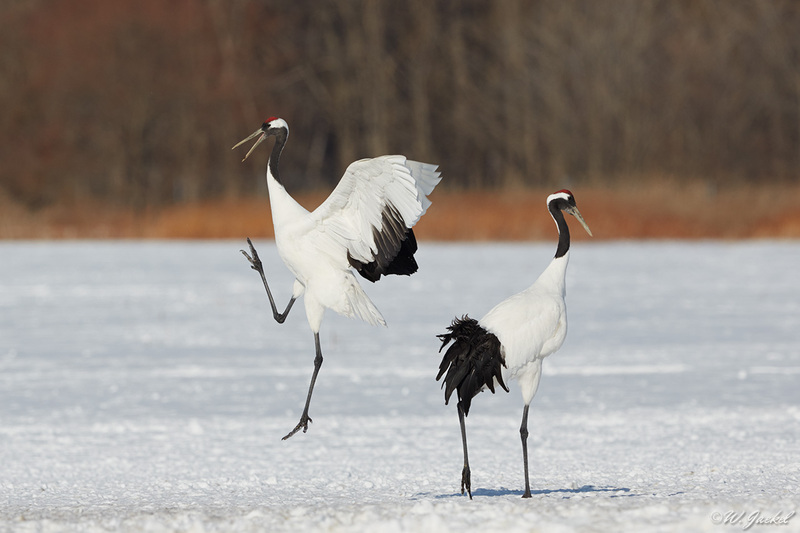 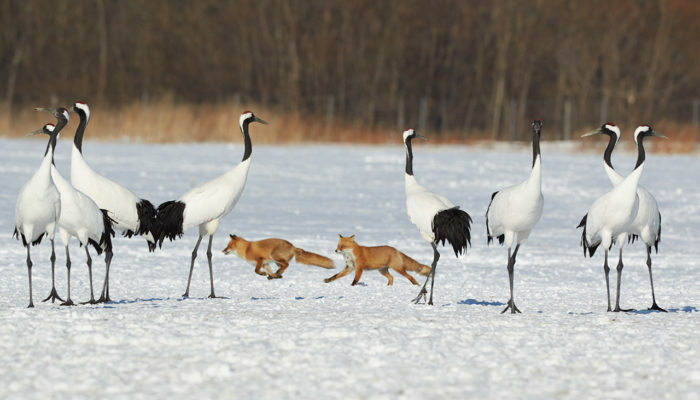 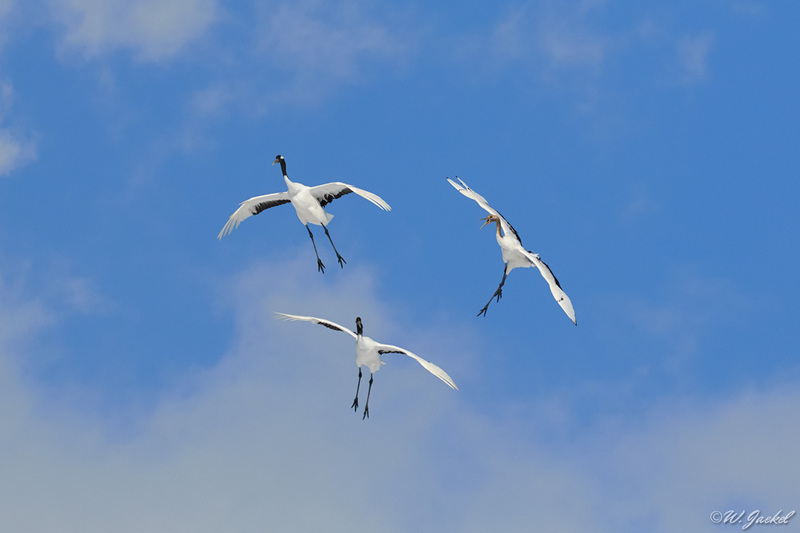 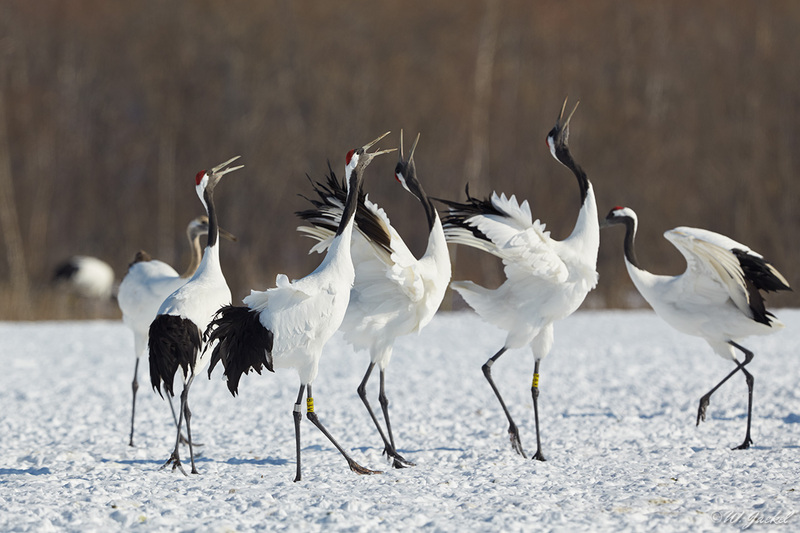 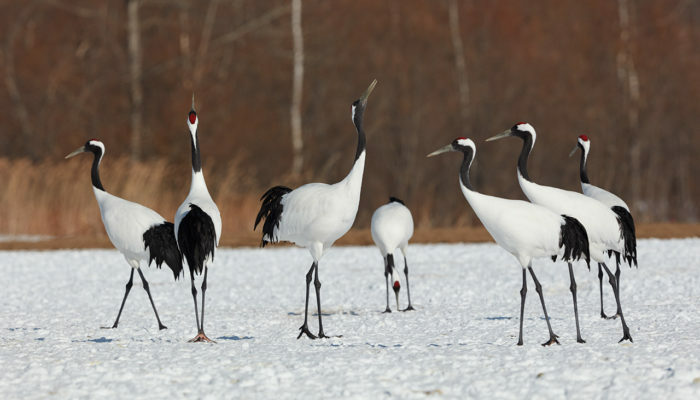 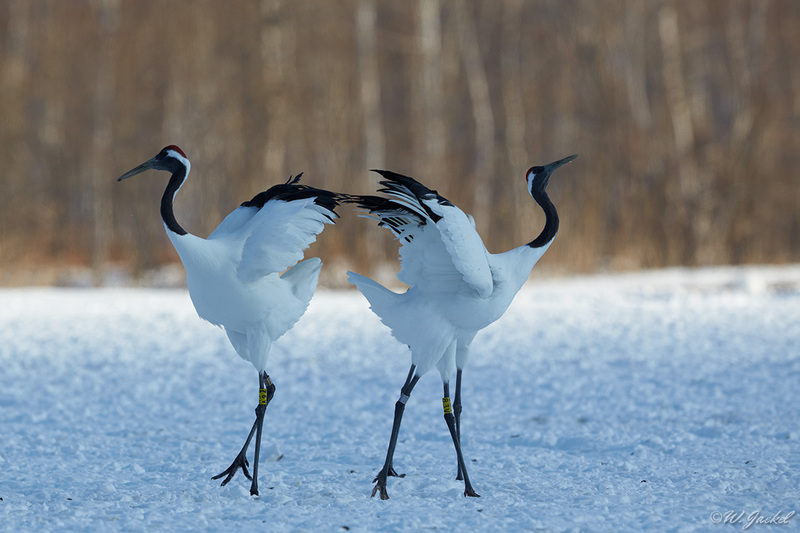 The International Akan Crane Center is a very popular place to watch the cranes as they dance, often in pairs, with seemingly choreographed dips and jumps and interacting with foxes and raptors. 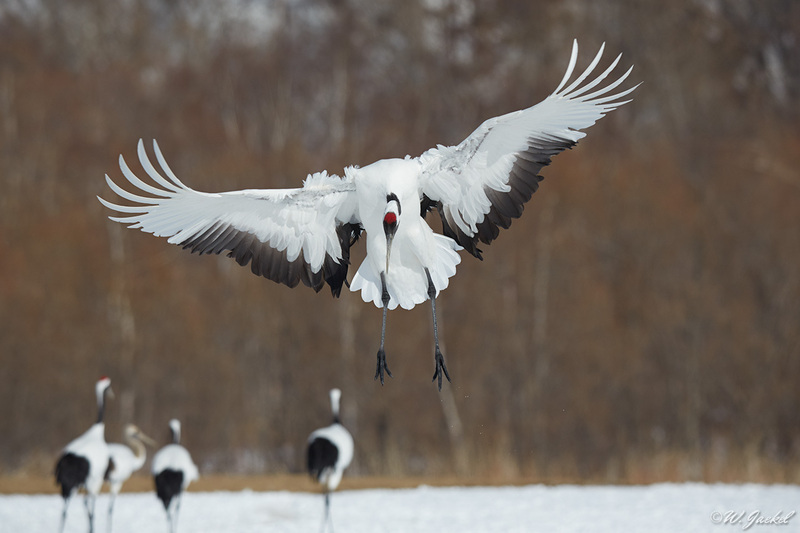 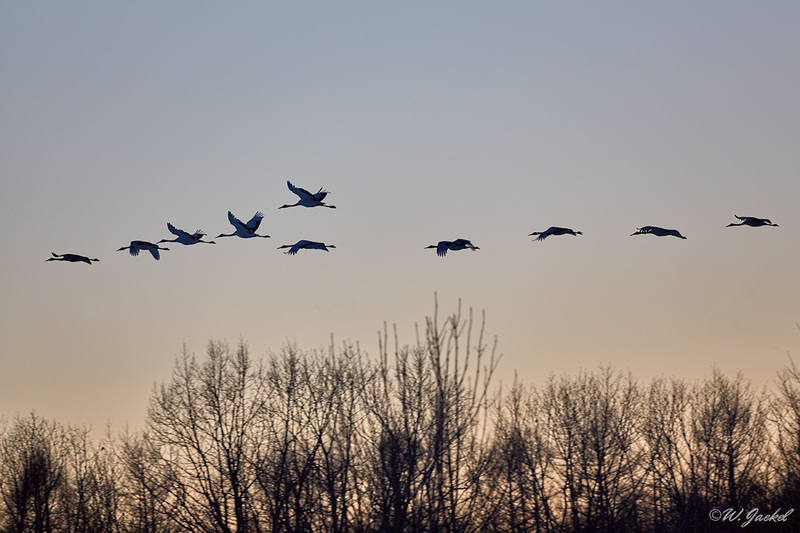 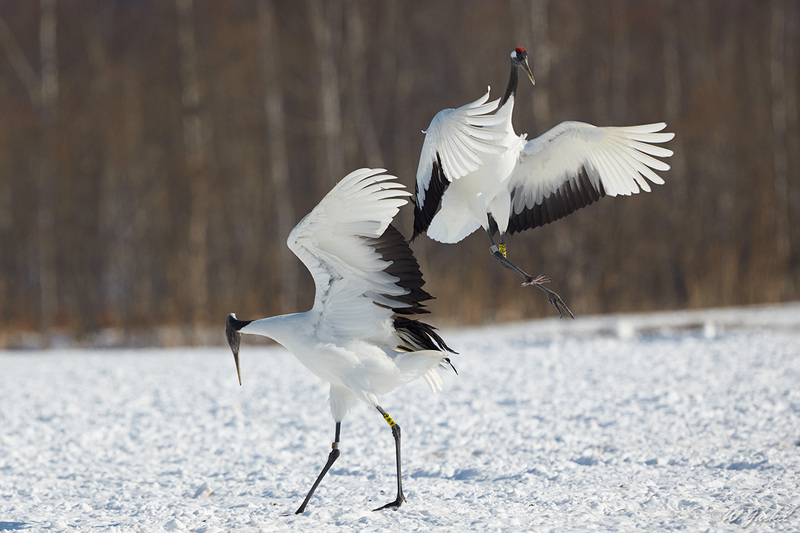 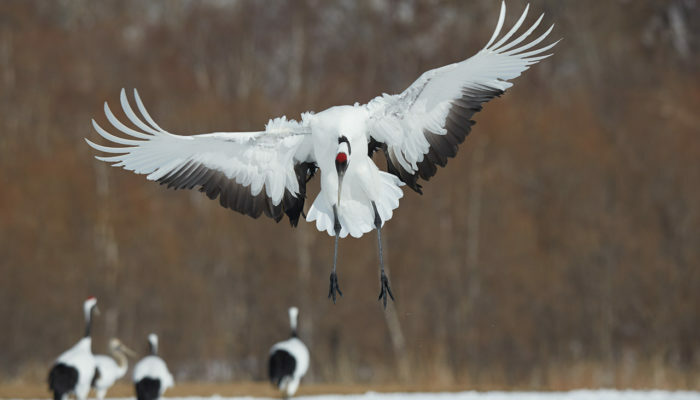 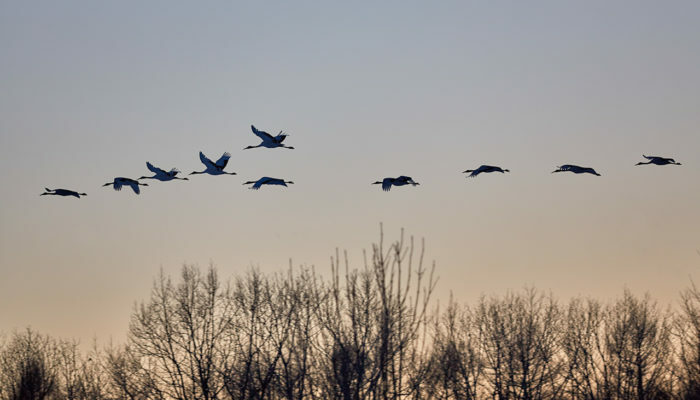 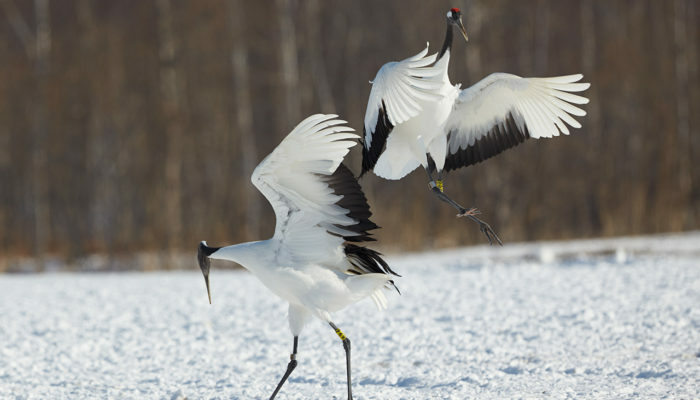 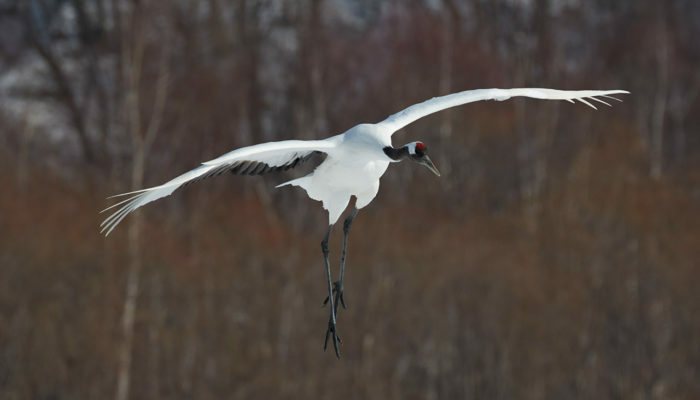 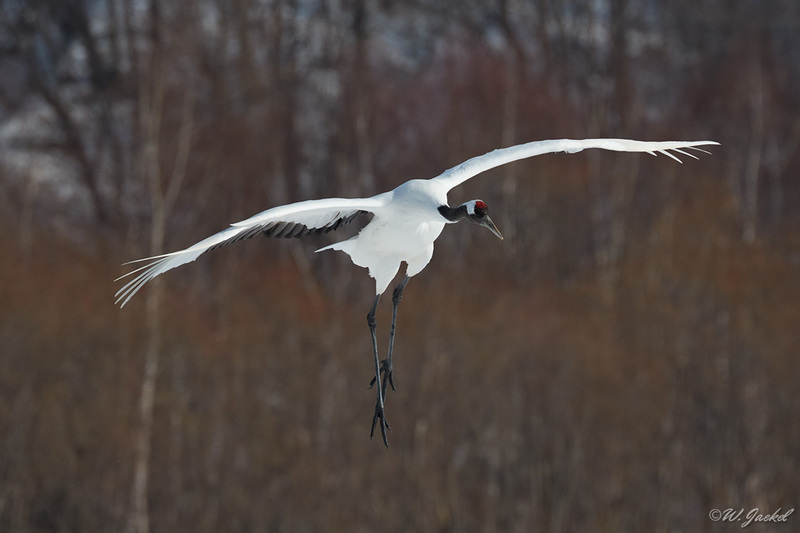 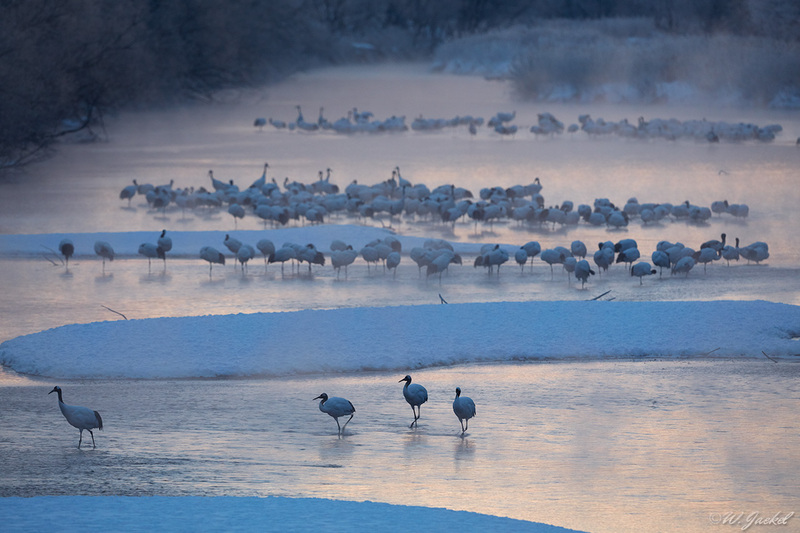 Overall the number of cranes was down this year due to the unusually mild winter, but the photographic opportunities were still very good – apart from the fact that there was no snow on the trees in the background which would have made up for a better scenery. 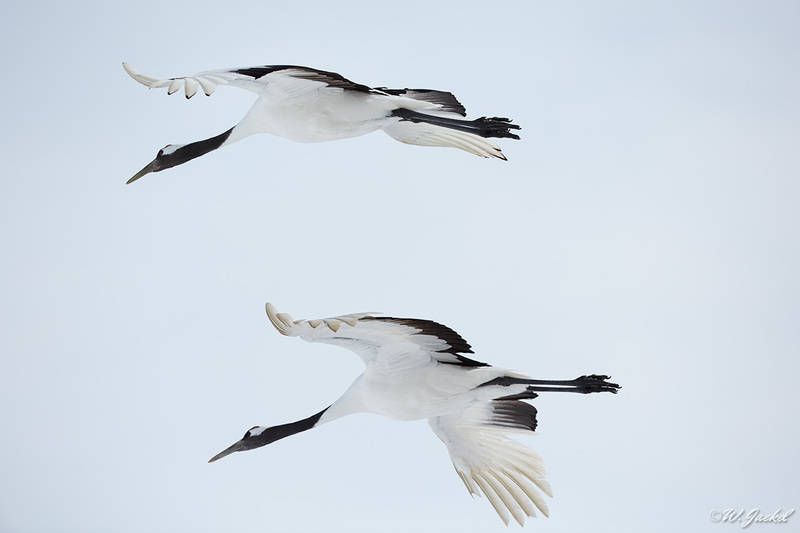 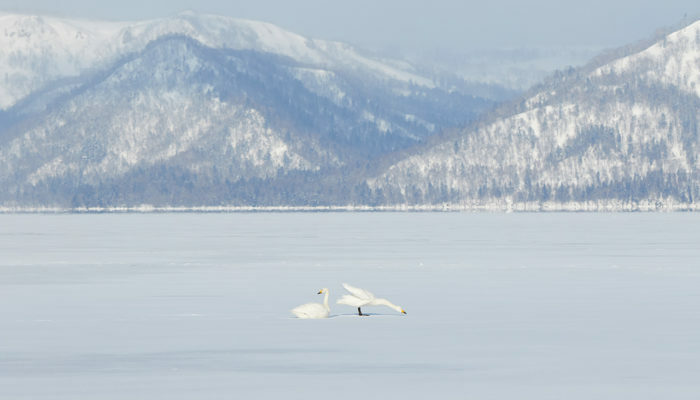 Anyway, most photographs had to be captured with the 600mm/f 4.0 II IS and 200-400mm/f4 +1,4Ext lenses due to the distance of the birds. 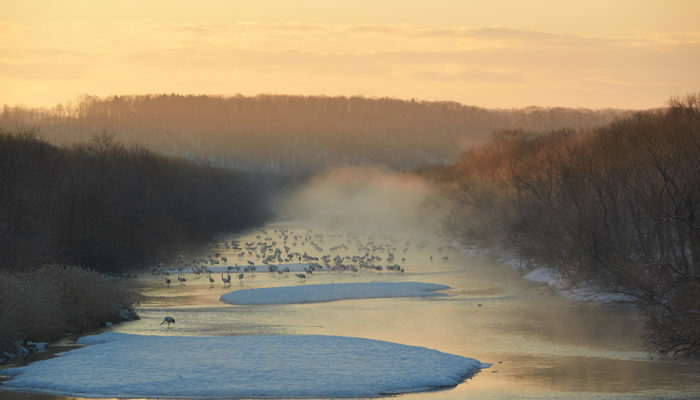 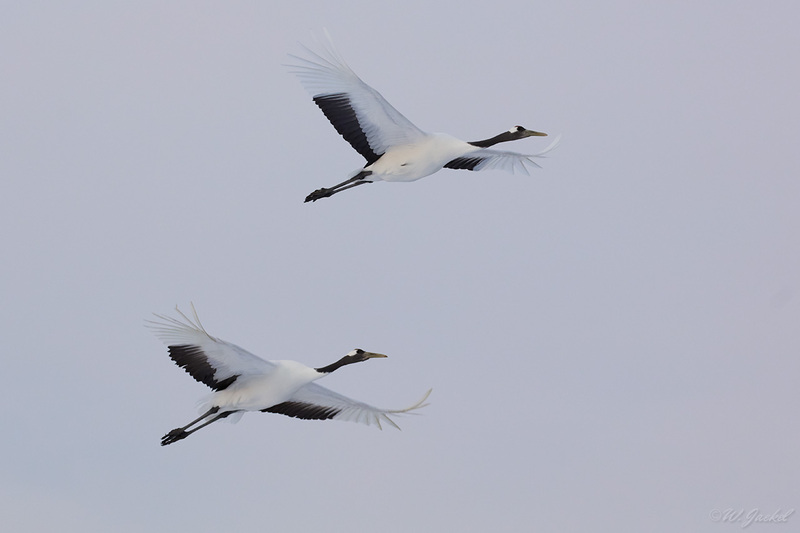 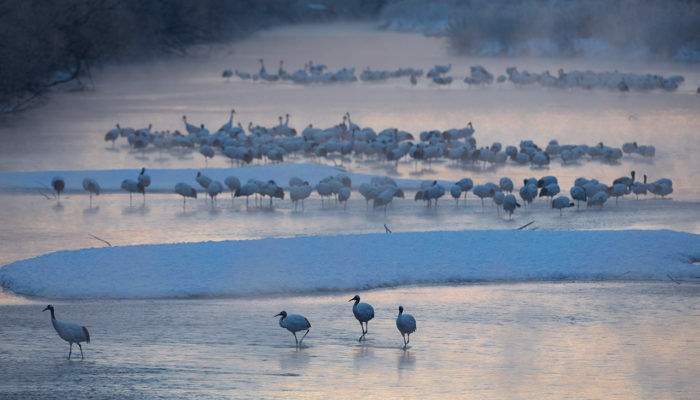 Another highlight nearby for viewing and photographing the cranes is the Otowa-Bashi (“Sound of Wings” )Bridge over the Setsuri-gawa river which runs in Tsurui Village. 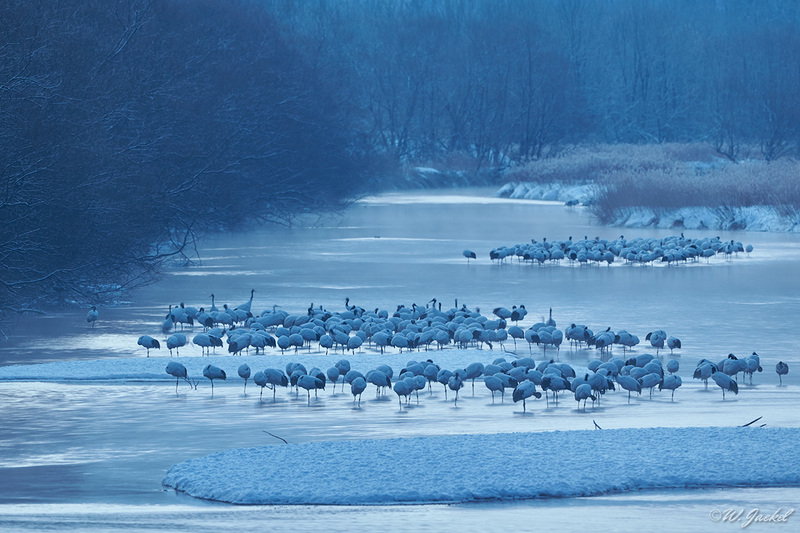 In winter the cranes come here at night to roost in the relative safety and warmth that the river provides. 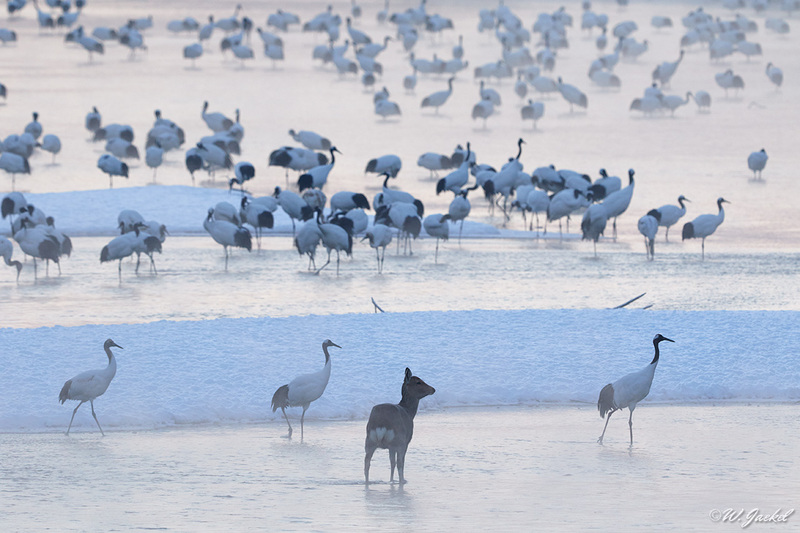 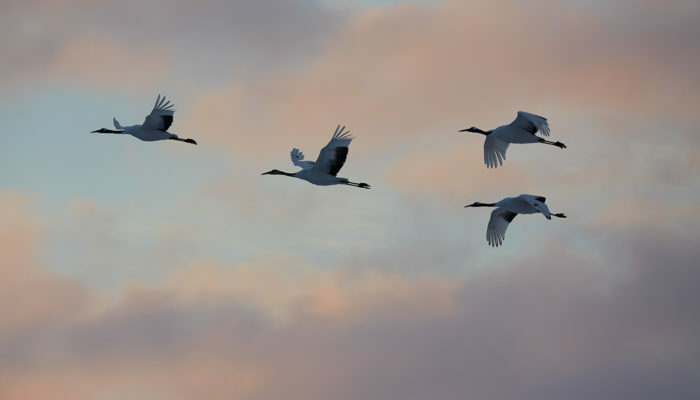 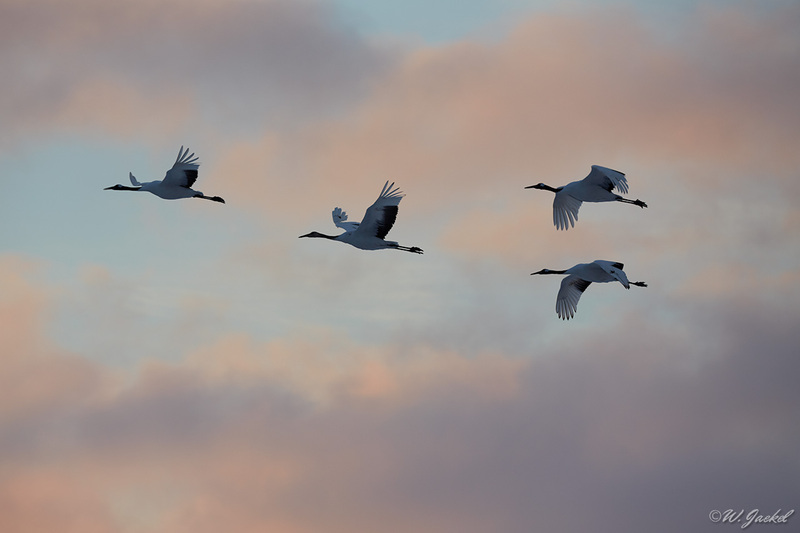 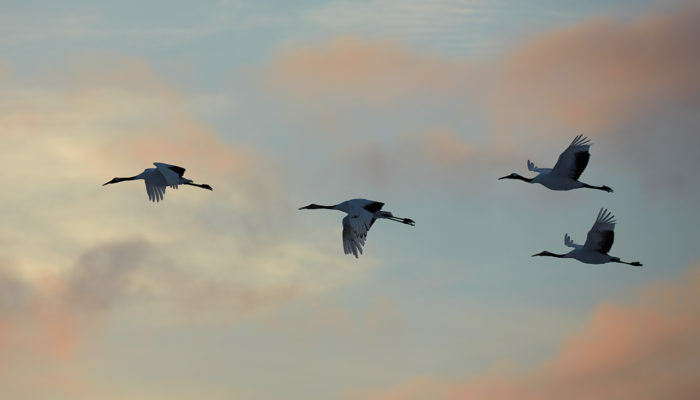 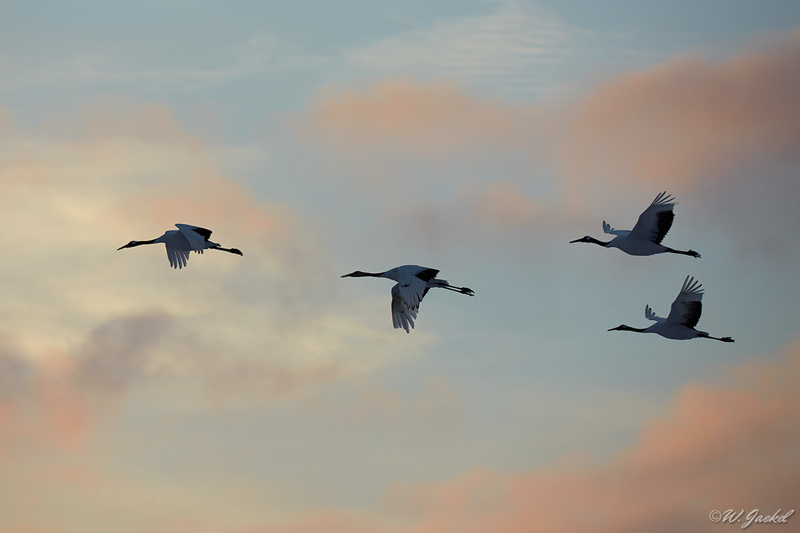 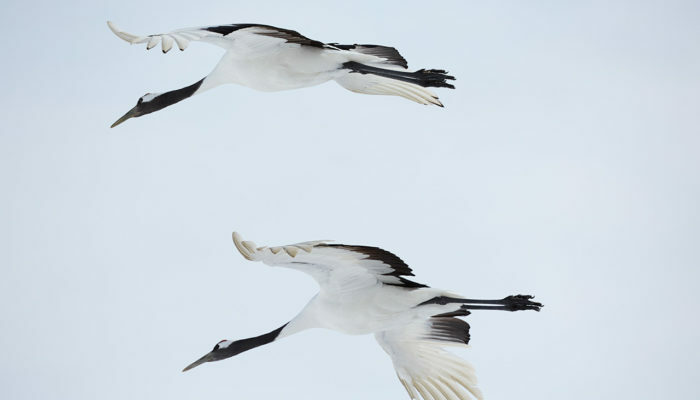 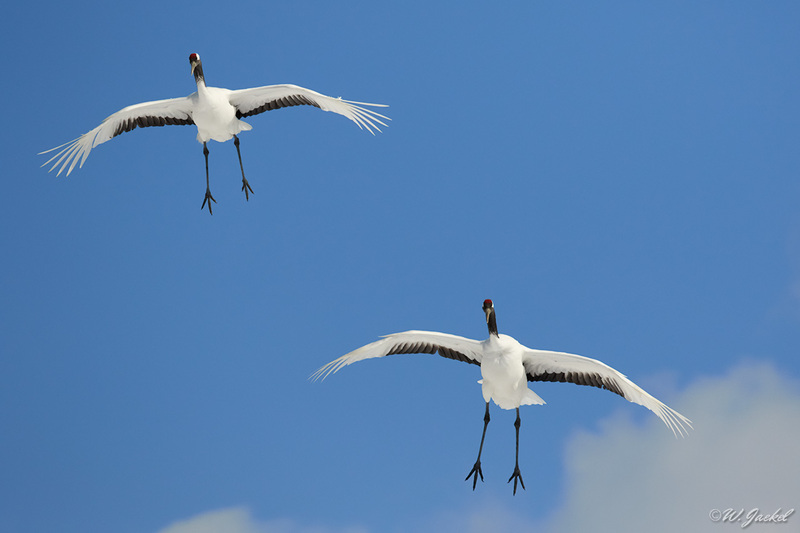 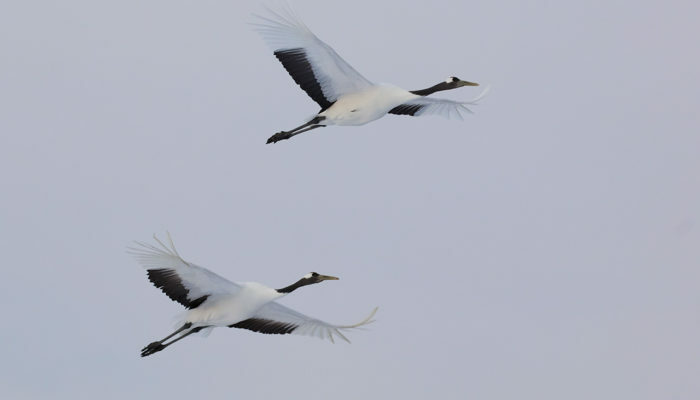 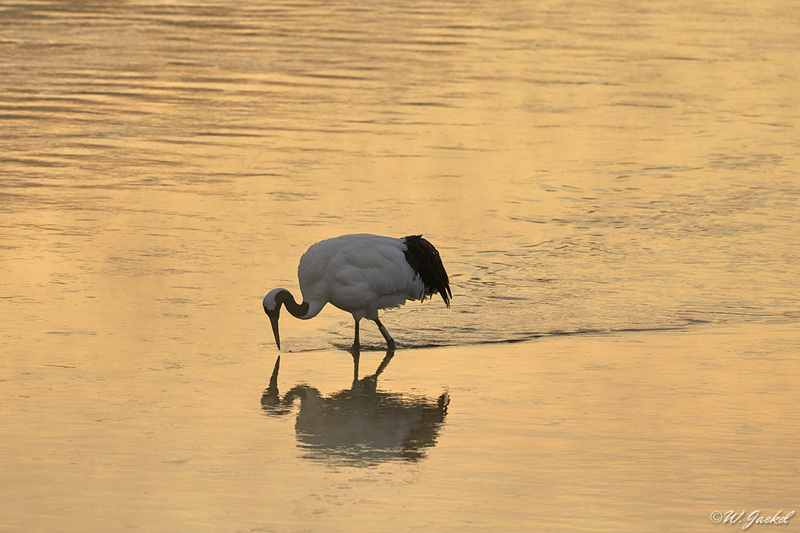 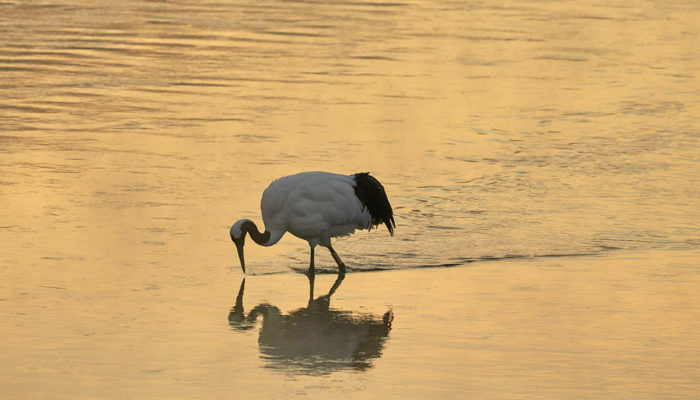 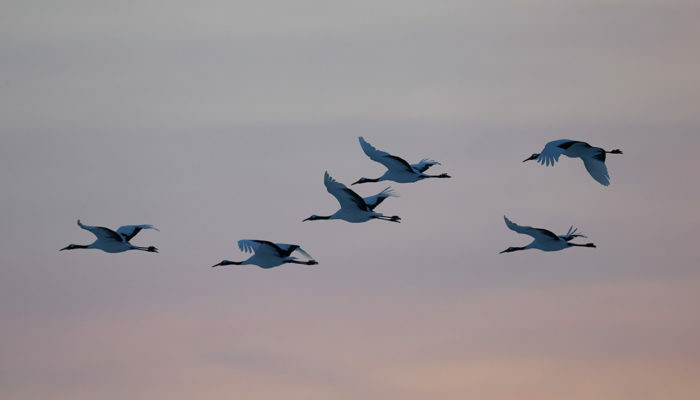 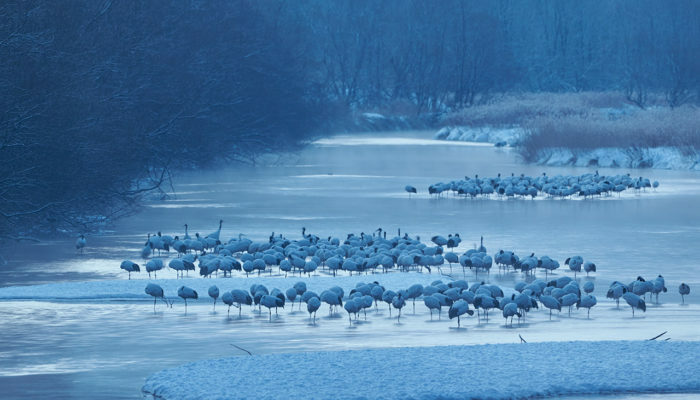 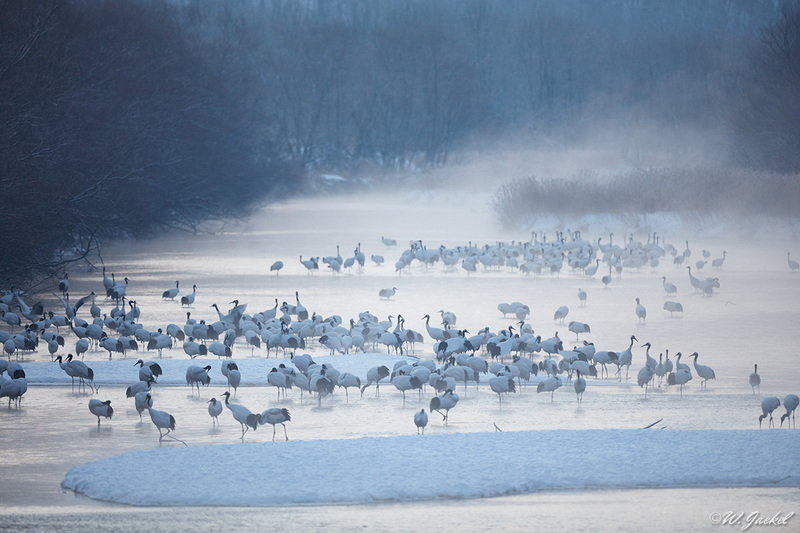 We went there on two days before dawn to photograph the cranes as they woke up for the day. 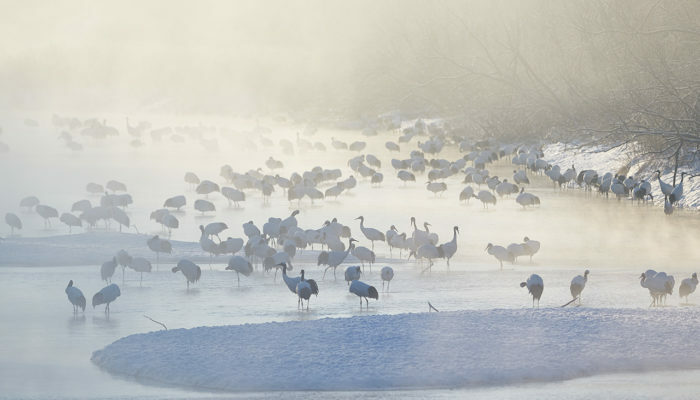 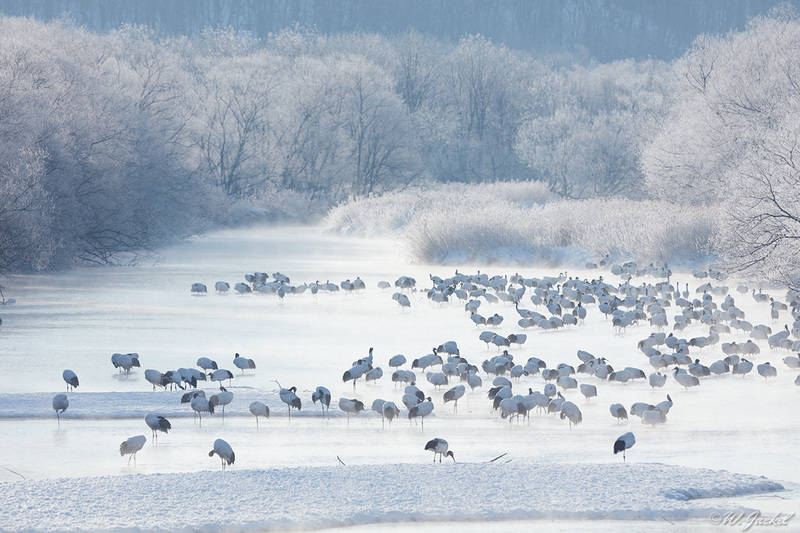 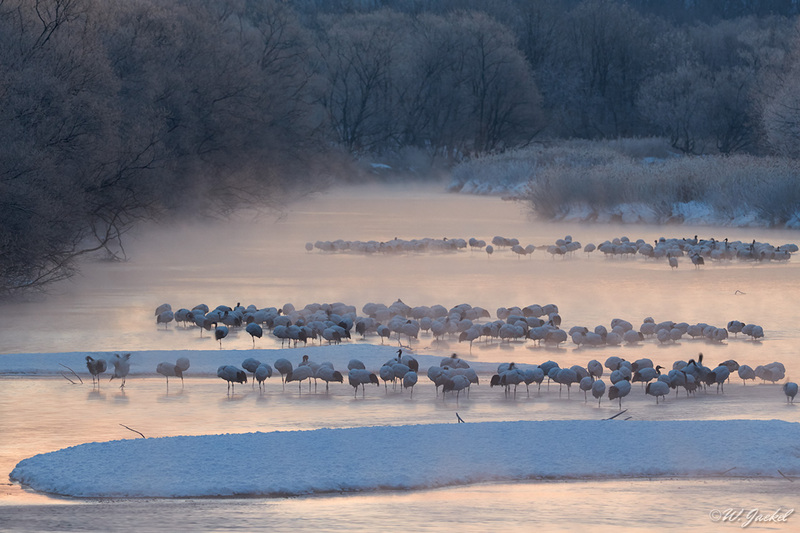 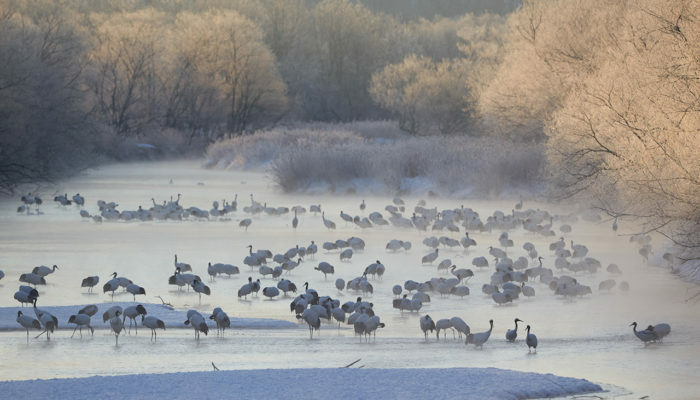 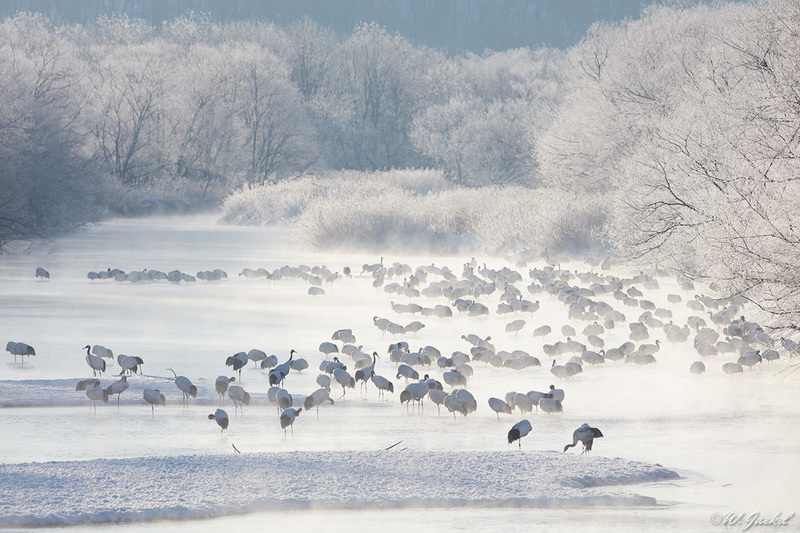 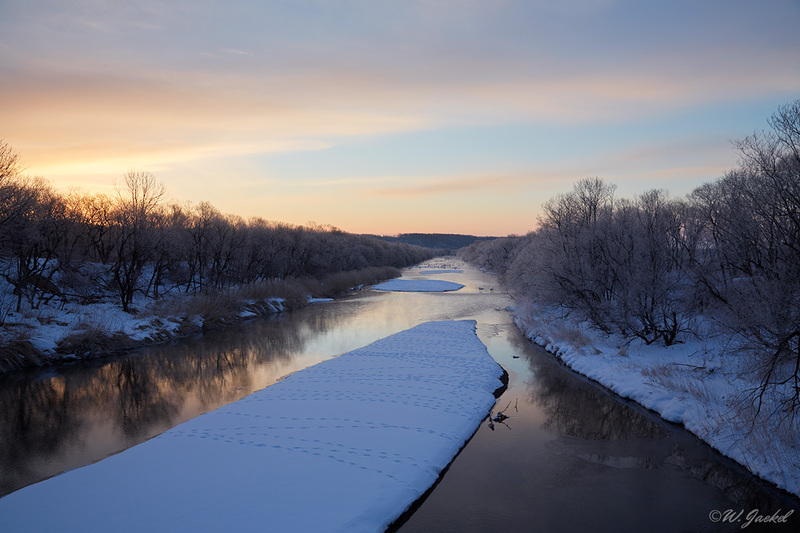 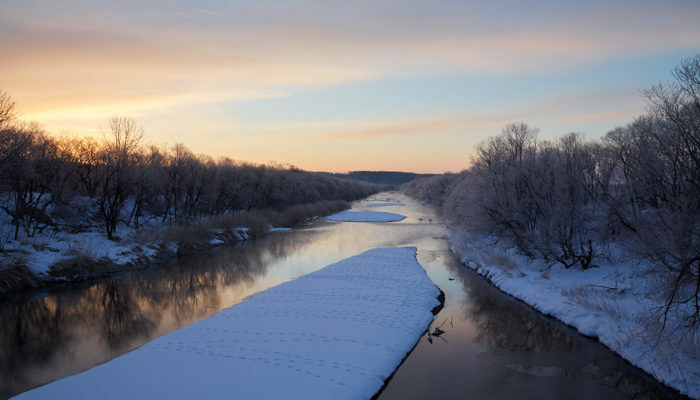 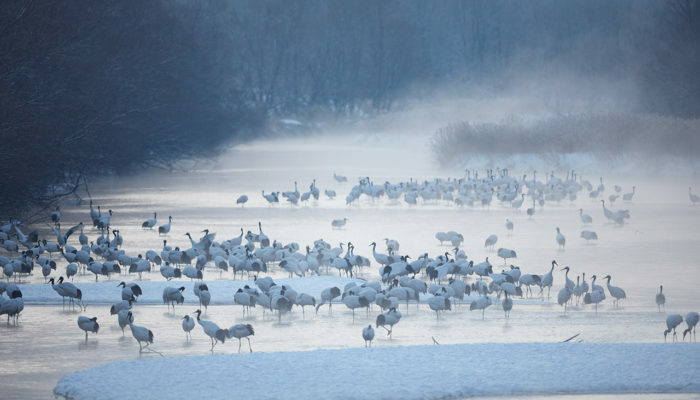 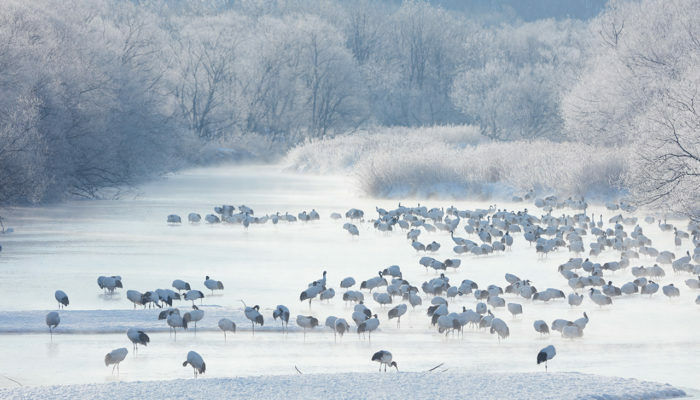 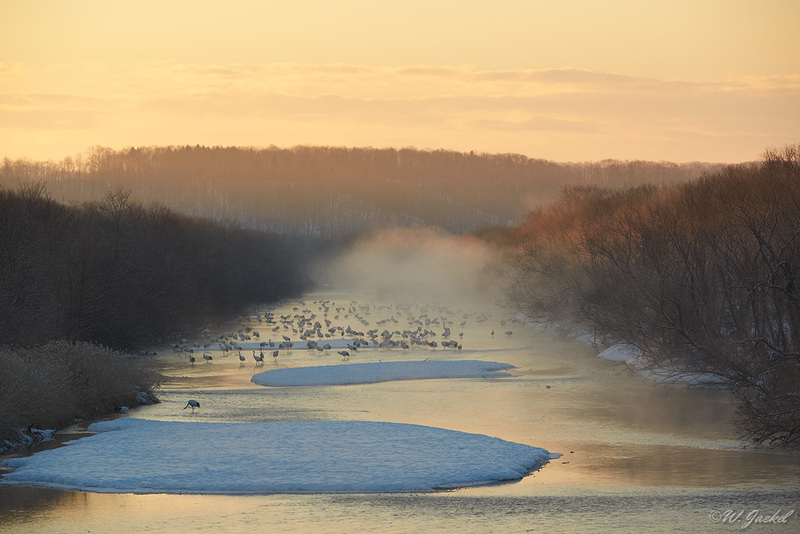 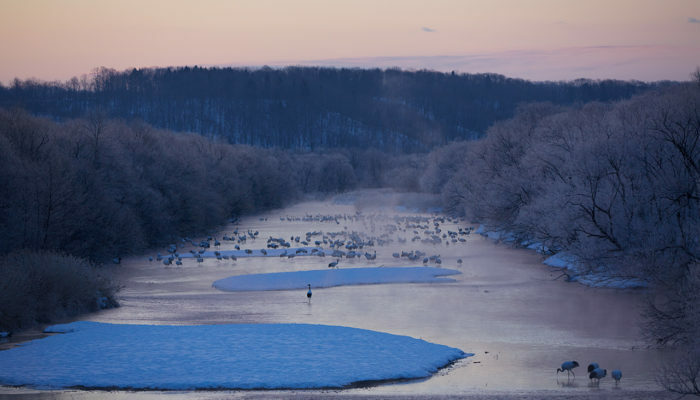 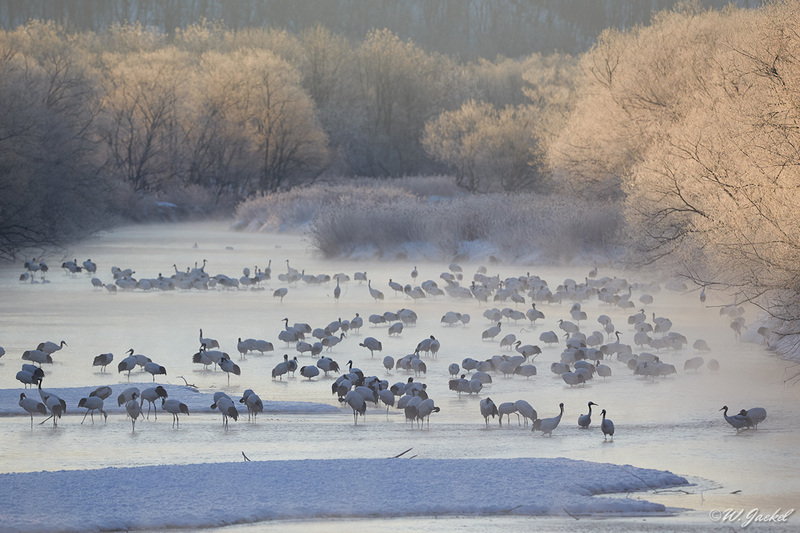 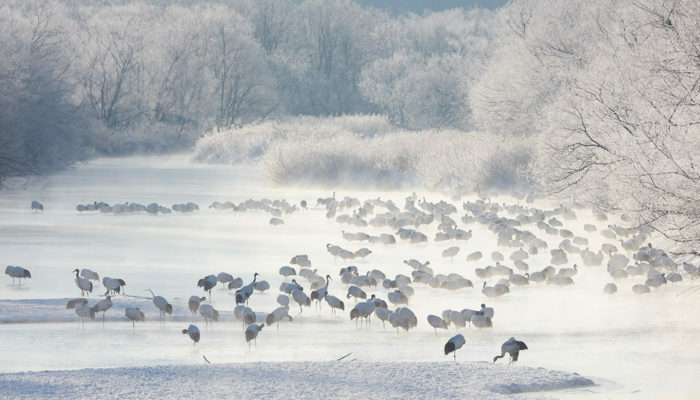 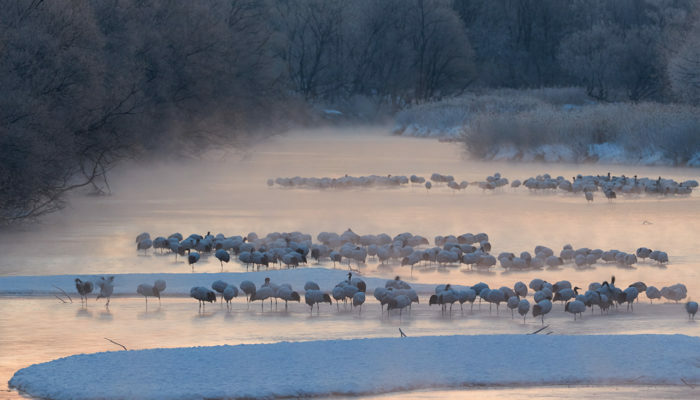 On very cold mornings the hoar frost in the river side trees sparkles like diamonds in the early morning light, vapour which has formed as mist rises from the river and the breath of the cranes is visible as they wake up. 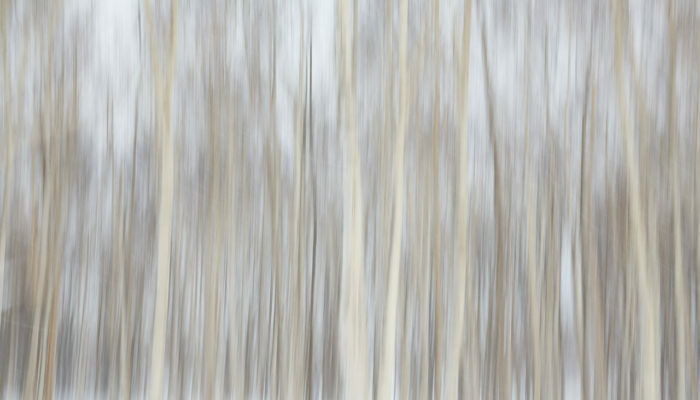 We were happy to watch and photograph this magical and amazing scenery. For shooting the cranes from the bridge I mostly had used the 600mm lens. 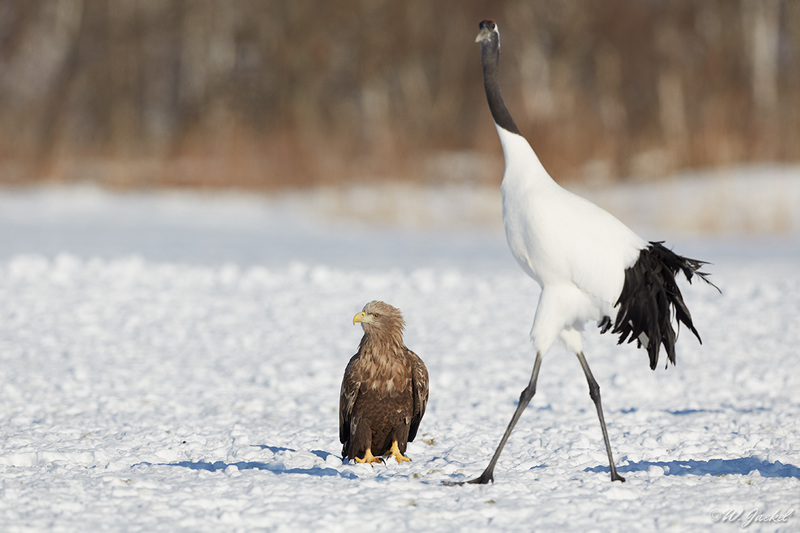 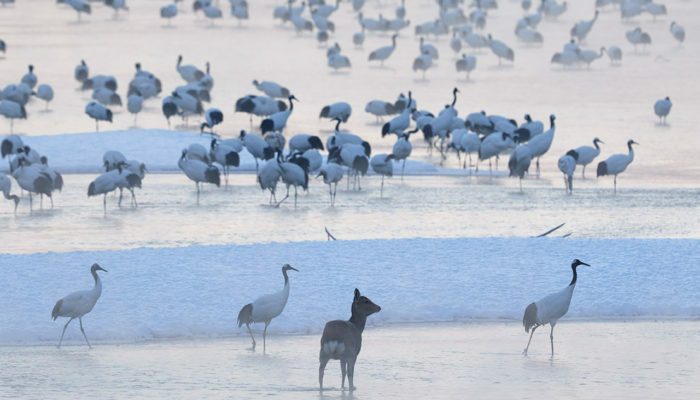 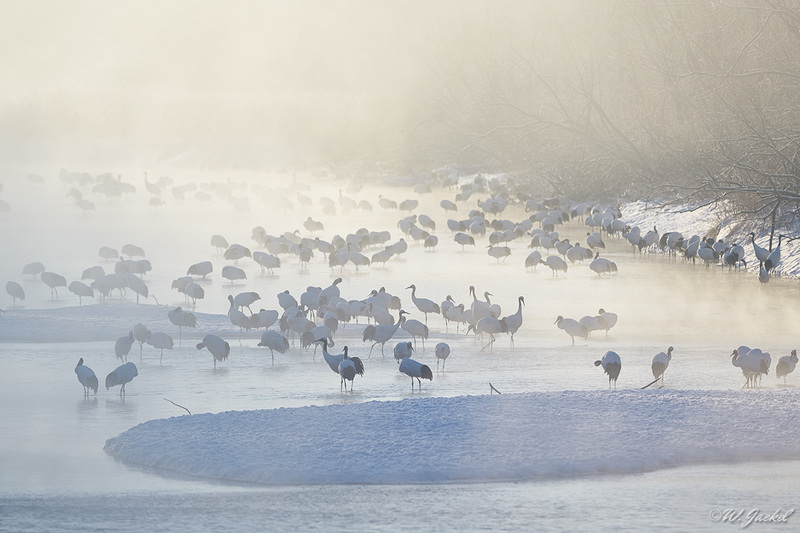 Since this is one of the most popular crane photography sites in the world it’s pretty crowded there in the morning. 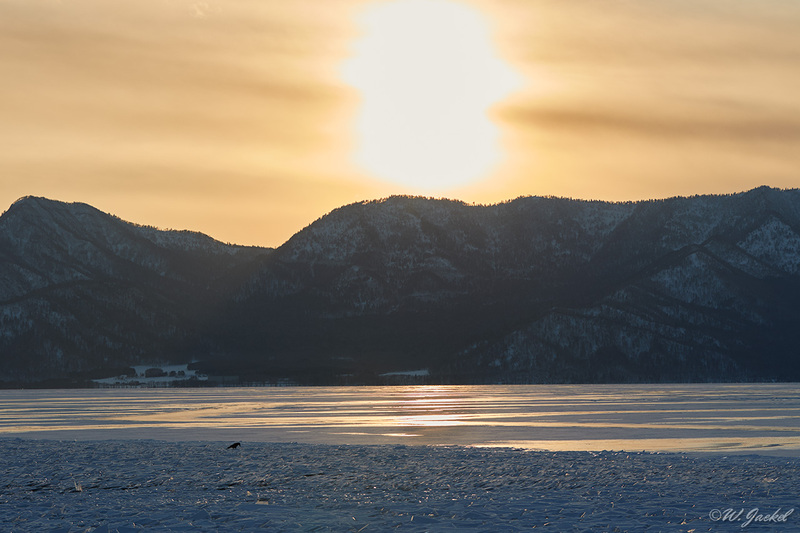 I found the attitude of some people to turn up the night before and leave a tripod for a prime viewpoint pretty unethical, though. 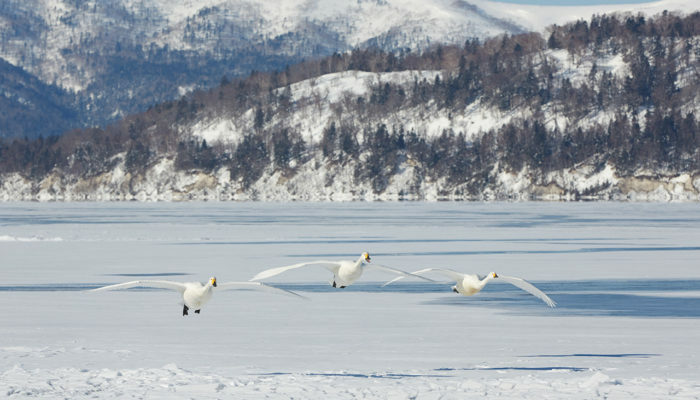 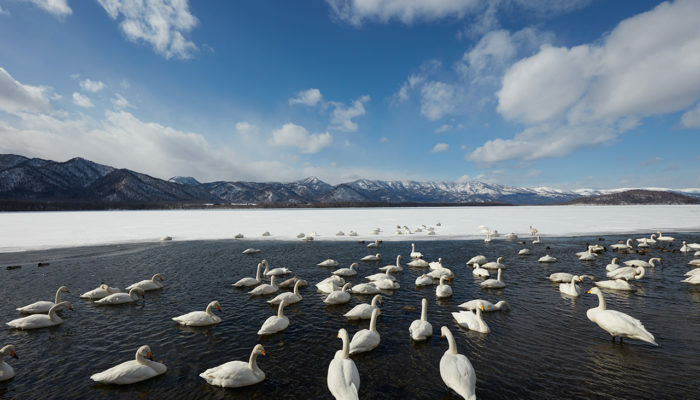 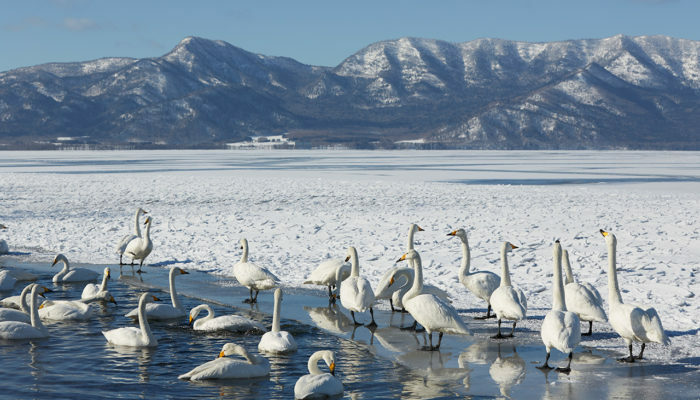 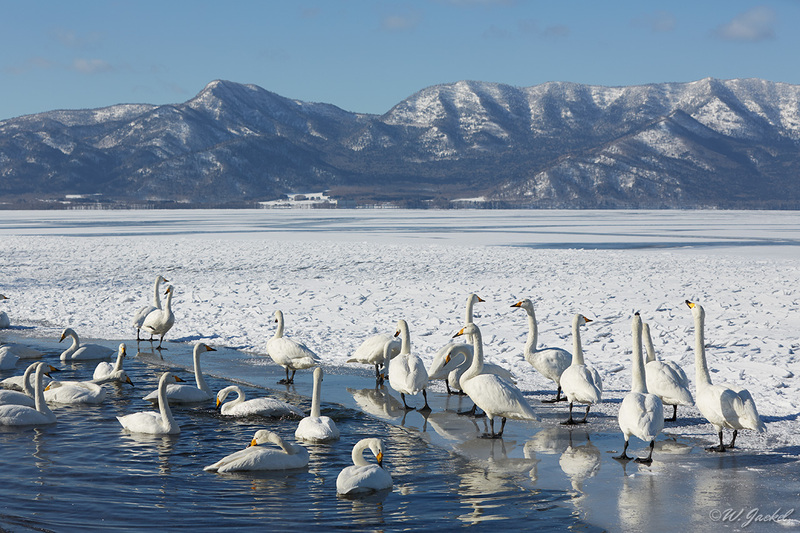 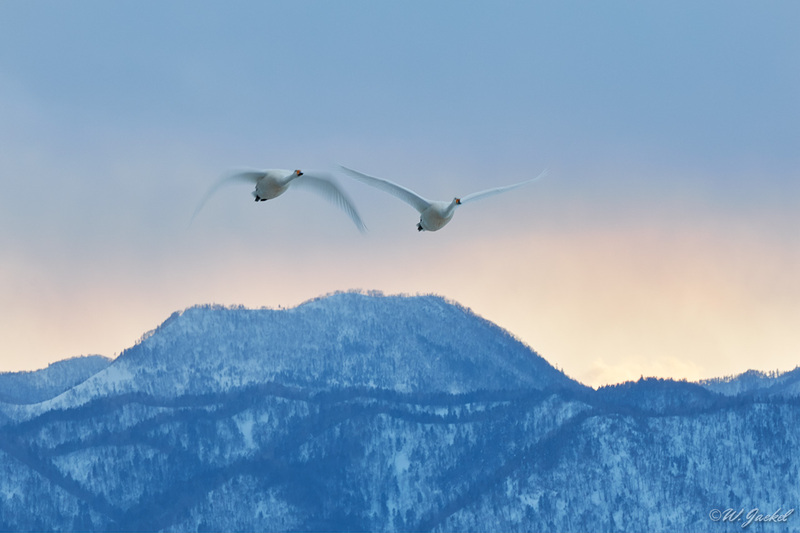 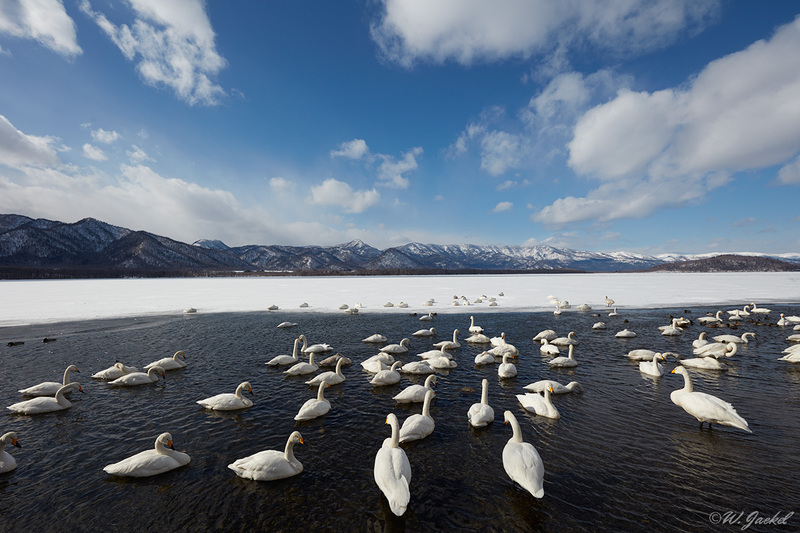 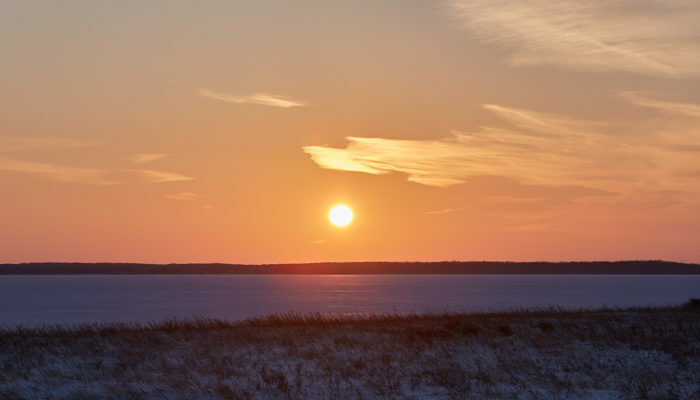 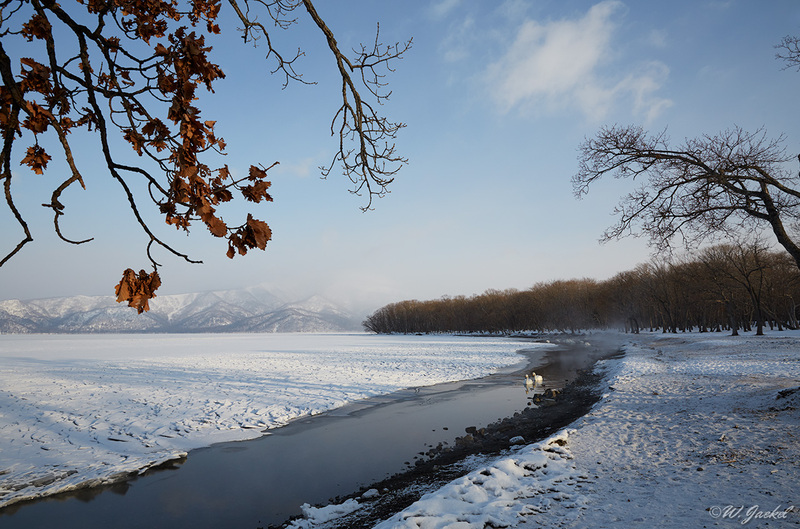 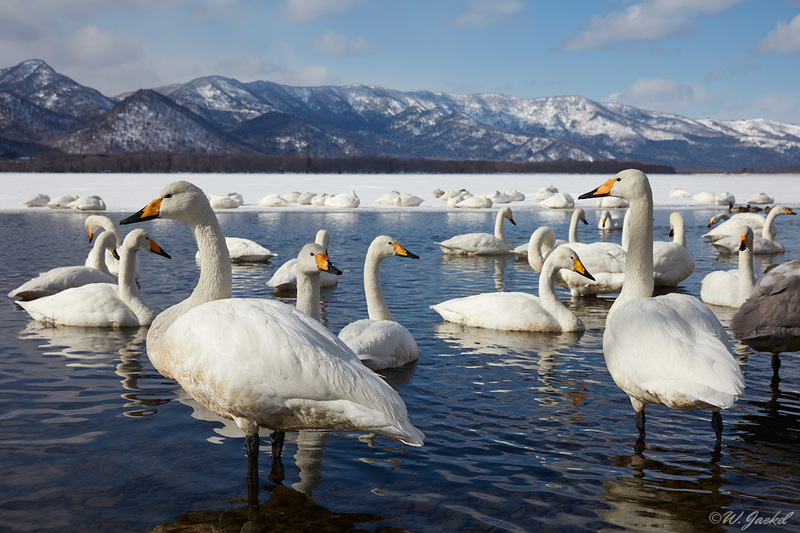 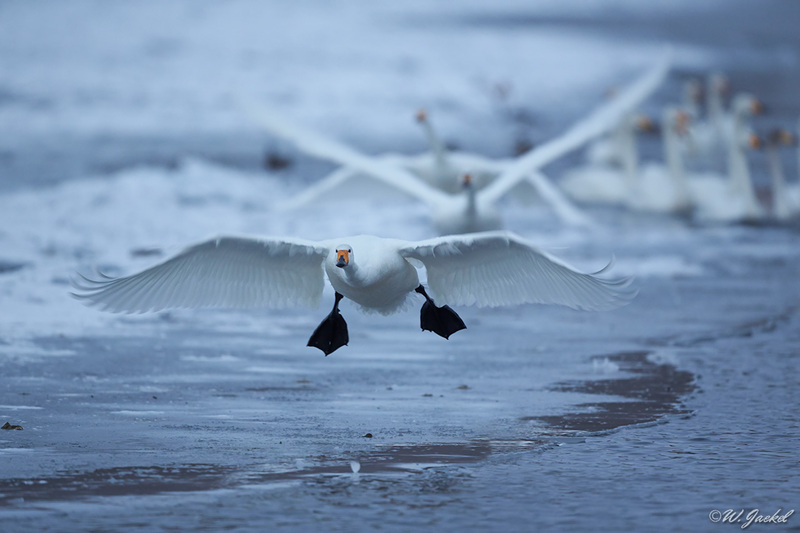 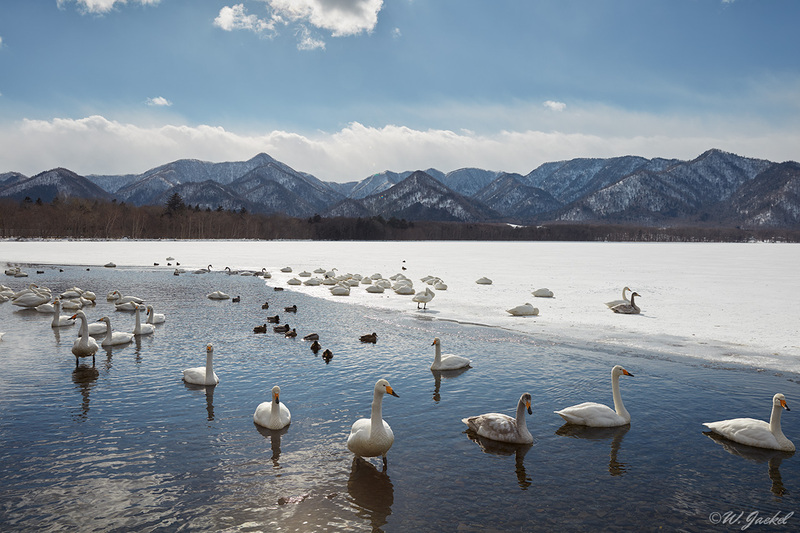 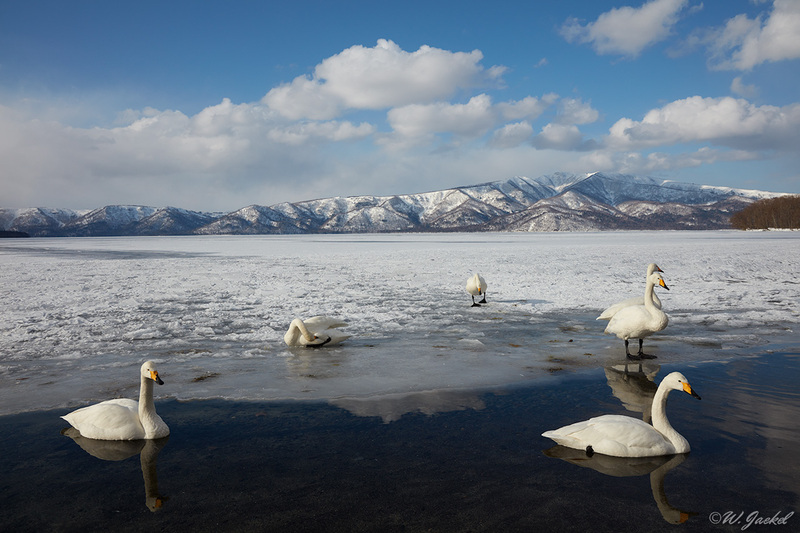 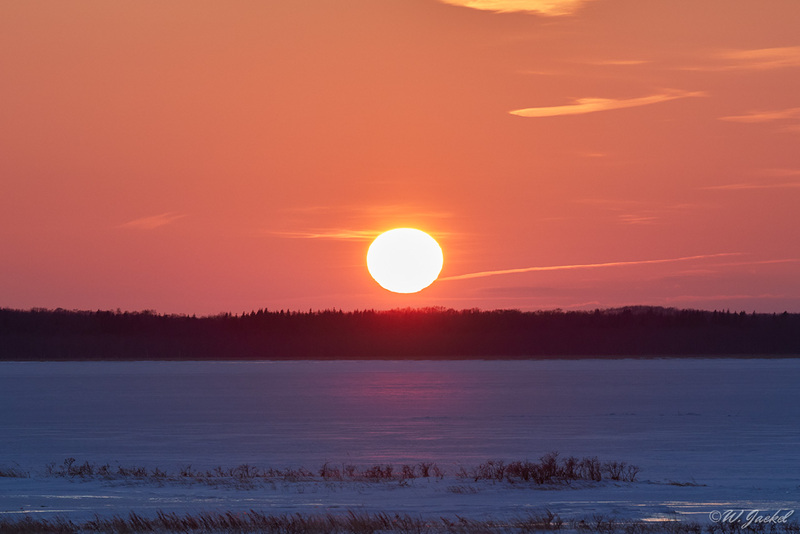 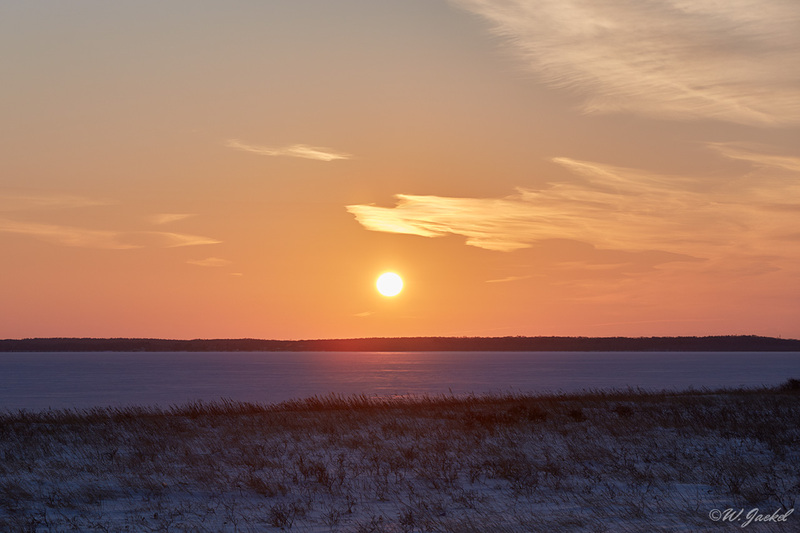 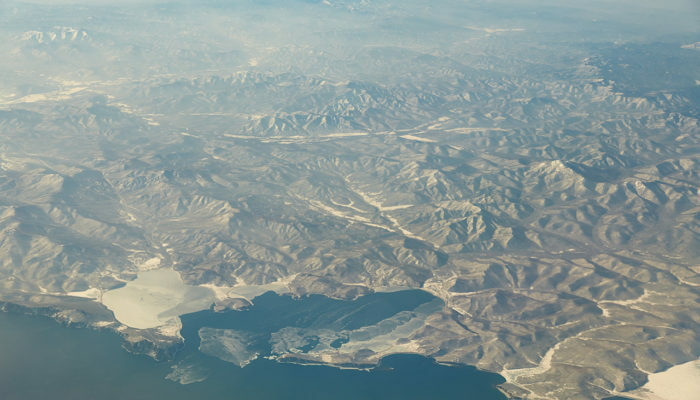 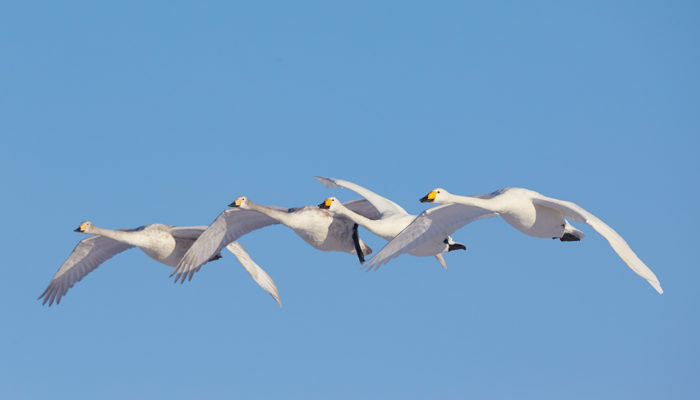 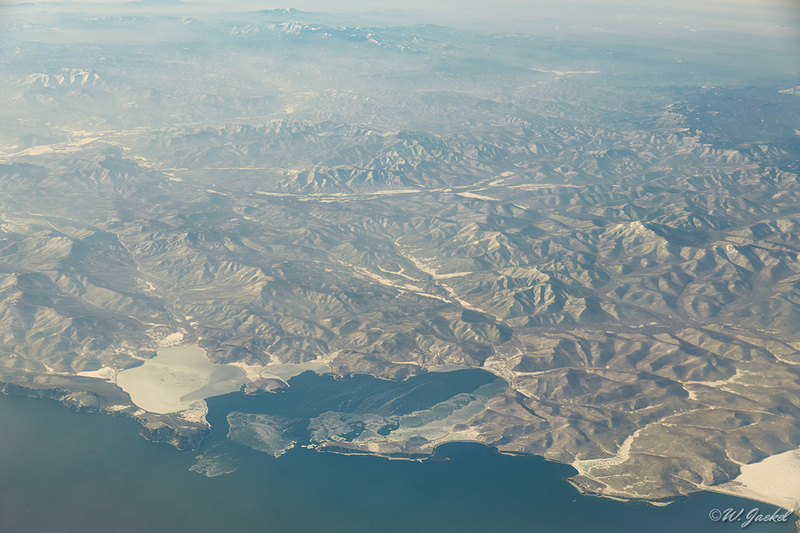 Our next target was the Kussharo Lake where we planned to shoot the Whooper Swans gathering in the not frozen strips and flying by. 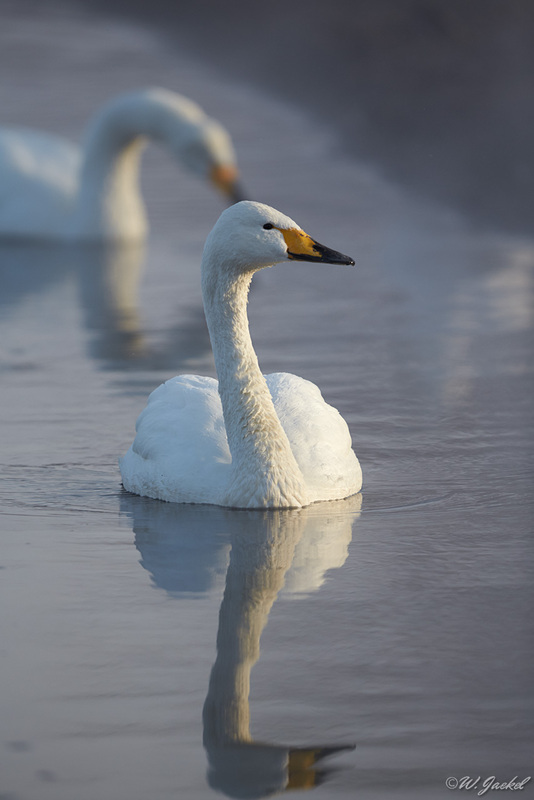 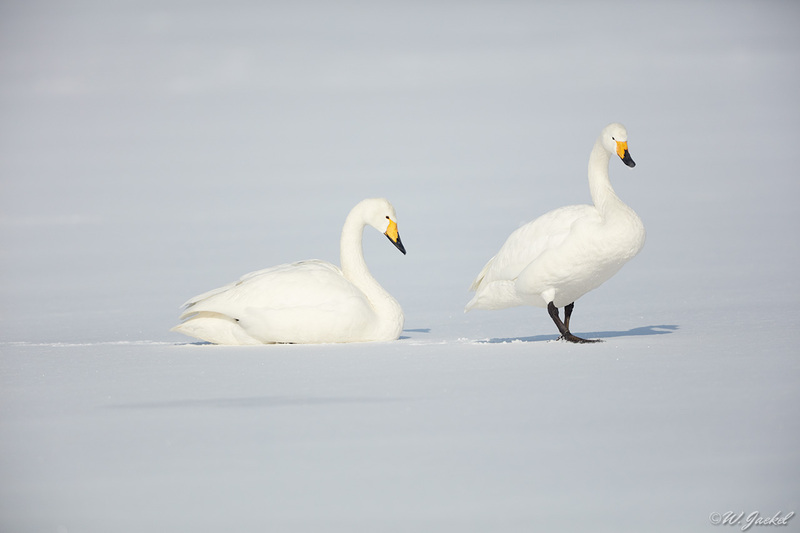 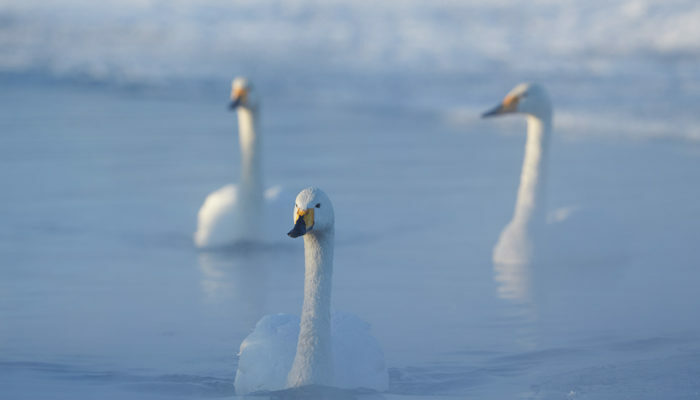 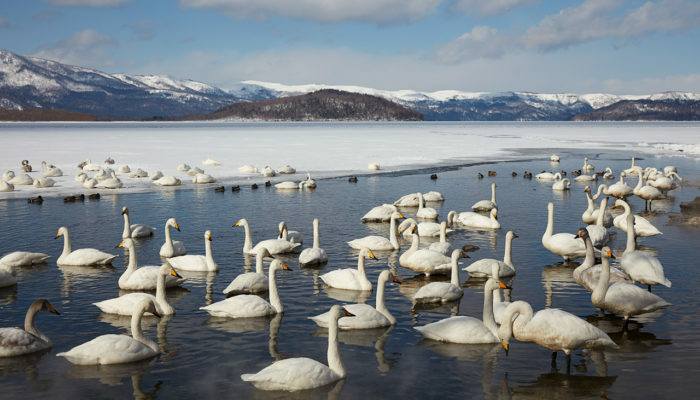 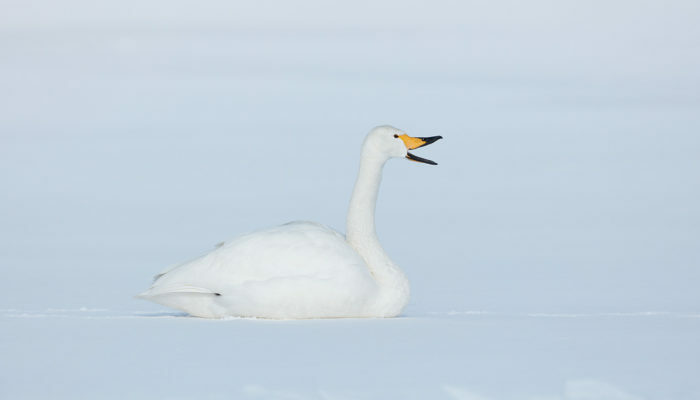 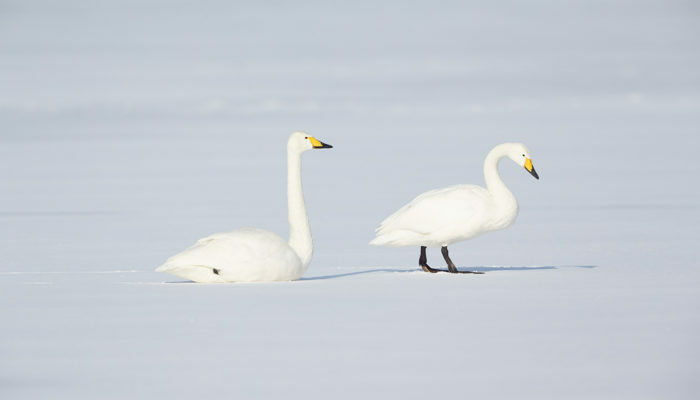 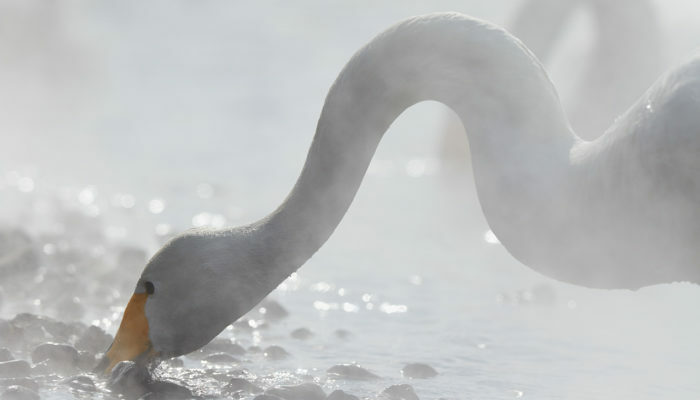 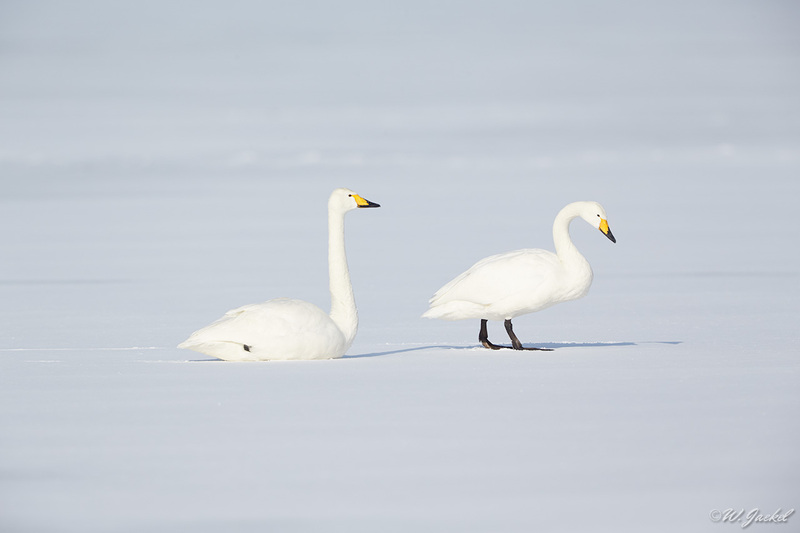 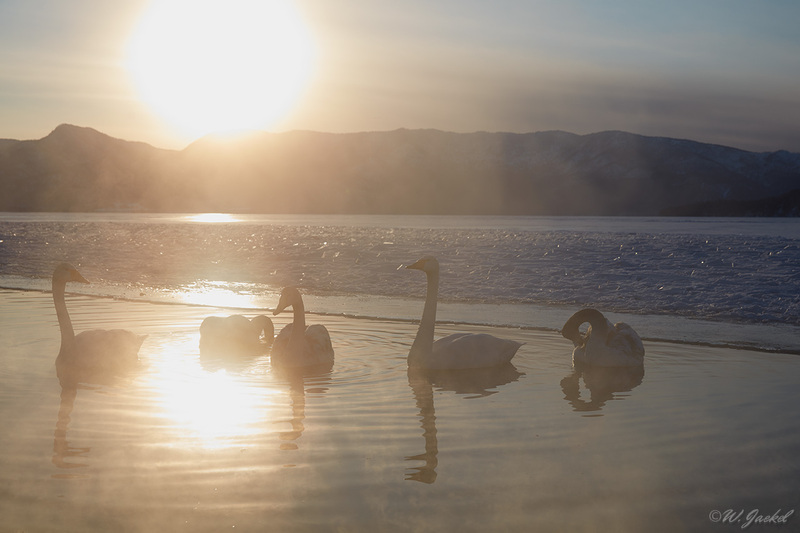 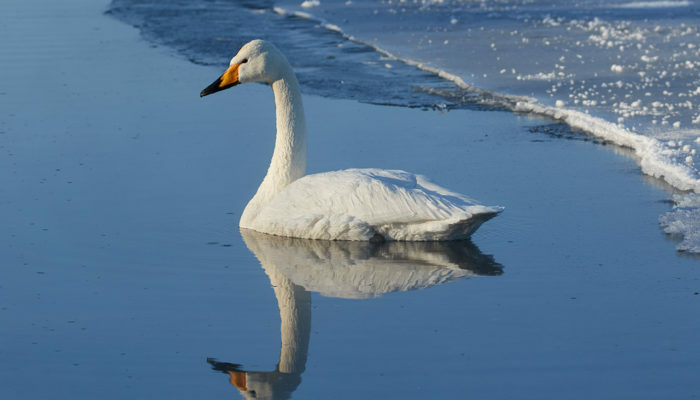 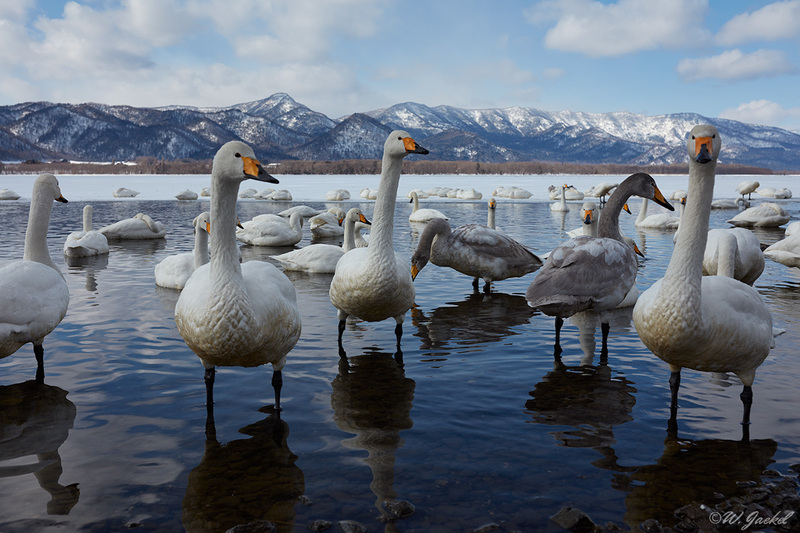 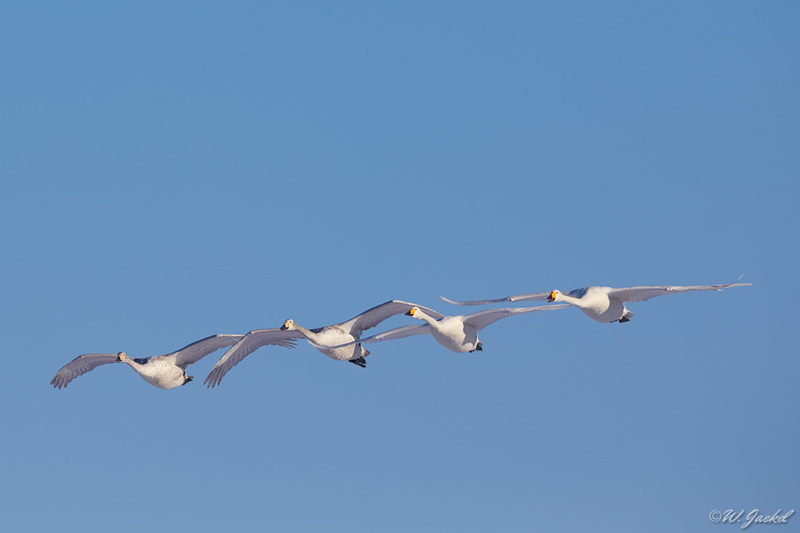 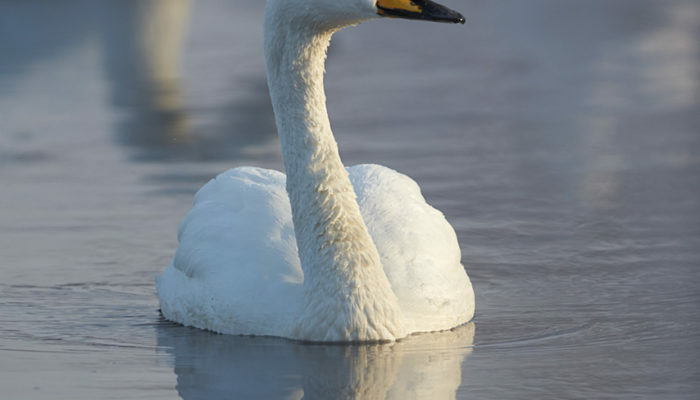 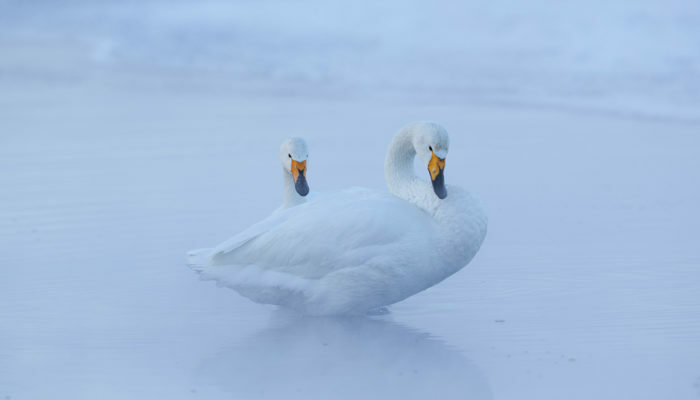 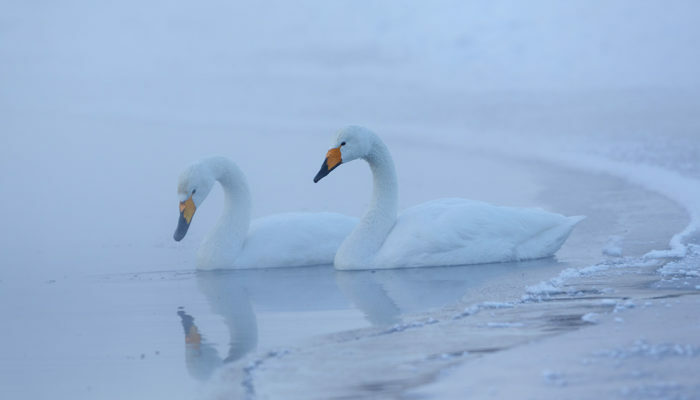 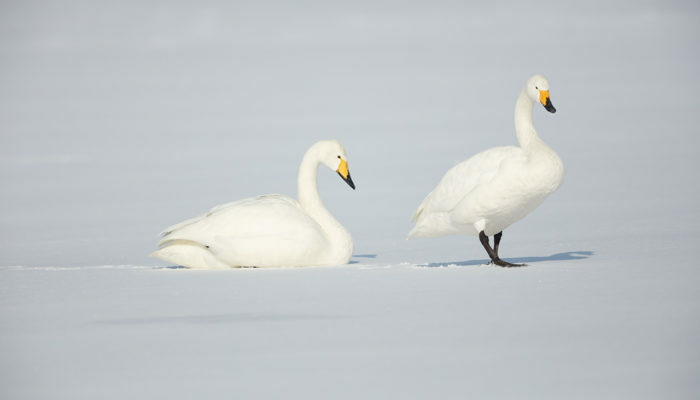 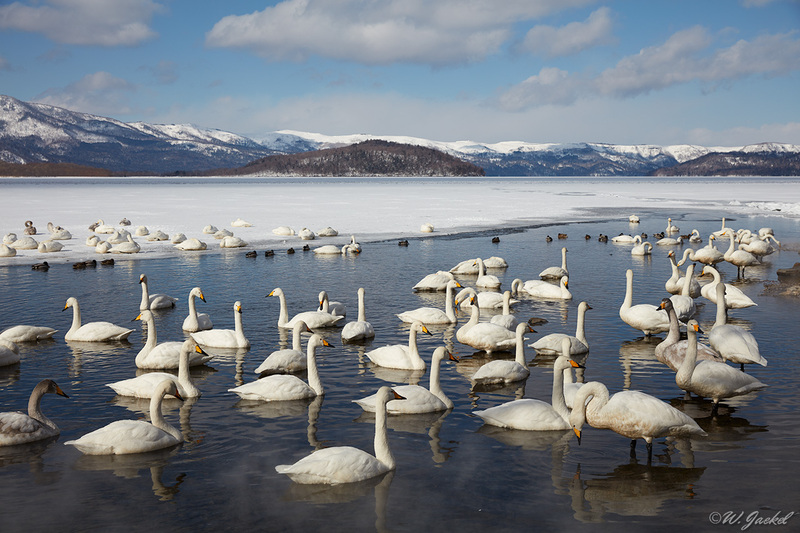 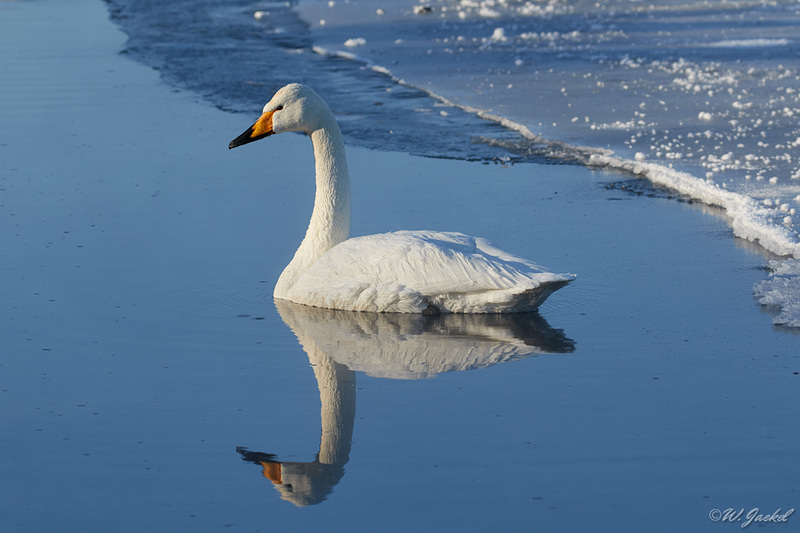 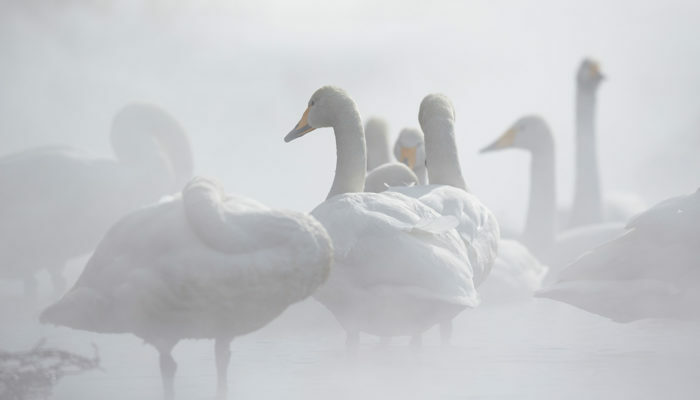 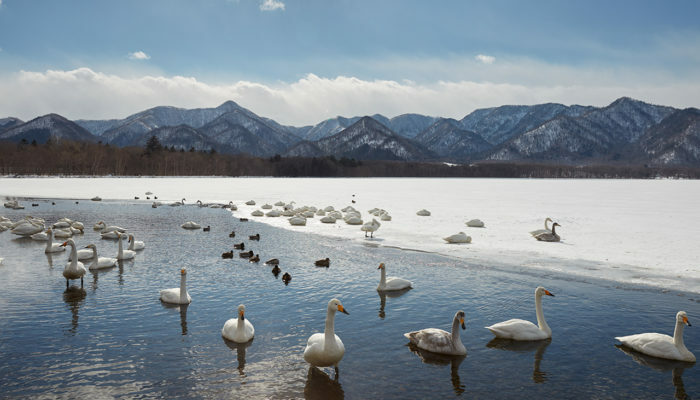 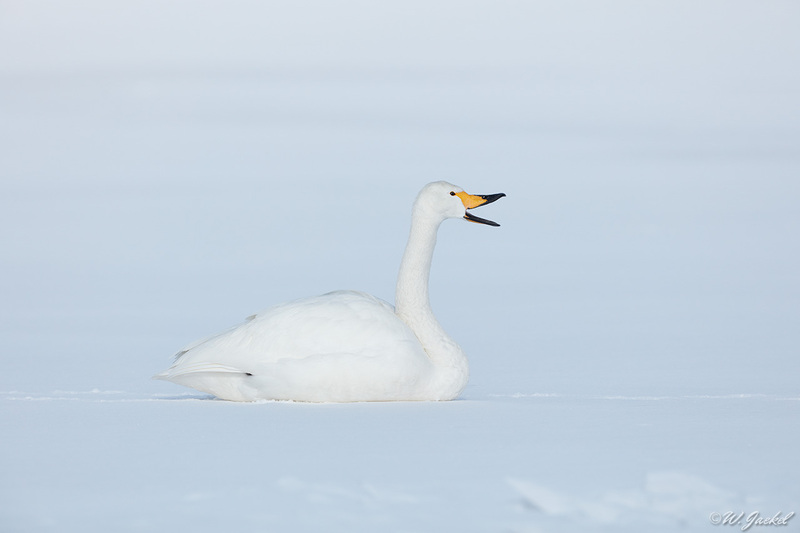 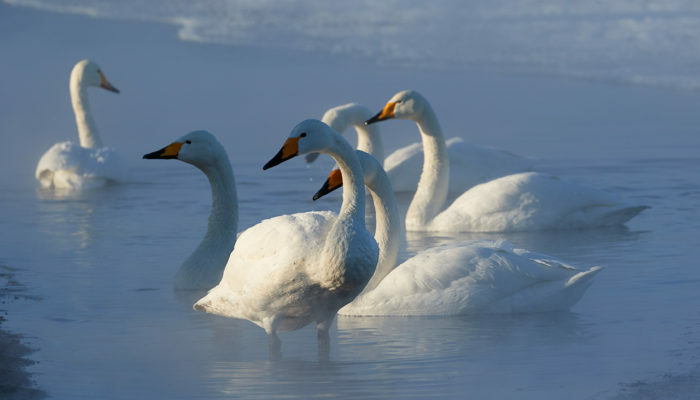 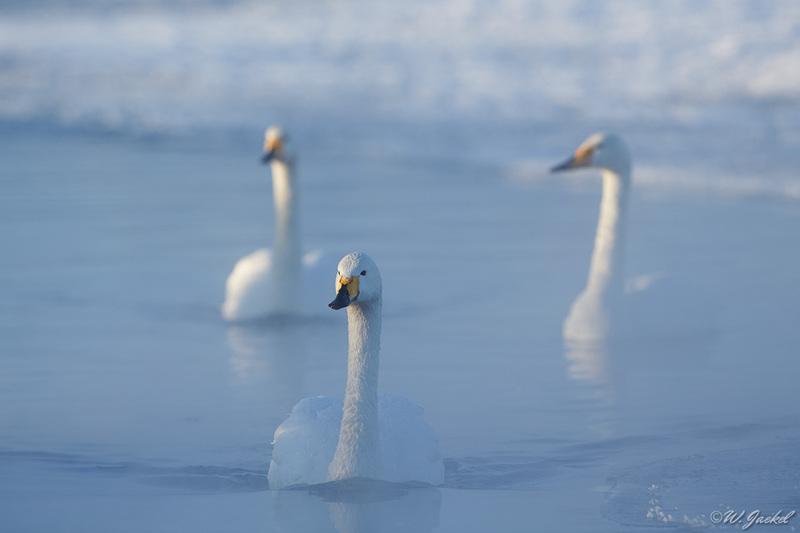 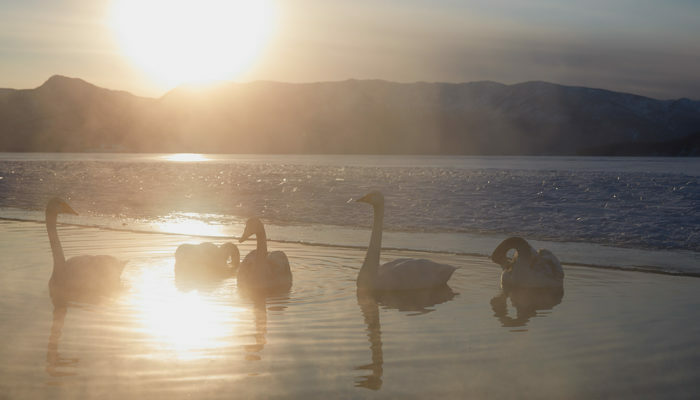 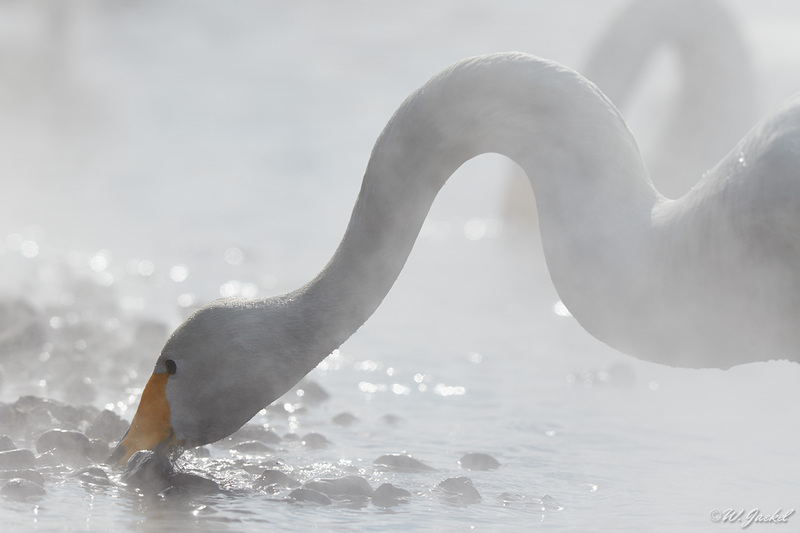 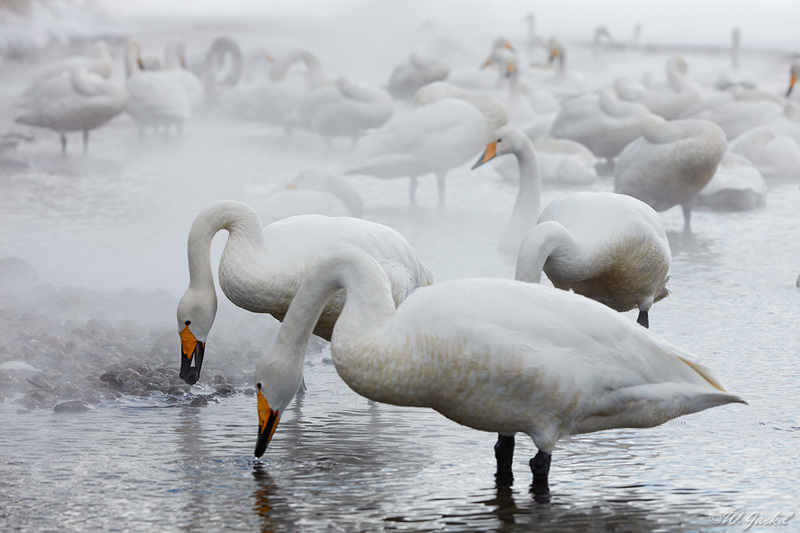 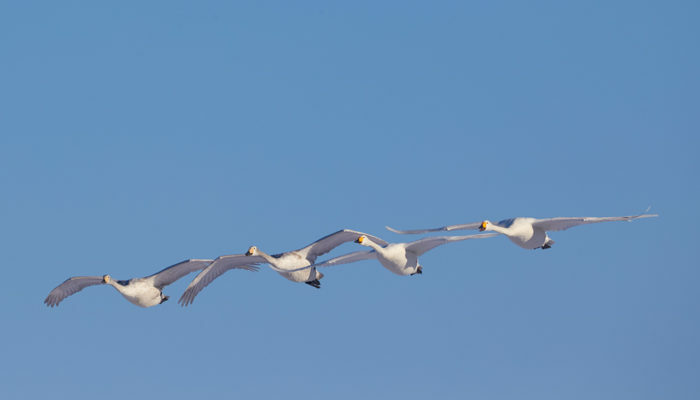 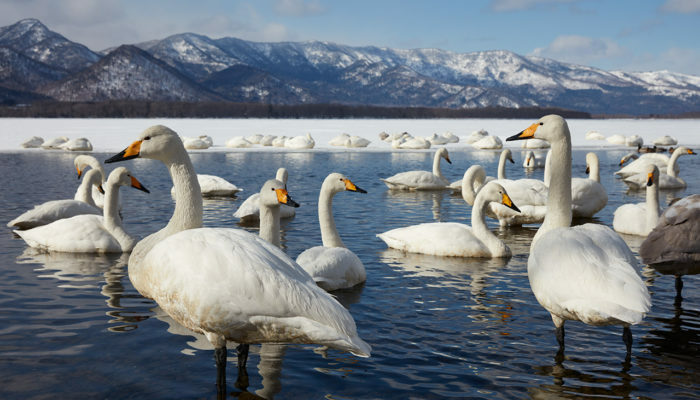 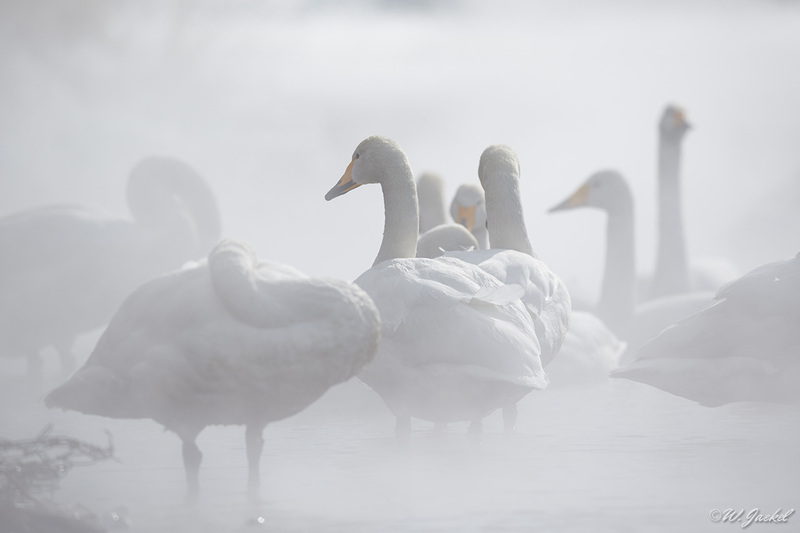 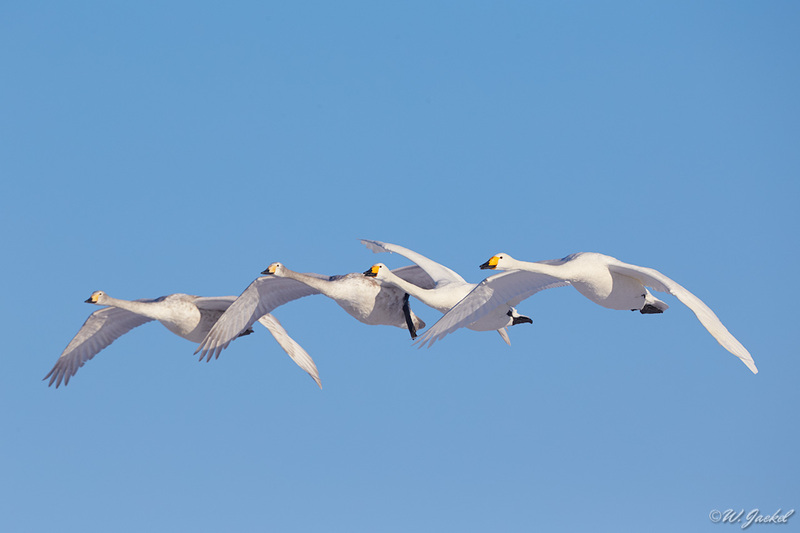 We stopped at a place called Kotan, where a hot spring flowing into the lake prevents a little waterhole from freezing, so there is usually a decent sized group of whooper swans there. 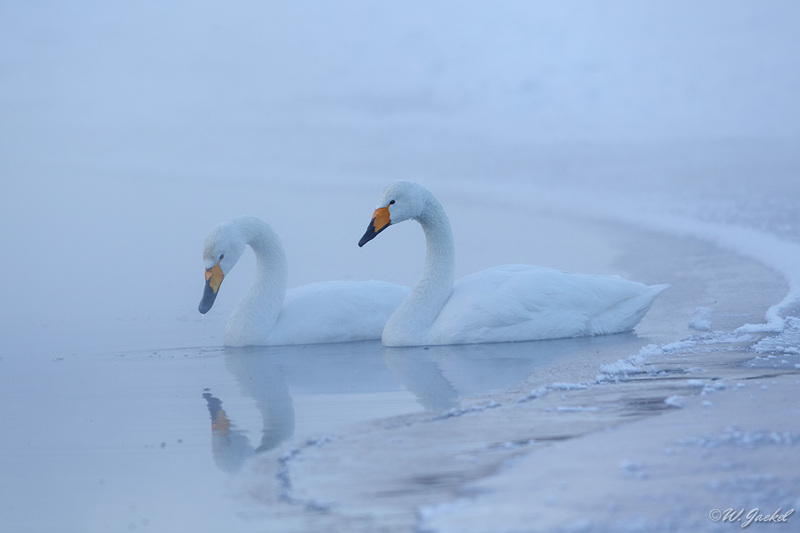 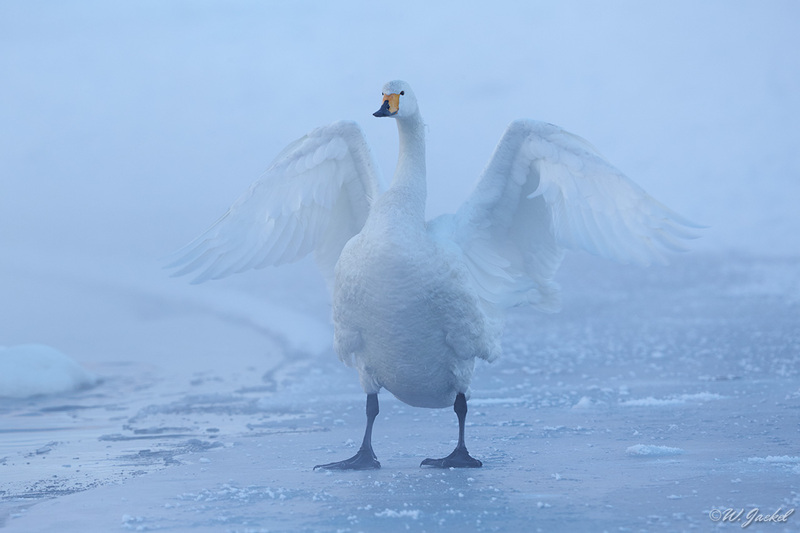 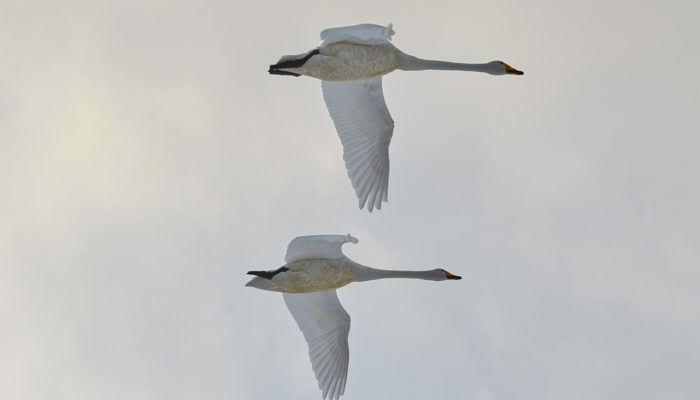 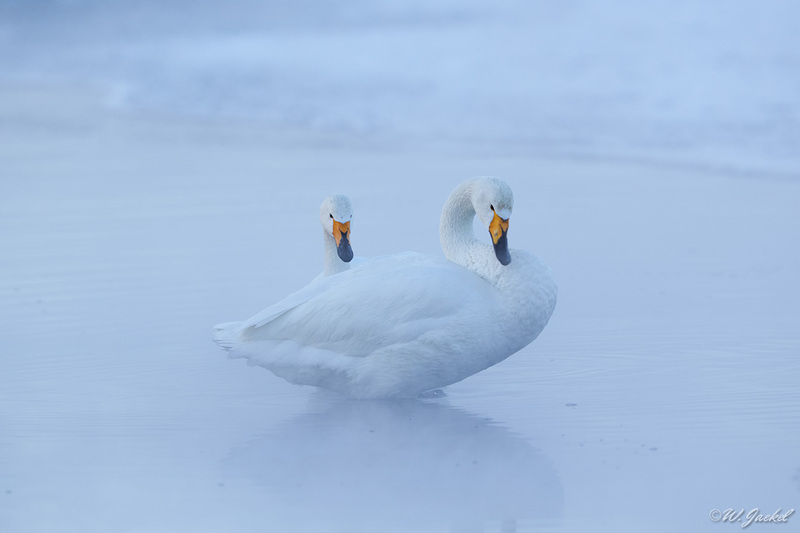 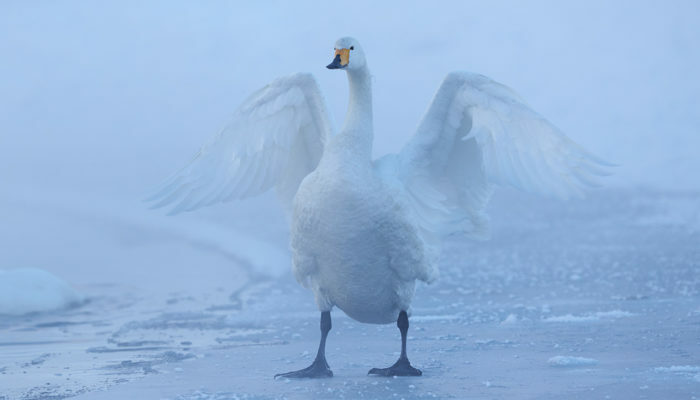 I could capture some nice photographs of the swans in the vapour or against the backdrop of the scenery though the swans are not as graceful as the cranes, of course. 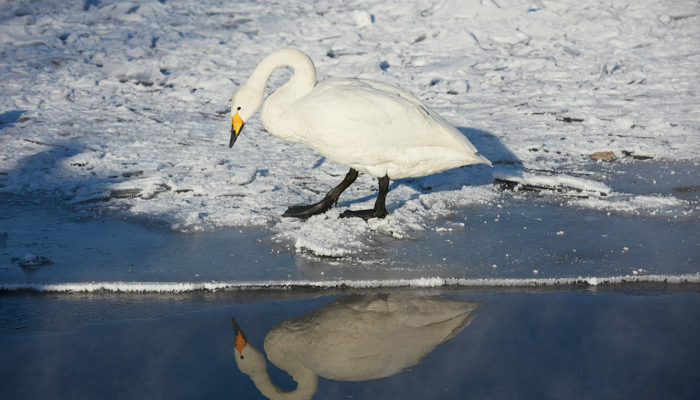 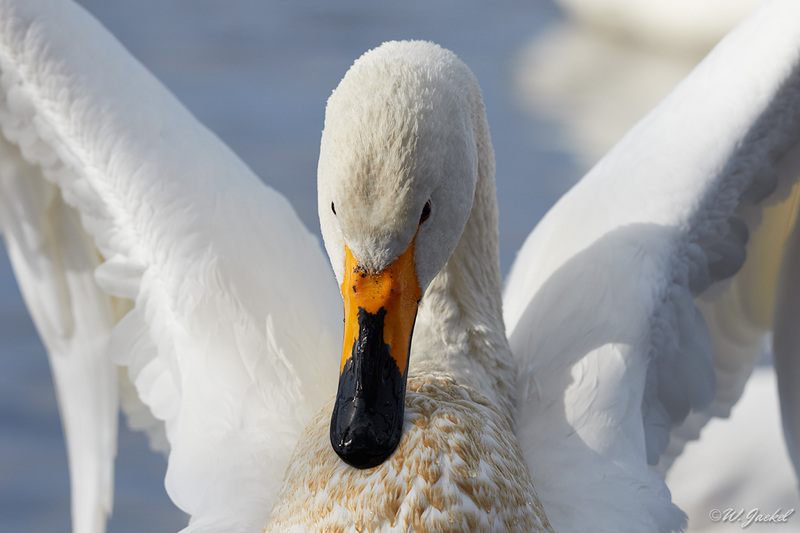 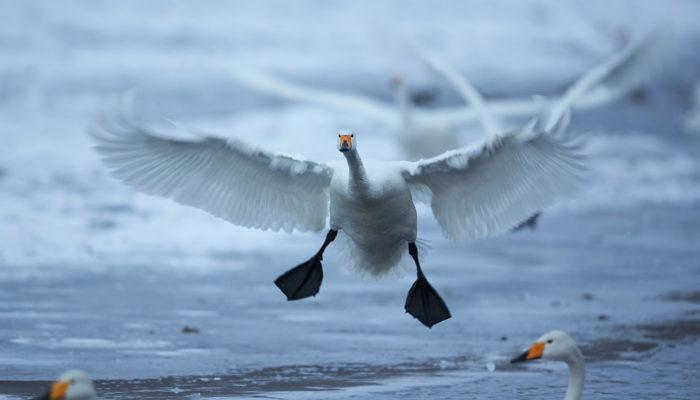 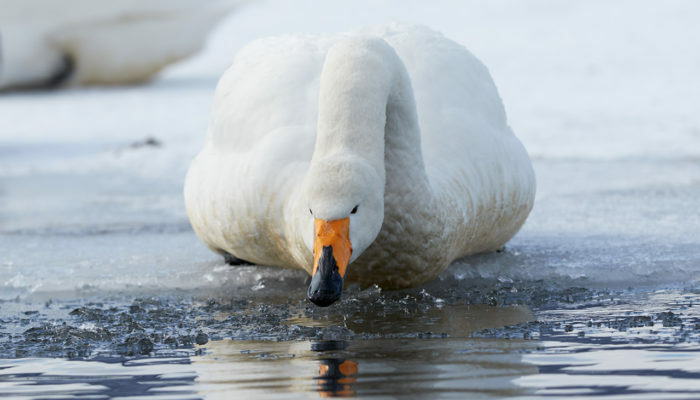 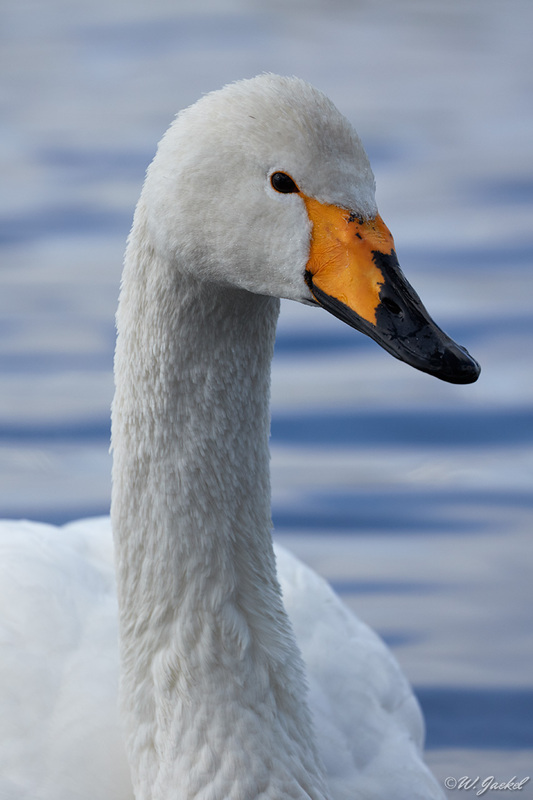 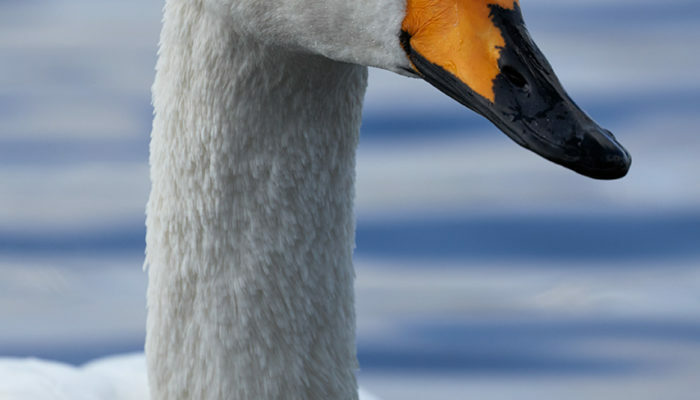 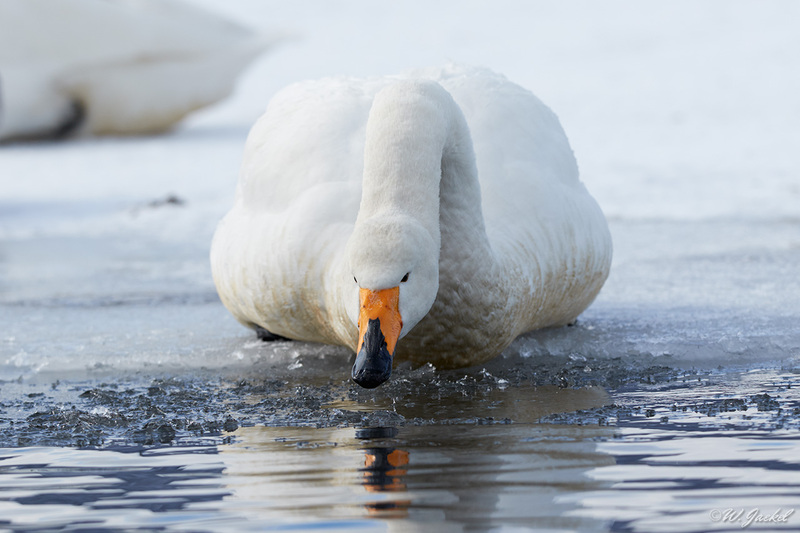 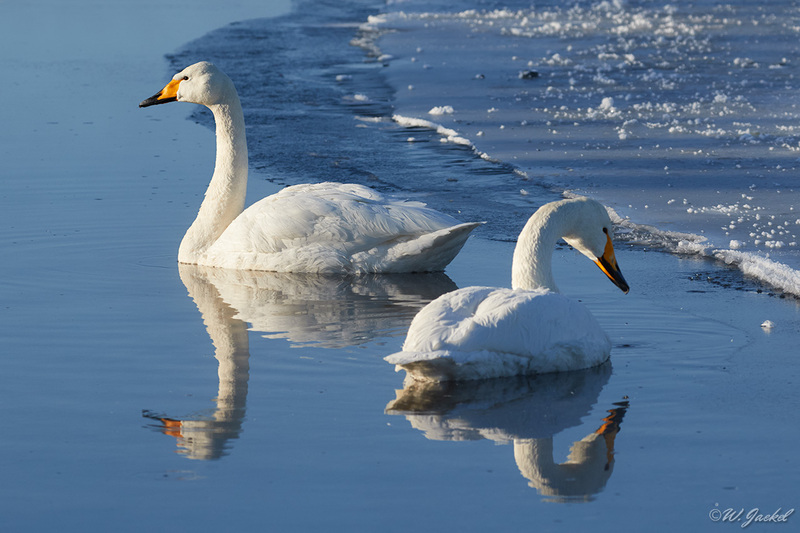 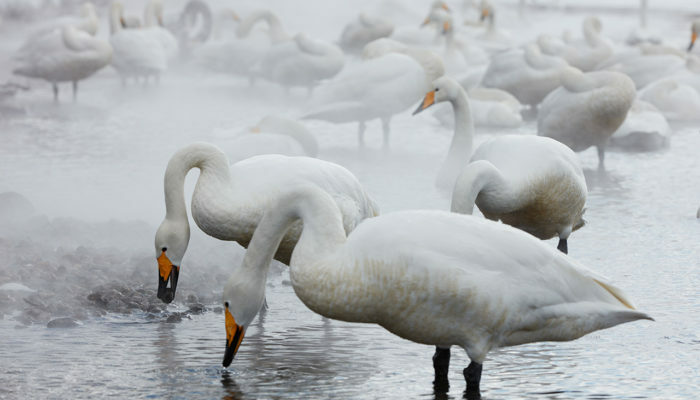 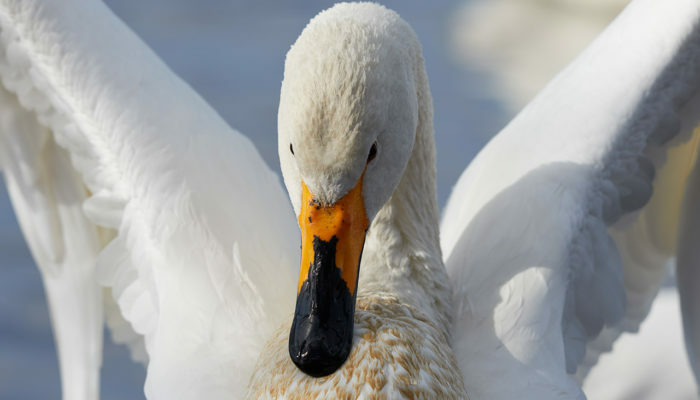 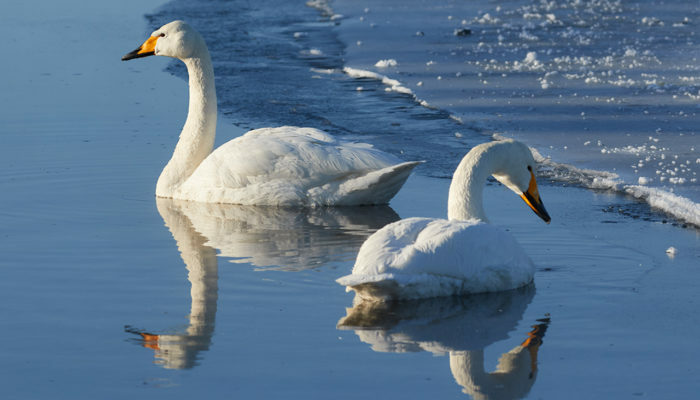 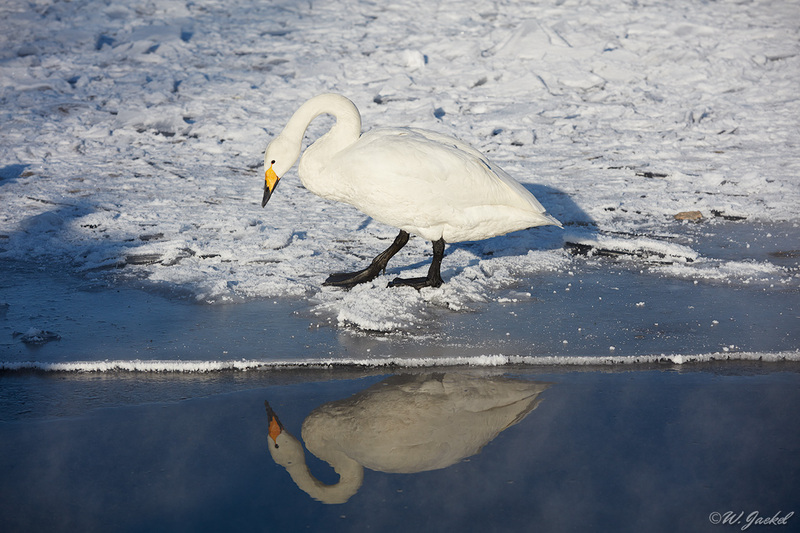 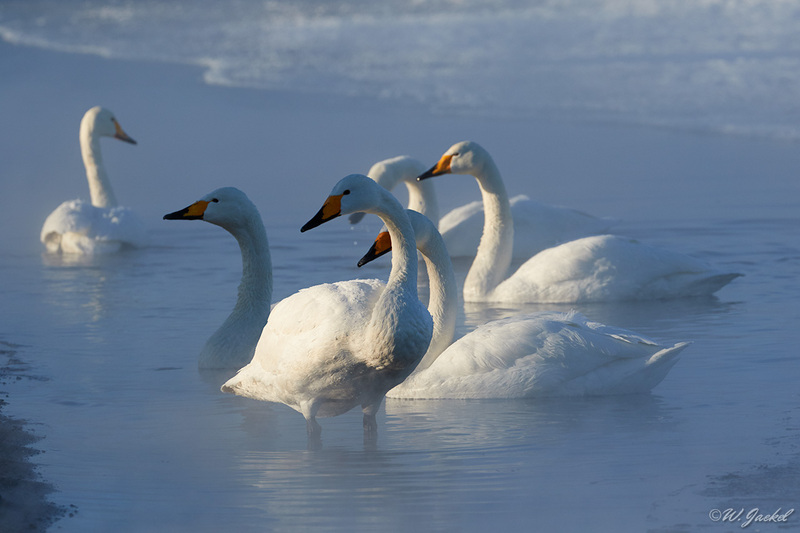 I mostly had used the 70-200mm/f2.8 II, and 24-70mm/f2.8 II lenses, but occasionally also the 11-24mm/f4 for some group shots and the 200-400mm/f4+Ext for portraits of the swans. 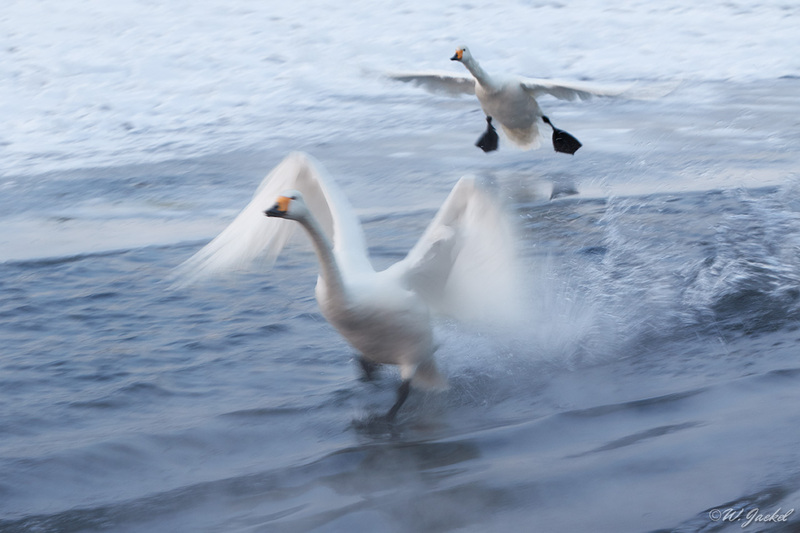 Later the day we moved on along the lake to a place called Sunayu where we tried to do some panning shots of the swans flying back and forth along the beach with the shutter speed slowed down but the swans weren’t very cooperative. 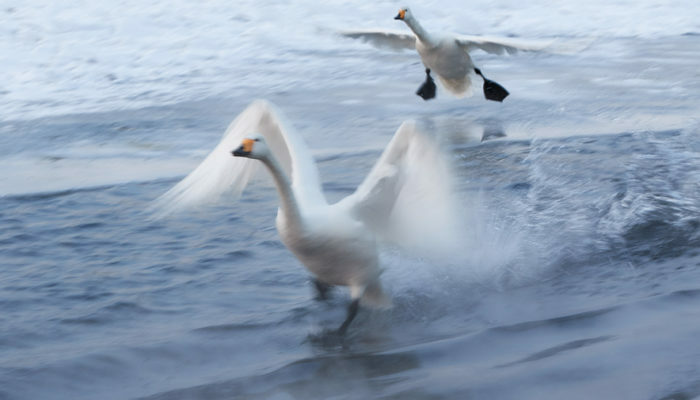 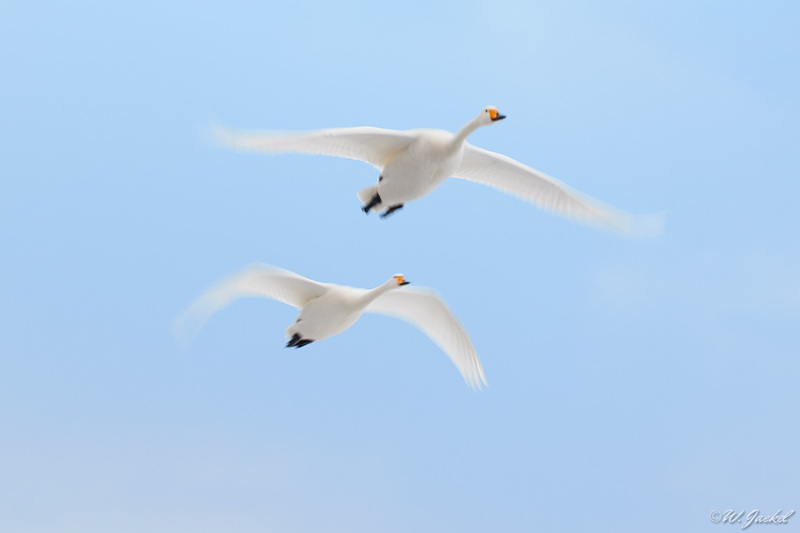 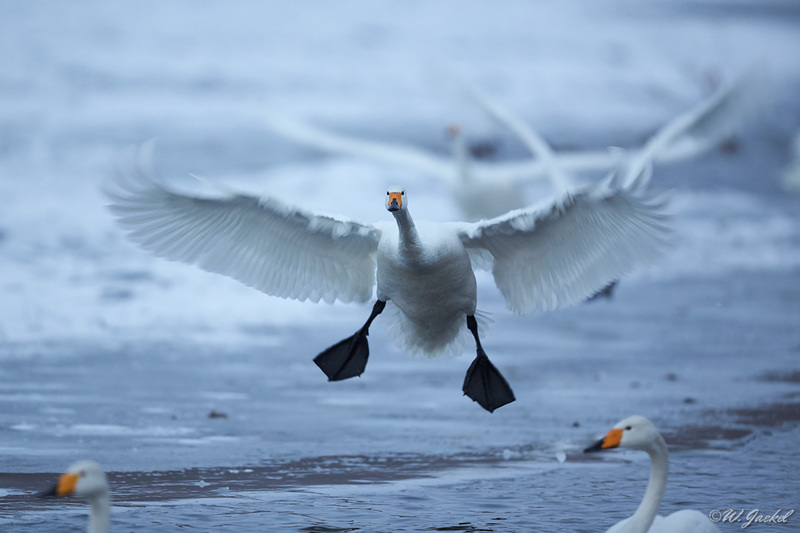 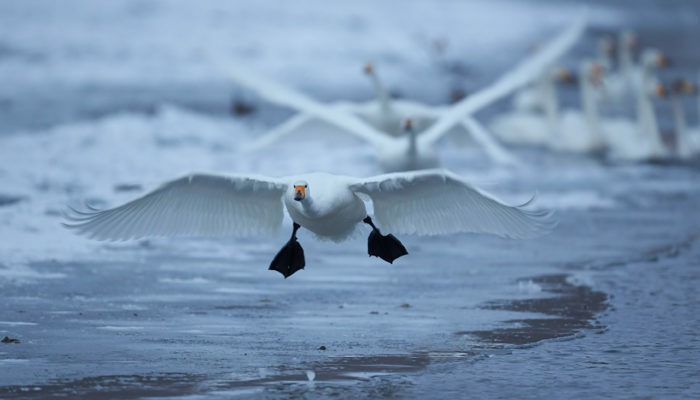 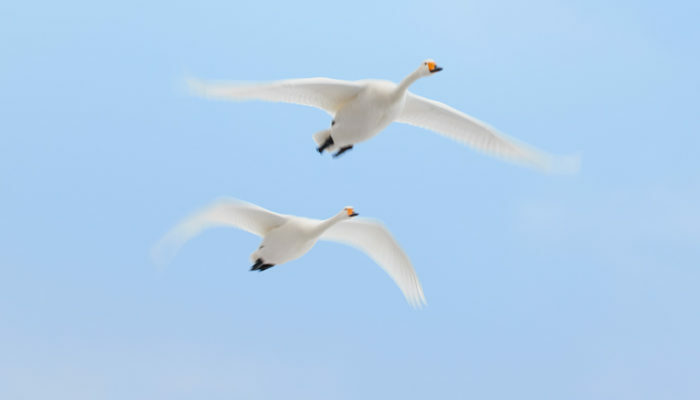 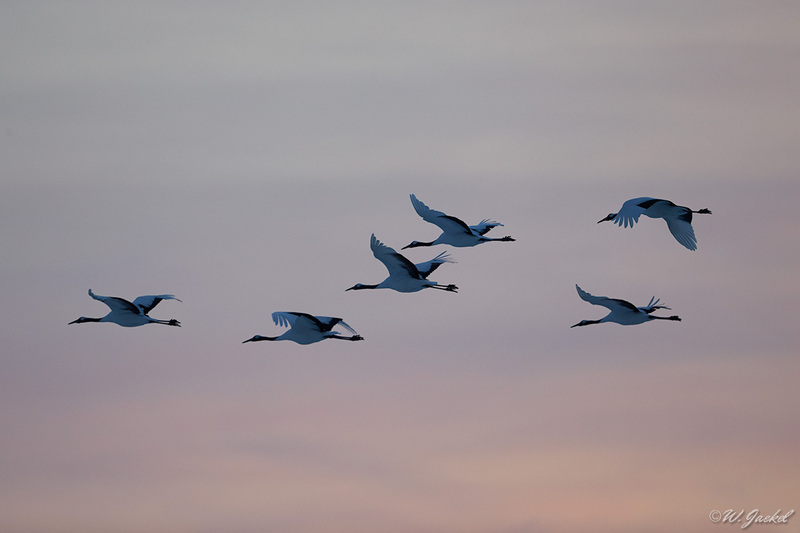 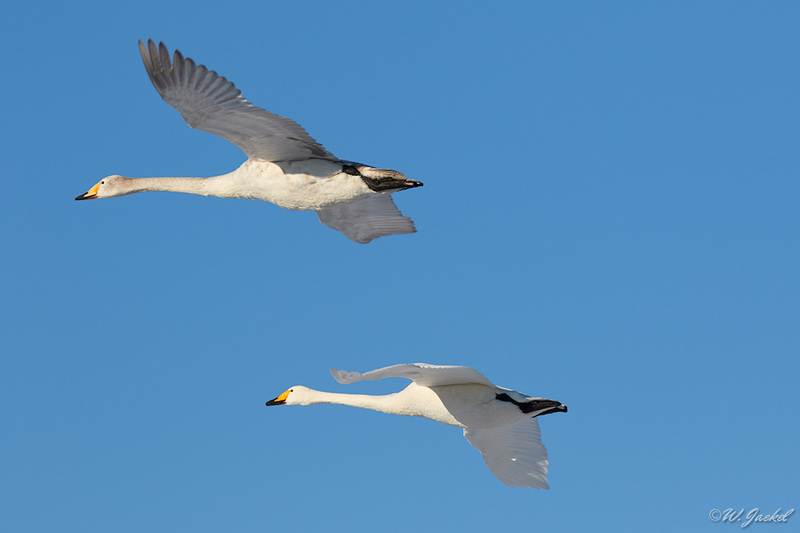 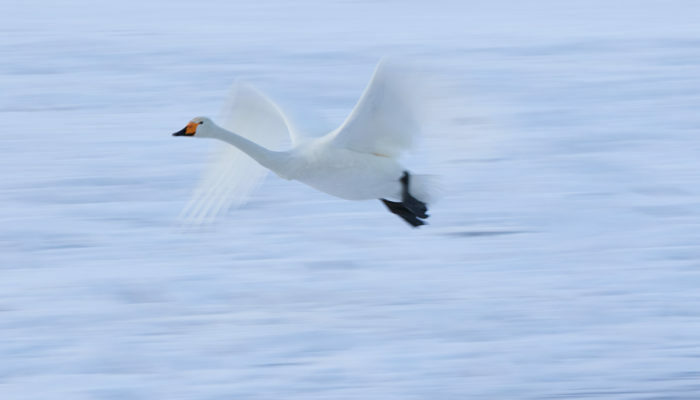 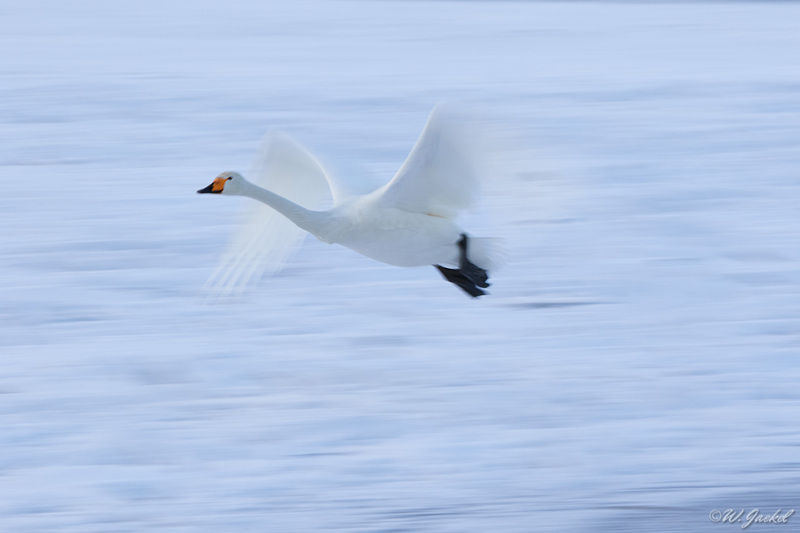 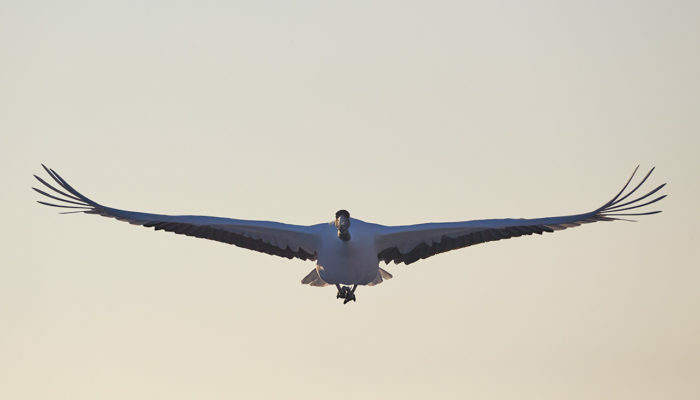 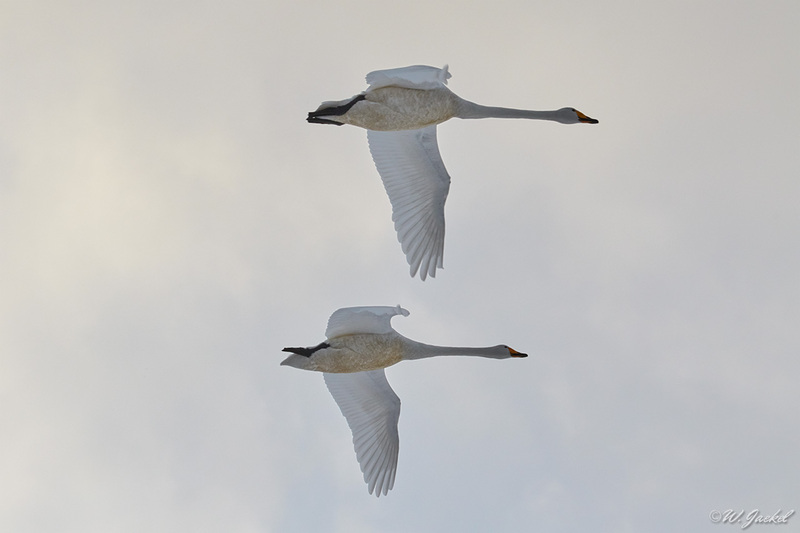 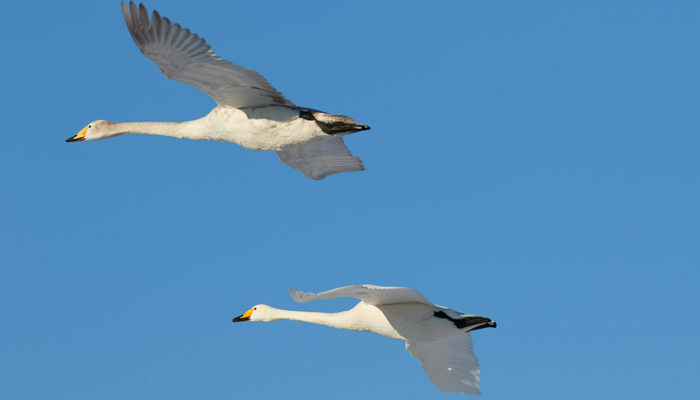 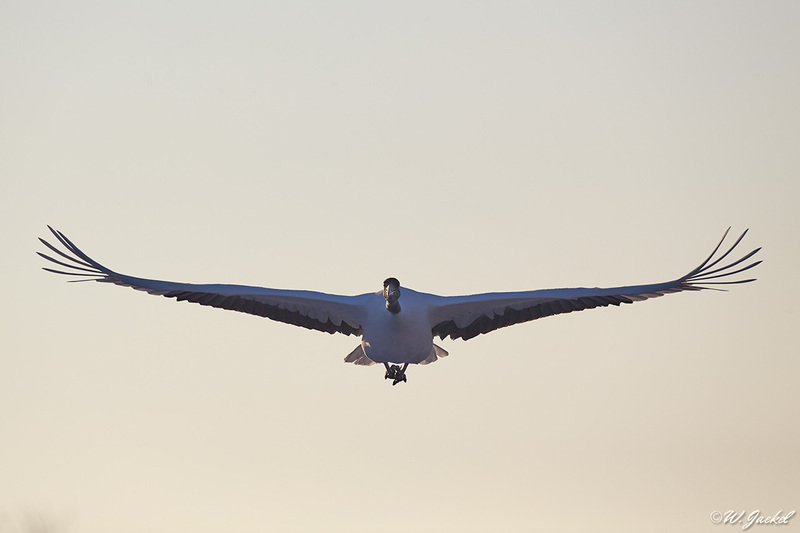 During the next 2 days we continued working on panning techniques as well as capturing environmental shots of the swans in the beautiful morning light. 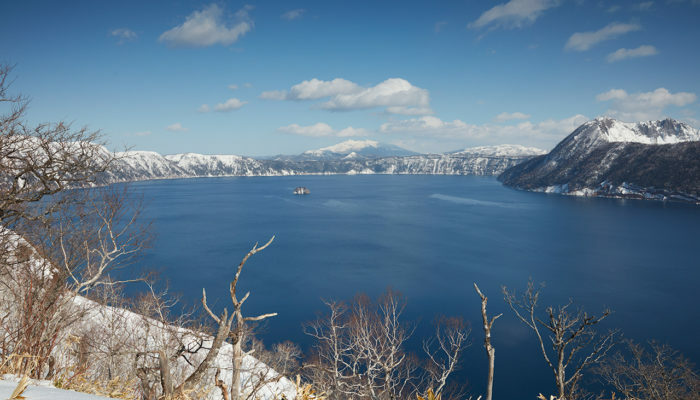 On the way to the Shiretoko Peninsula and the port town of Rausu, we stopped by at Lake Mashu and the Iouzan (Sulphur Mountain) which is an active volcano located in the Akan National Park. 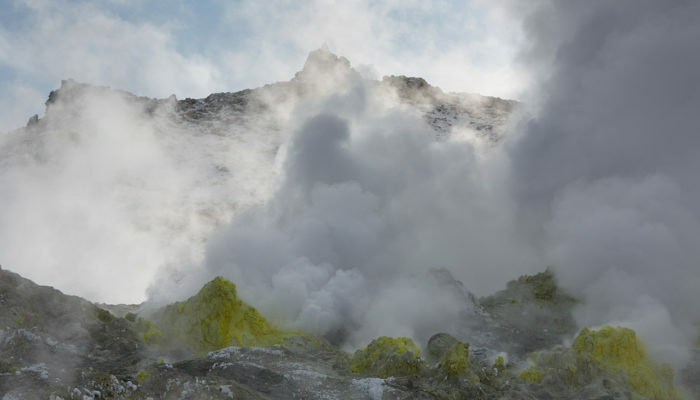 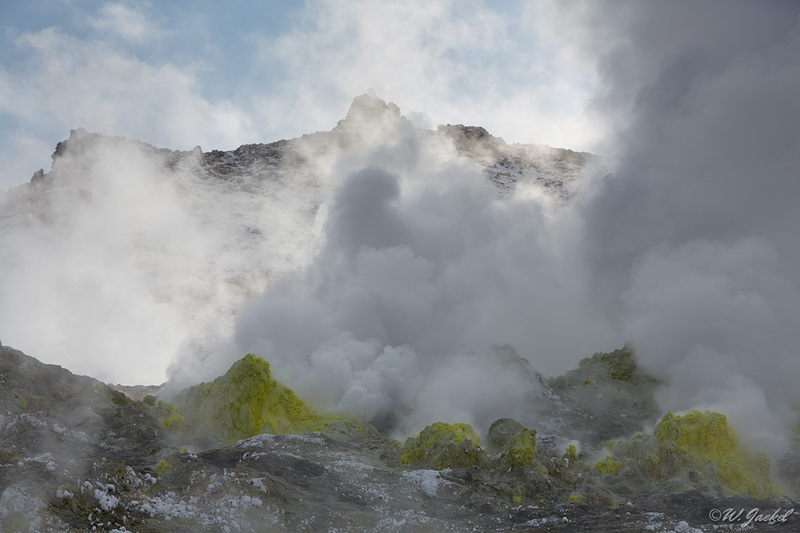 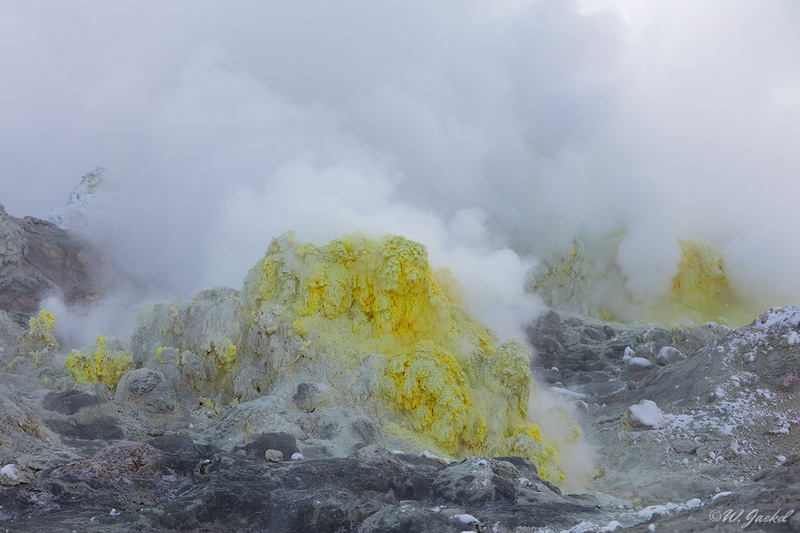 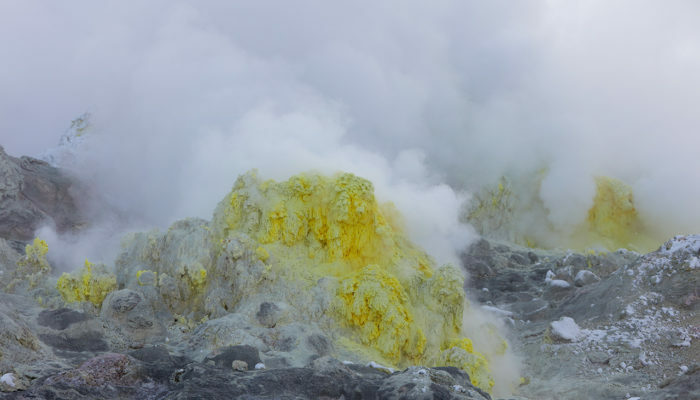 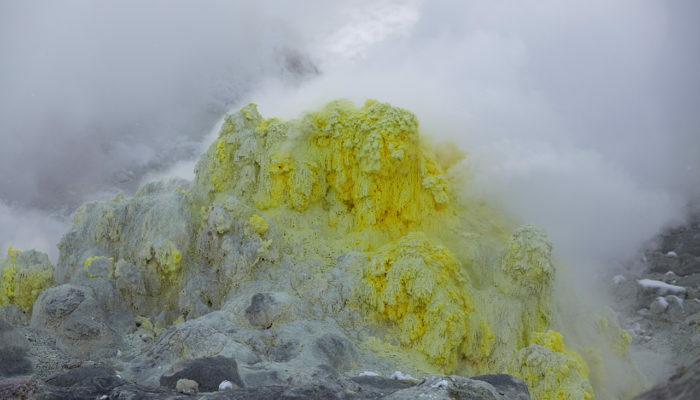 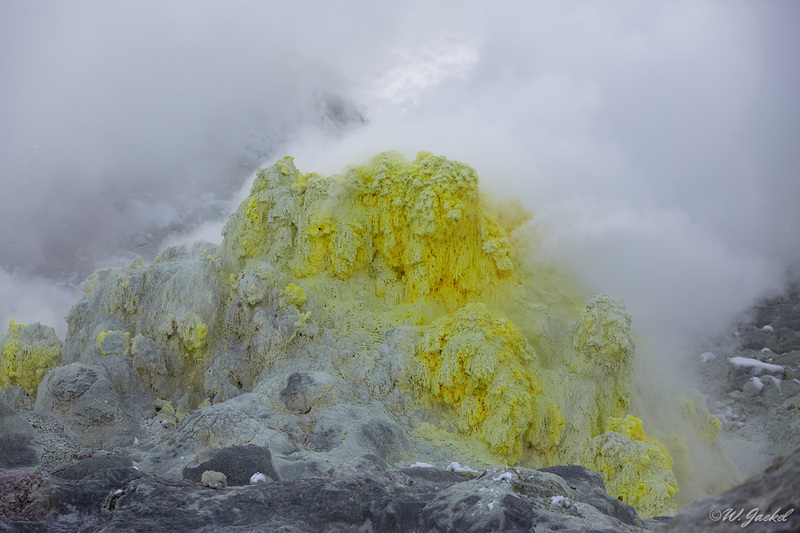 Its yellow, sulfurous vents can be viewed from a close proximity and made up for some surreal landscape shots. 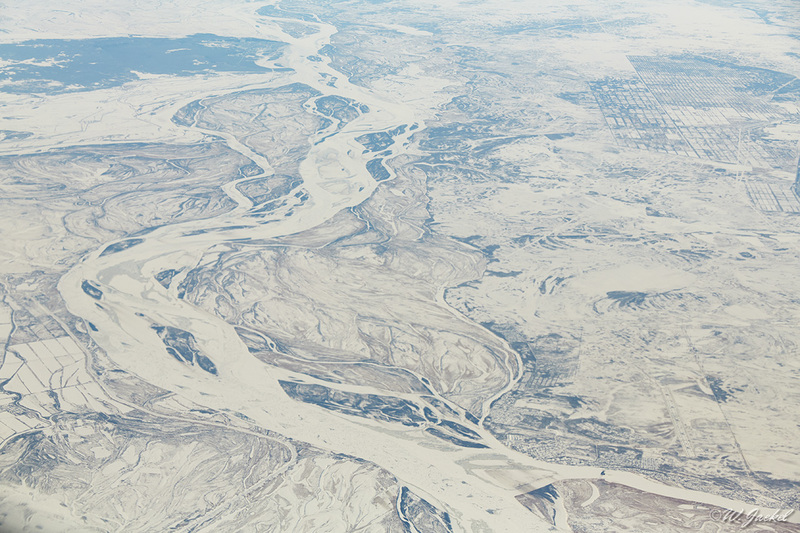 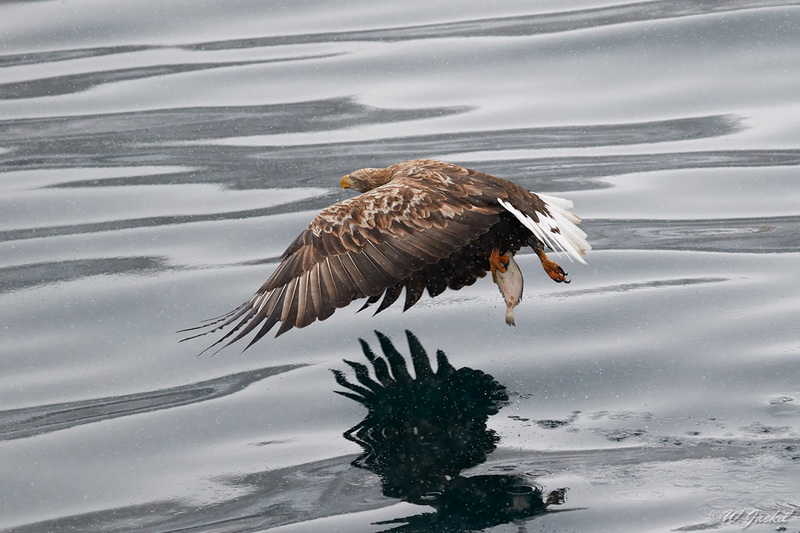 Capturing the amazing Steller’s Sea Eagles was undoubtedly one of my main motifs to join the trip. 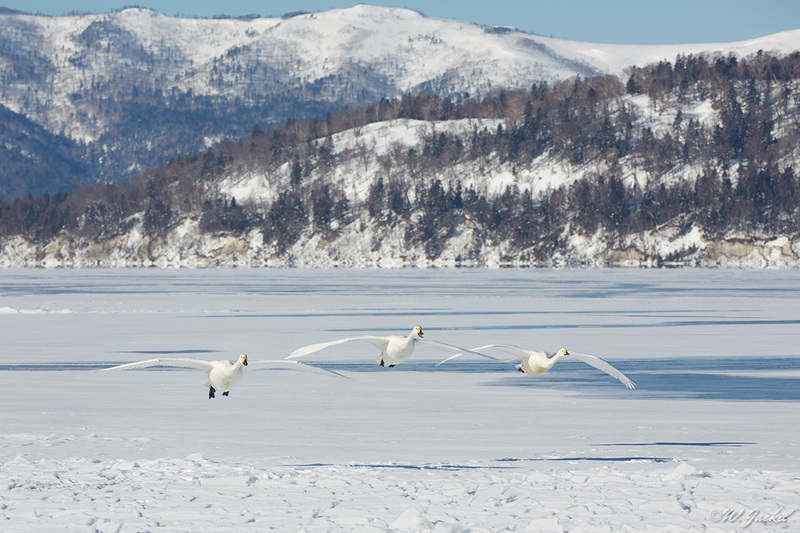 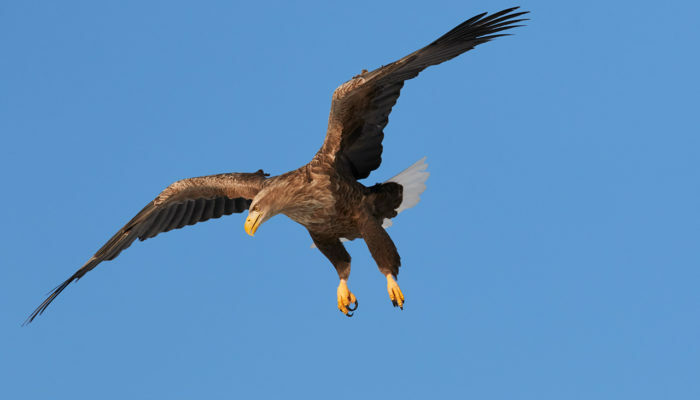 For the first time I had encountered these large and powerful birds with their wingspan up to 2,5m on my Kamchatka trips- but only from a fair distance. 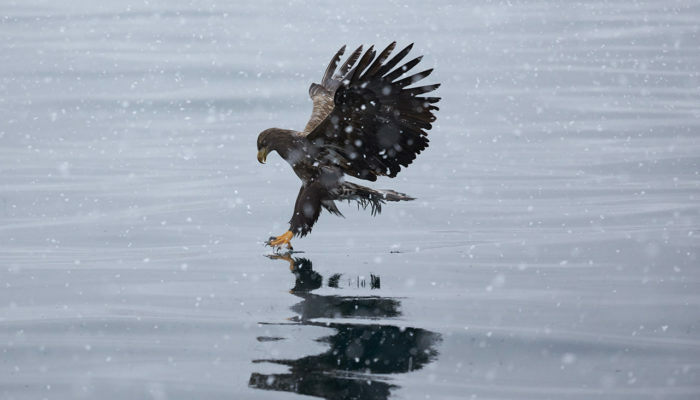 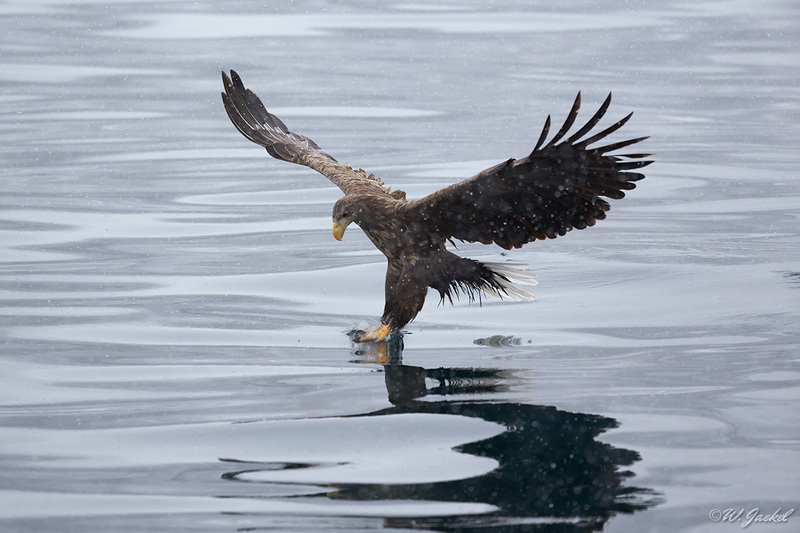 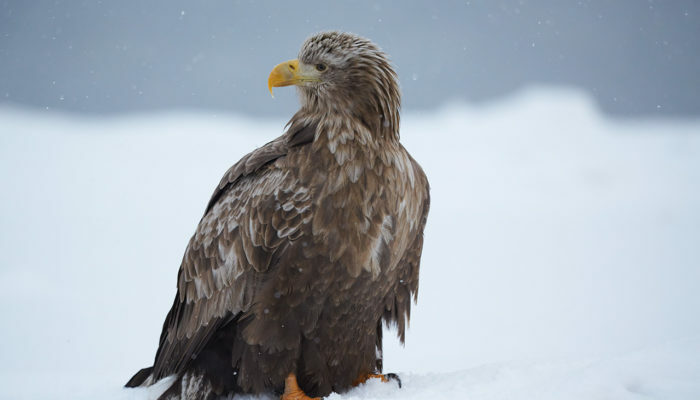 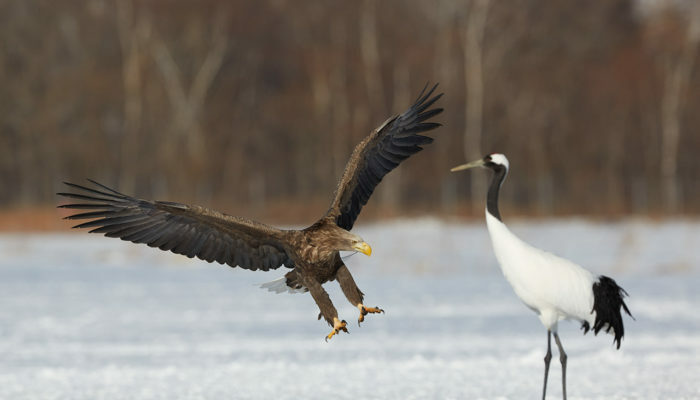 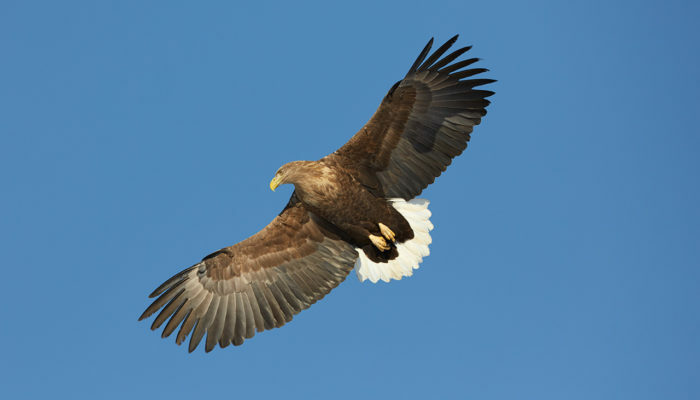 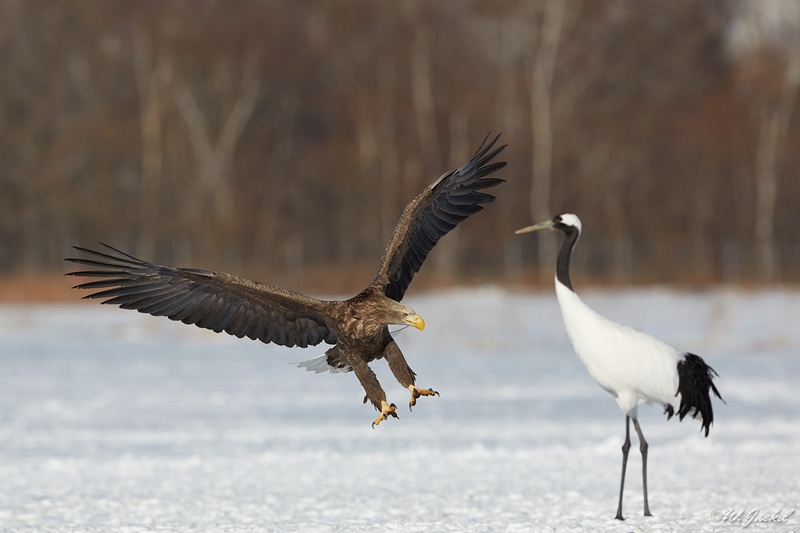 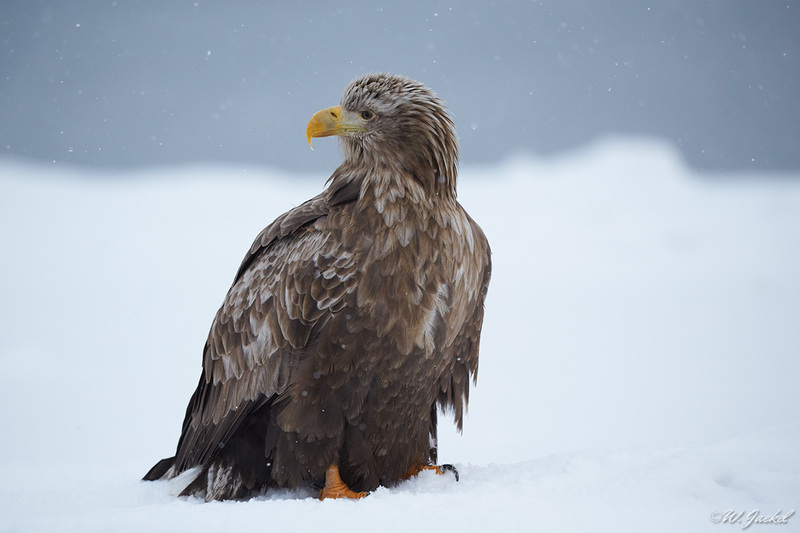 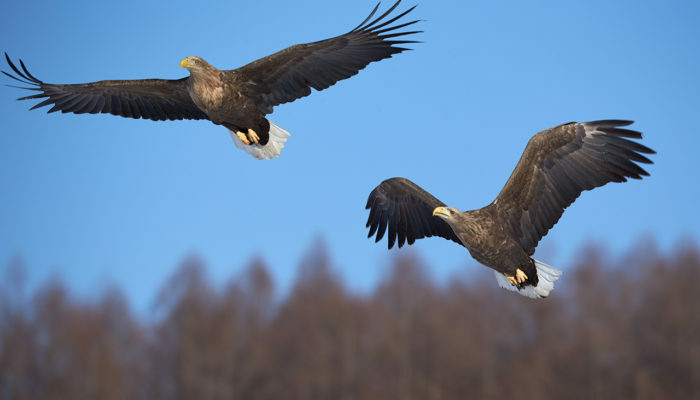 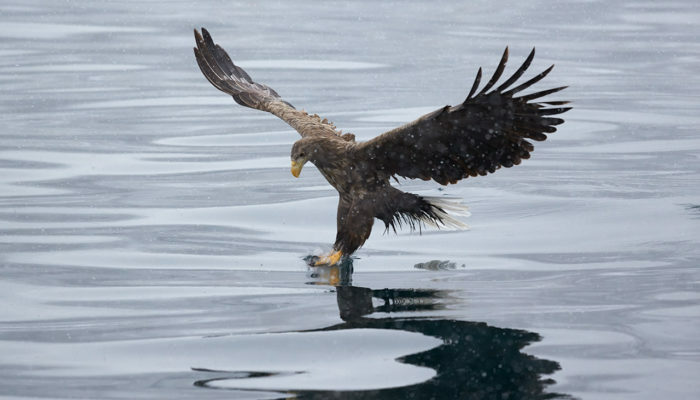 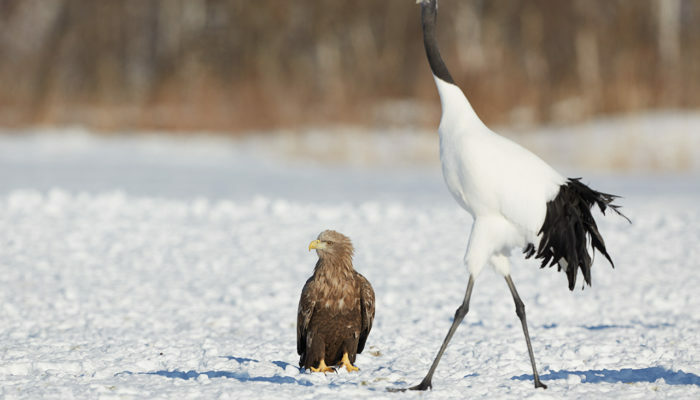 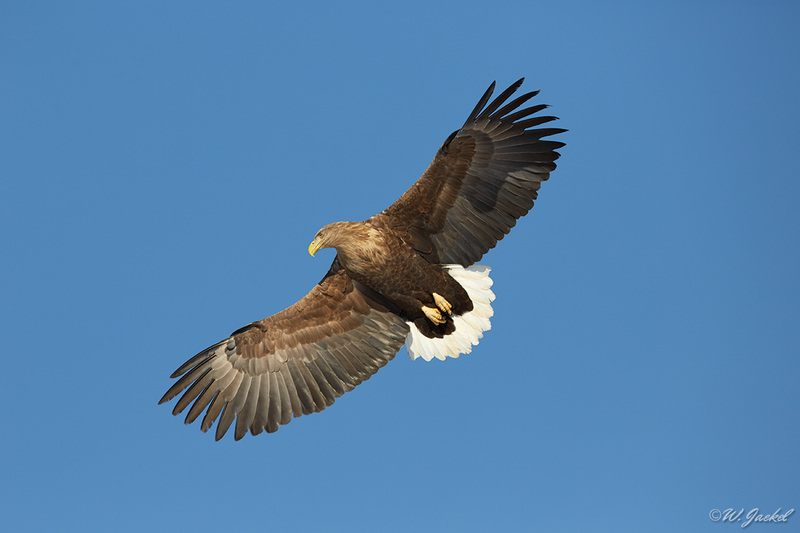 I have seen numerous beautiful photographs of the eagles sitting on ice flows off the coast of Hokkaido or interacting there with white-tailed sea eagles, too. 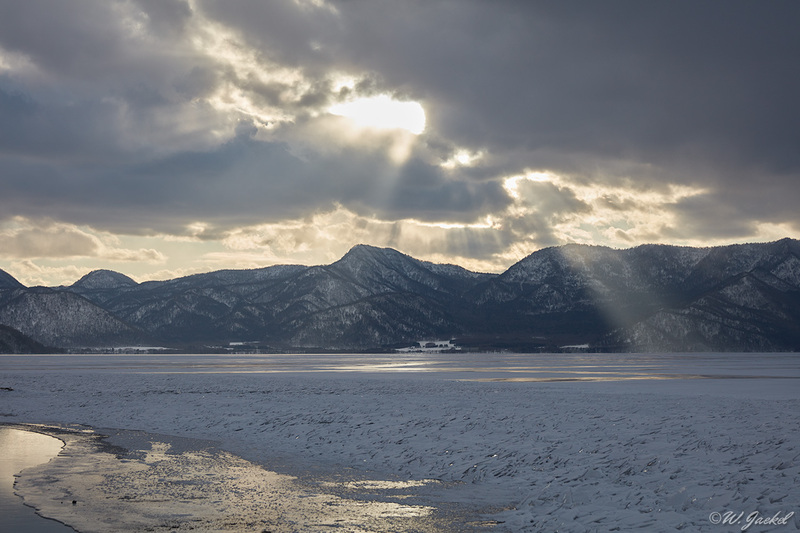 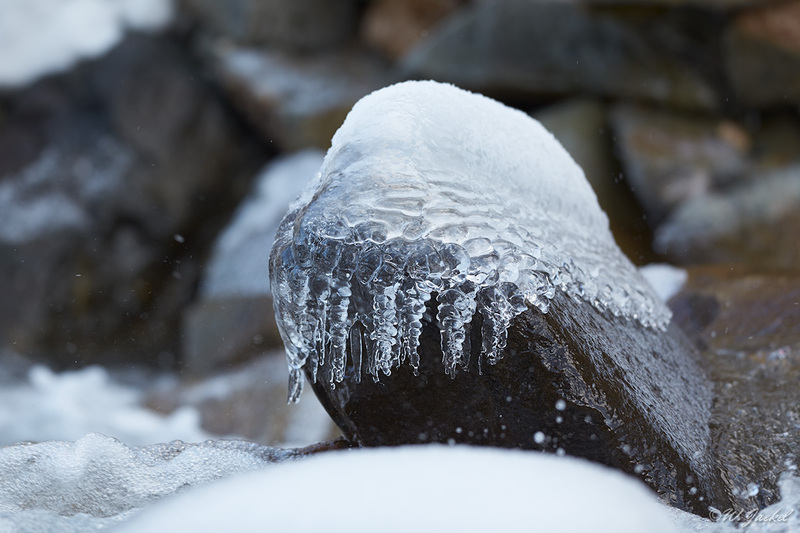 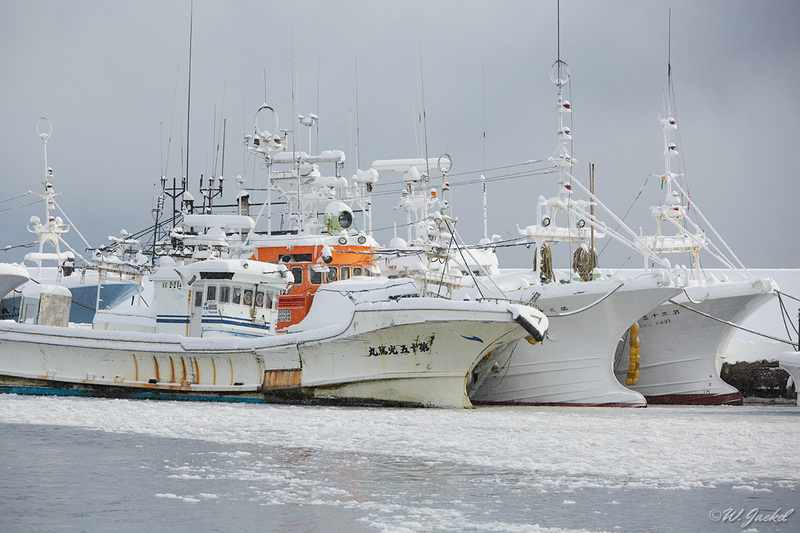 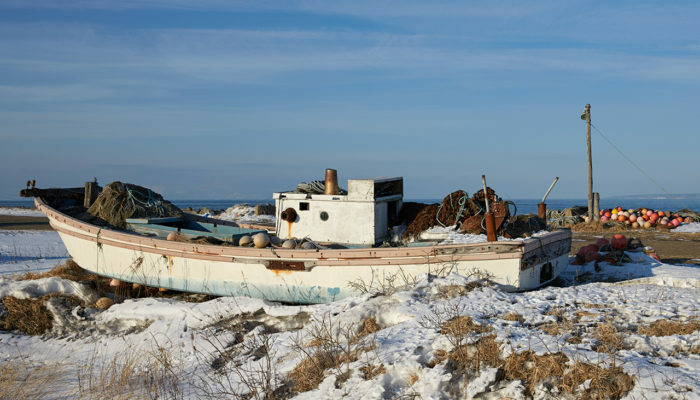 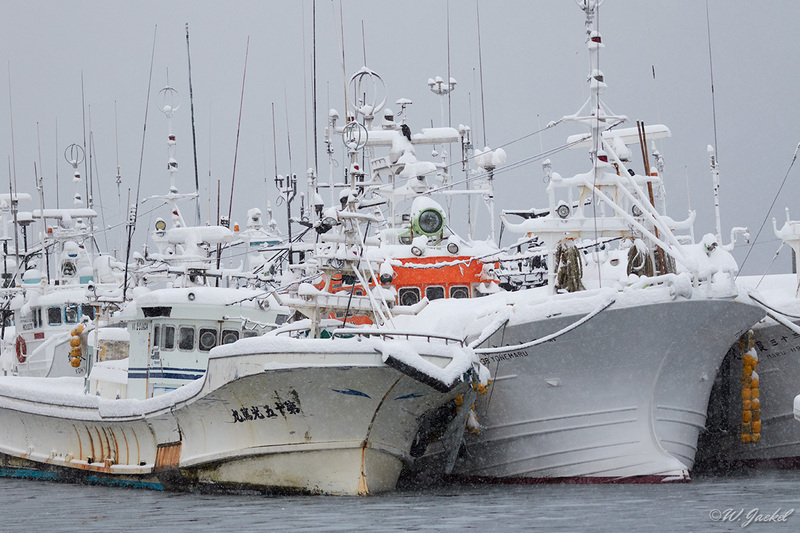 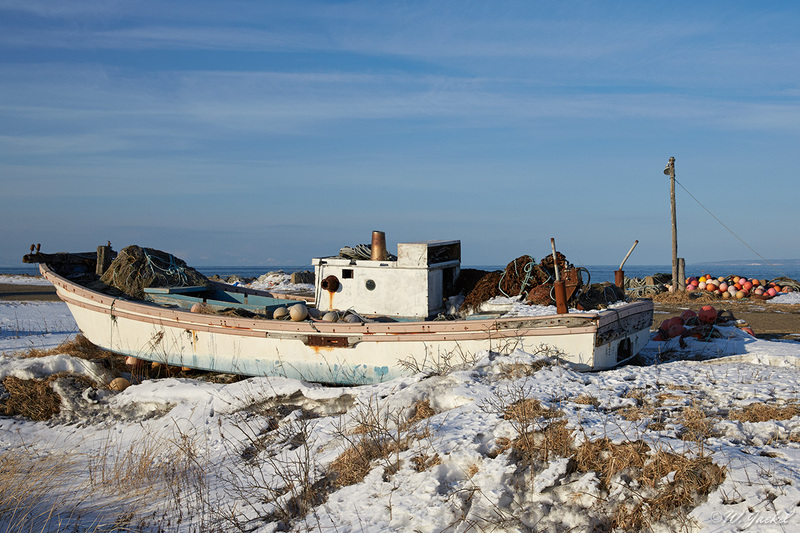 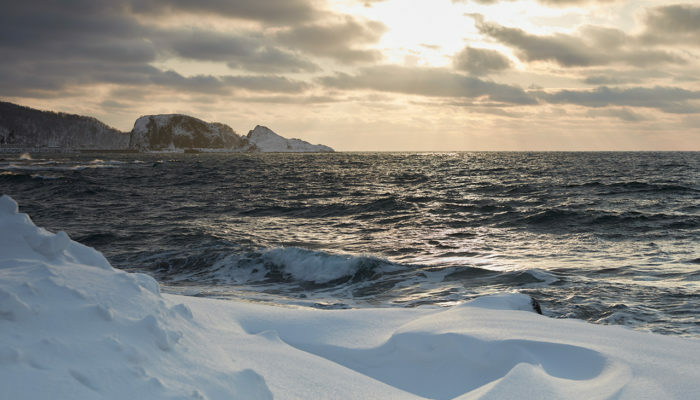 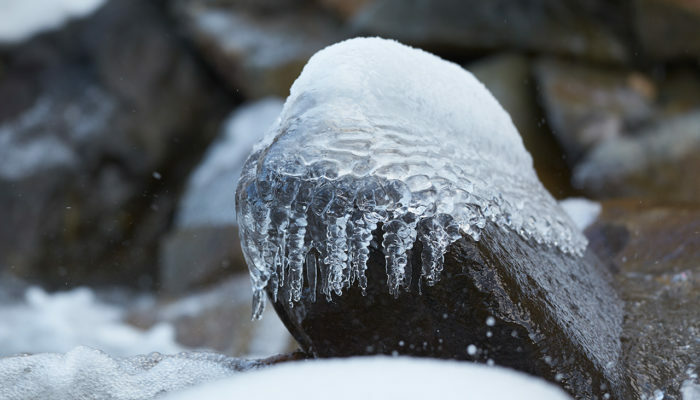 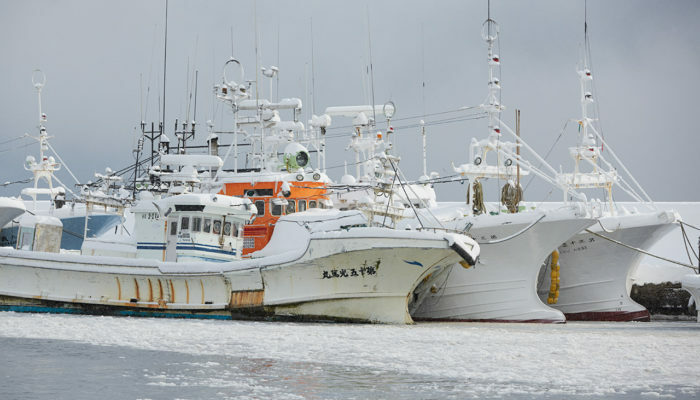 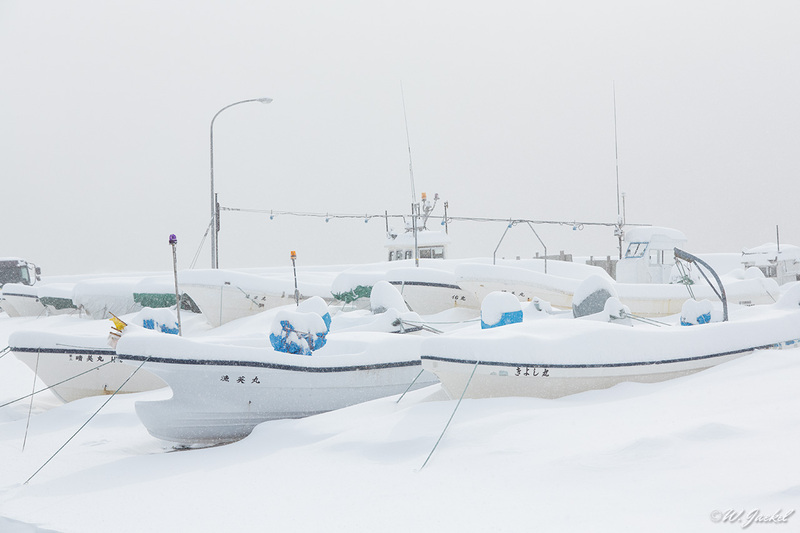 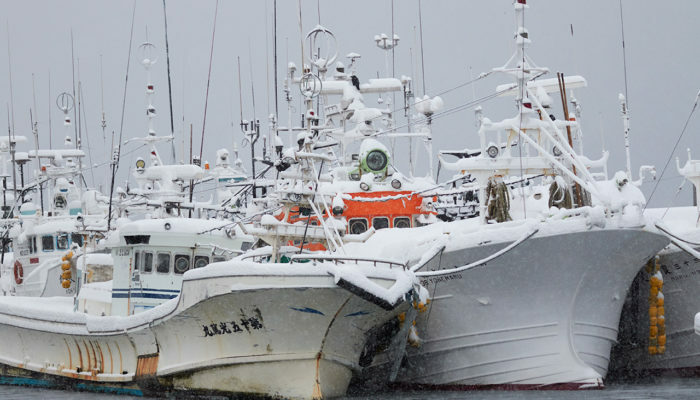 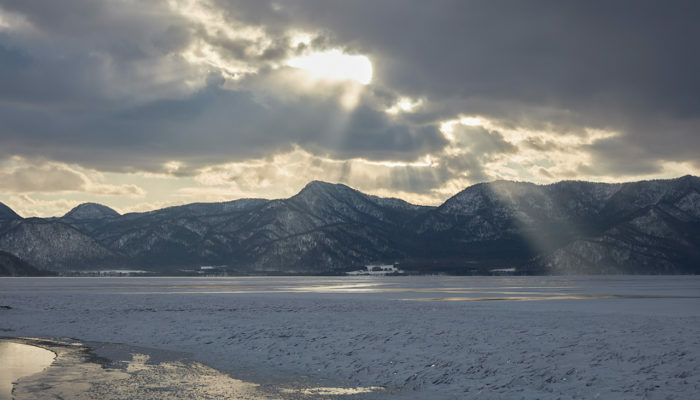 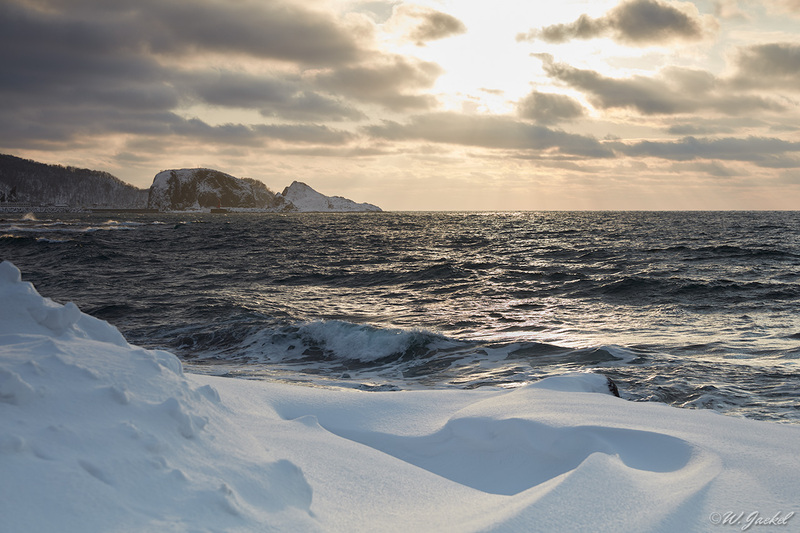 Unfortunately, with 2016 being an el niño year and the winter being one of the mildest ever recorded in Japan, the sea ice which normally comes down from Siberia through the Nemuro Strait and Sea of Okhotsk was nowhere to be seen during our 3days stay at Rausu. 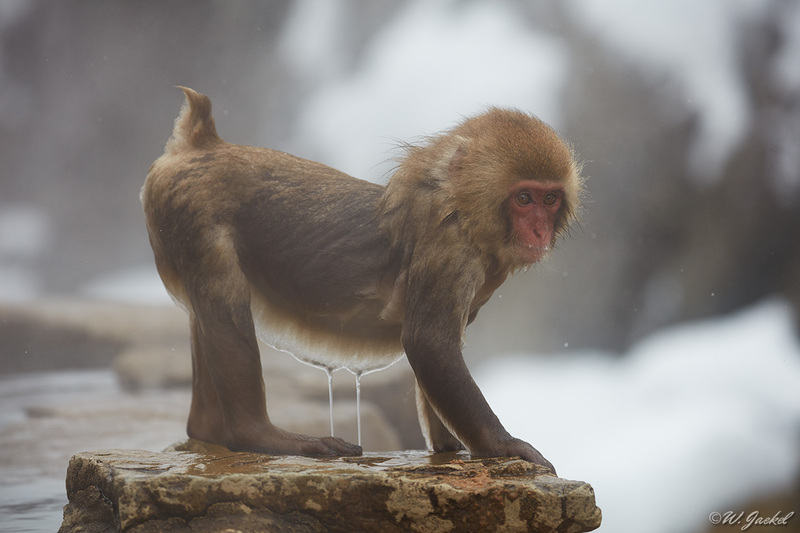 This was a big disappointment for me, at first. 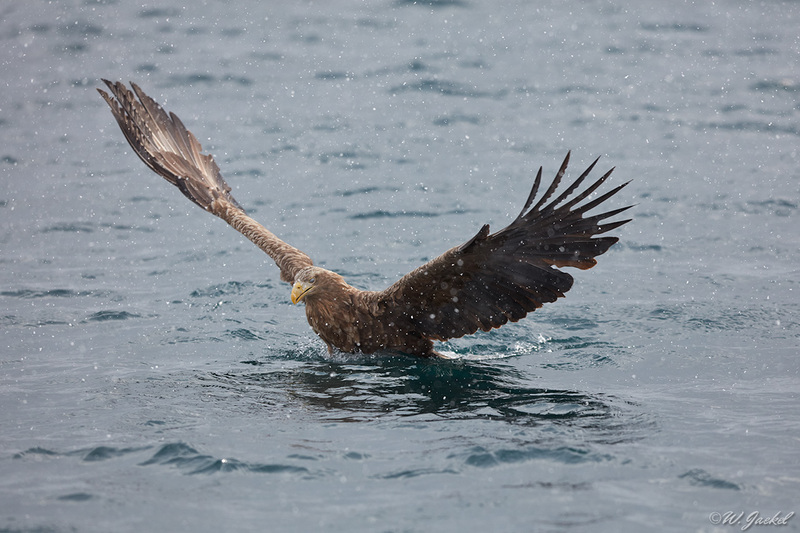 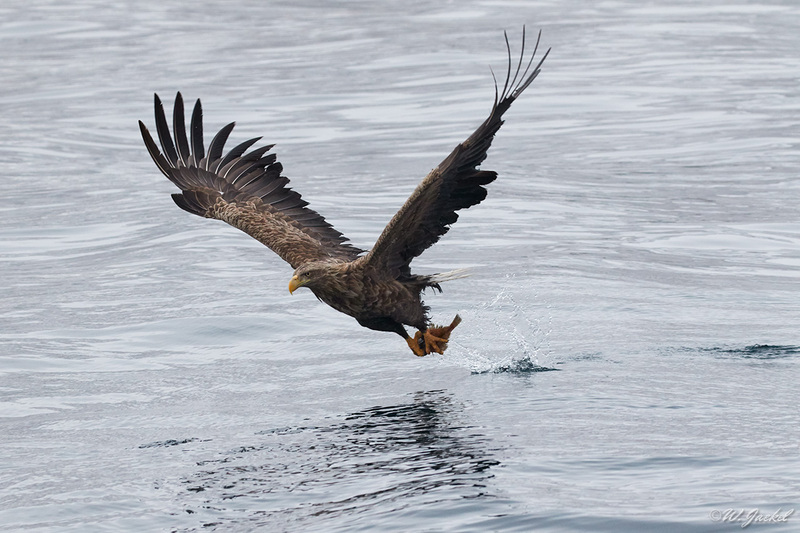 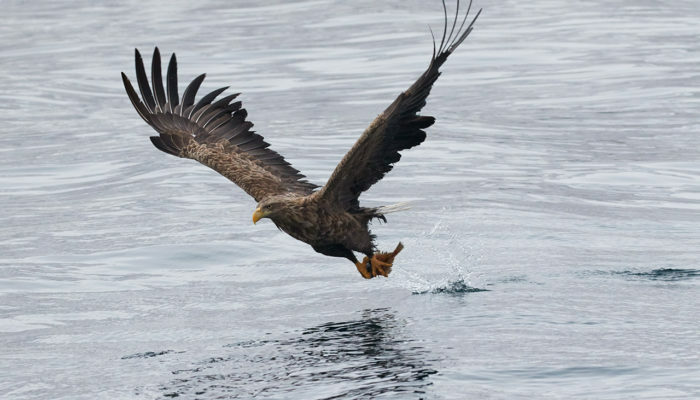 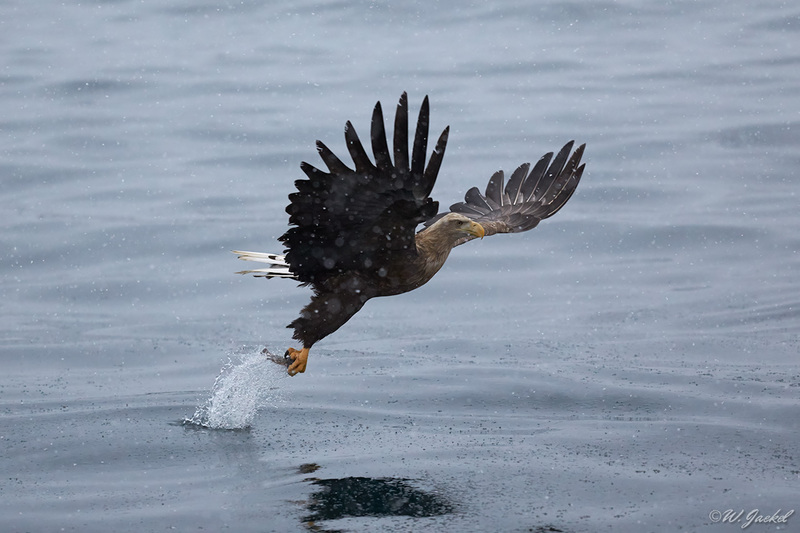 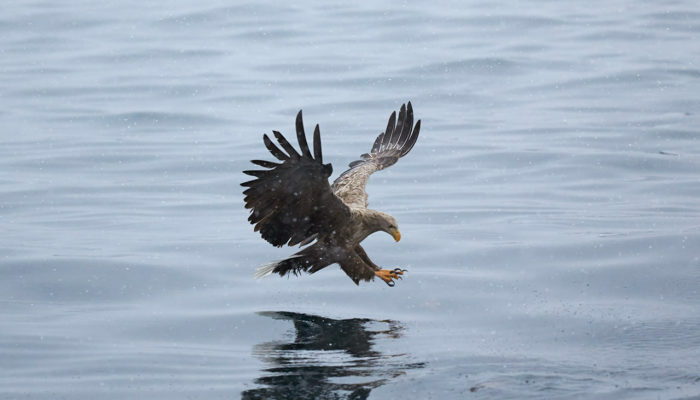 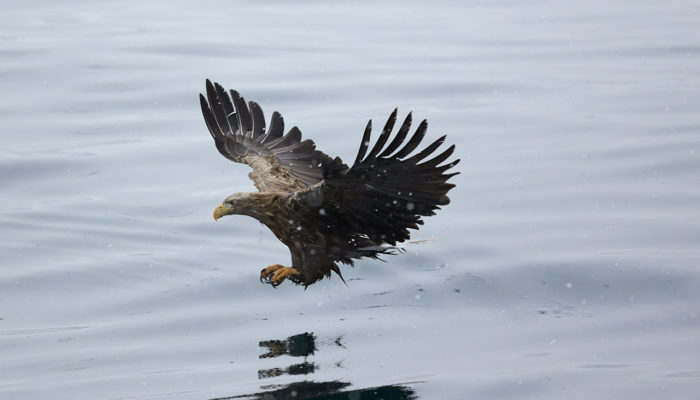 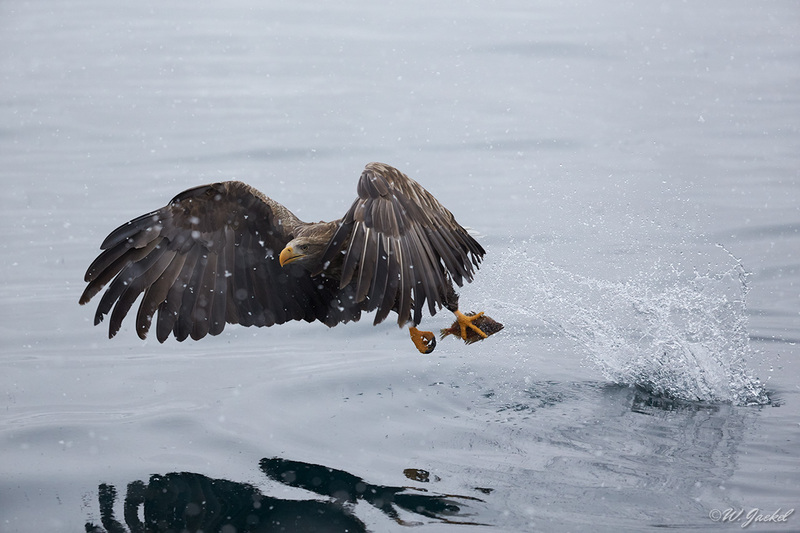 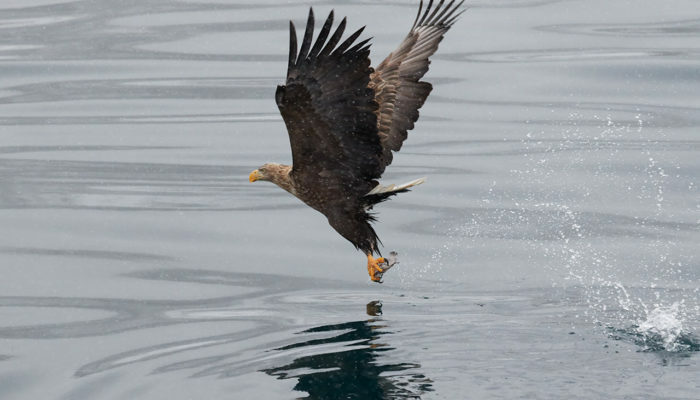 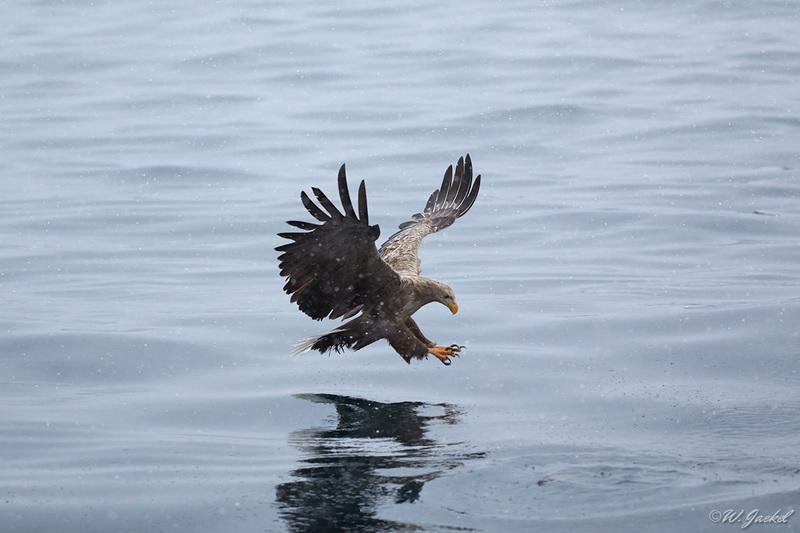 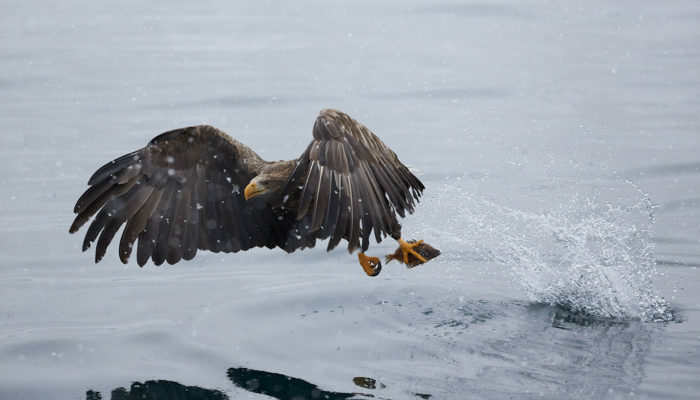 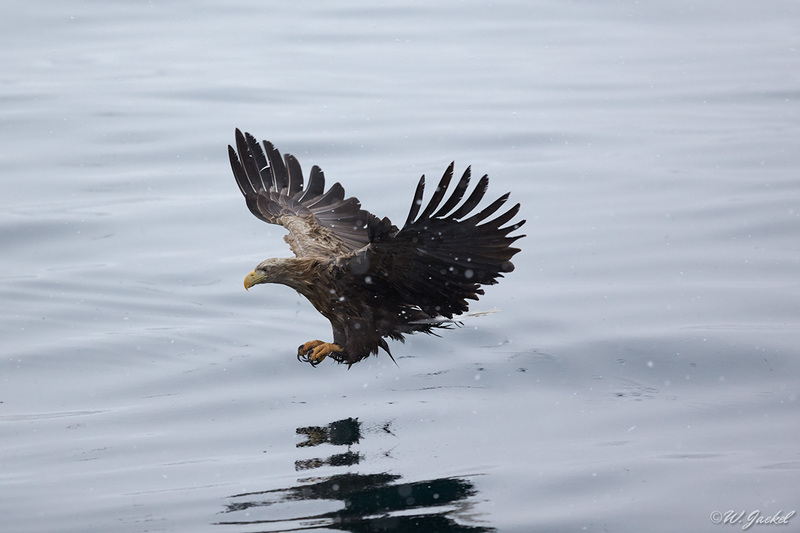 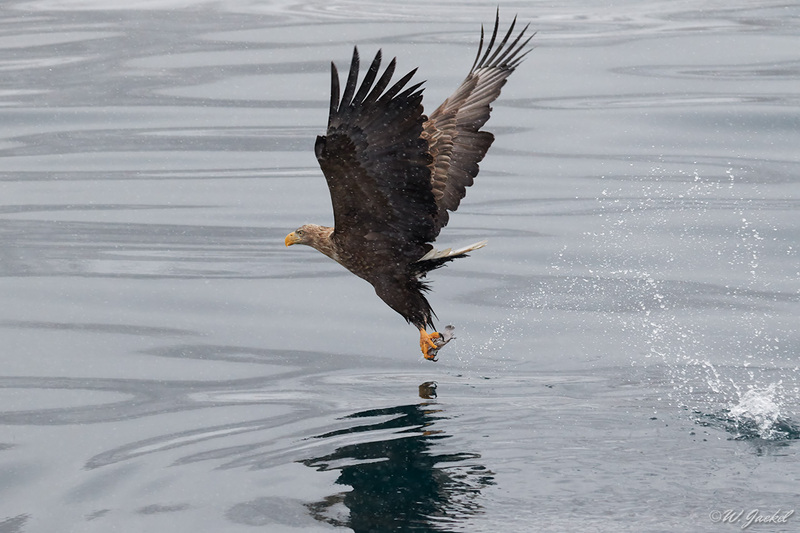 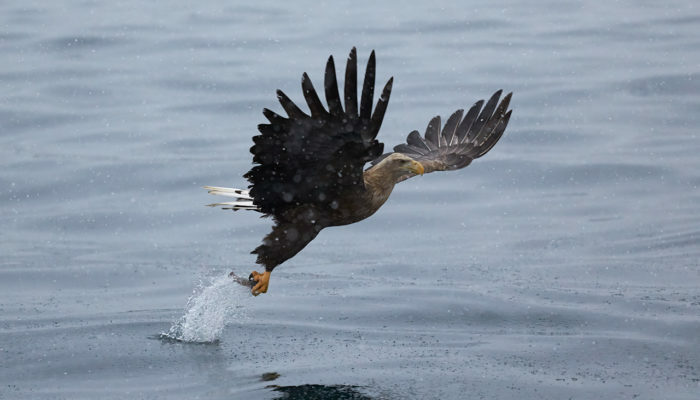 We took the boat out anyway on all 3 mornings, and the skippers threw fish into the sea, which the Steller’s Sea Eagles and White-Tailed Sea Eagles came down to catch. 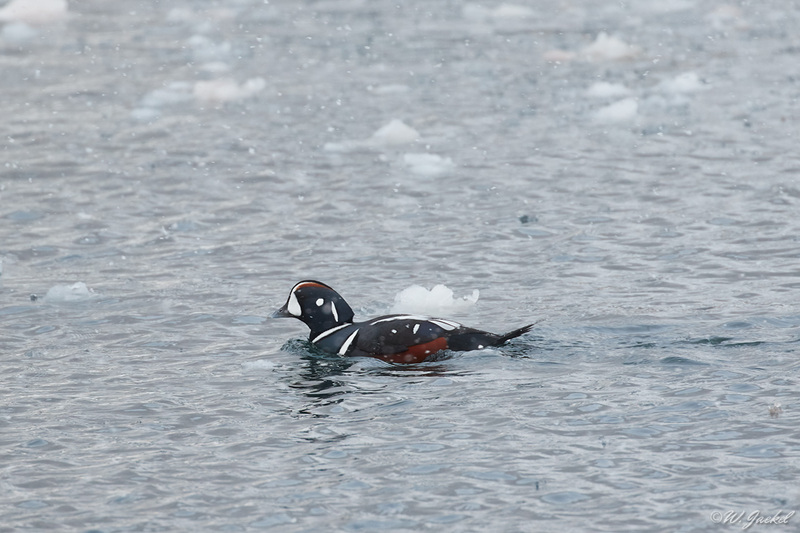 Despite the missing sea ice and partially challenging conditions because of the heavy cloud cover it was a great experience. 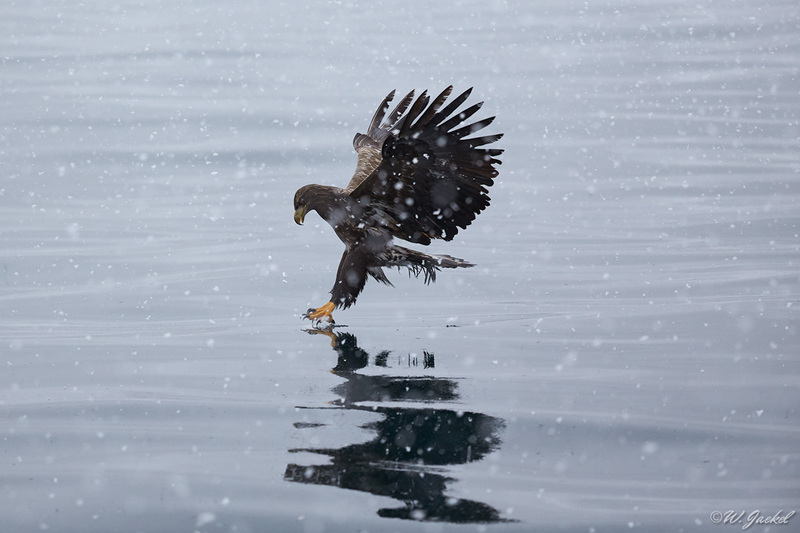 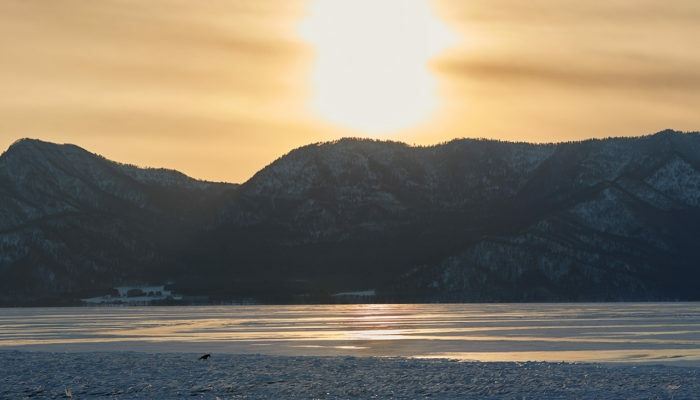 In the end I had got hundreds of good shots of the eagles catching the fish and admitted, it certainly looks more natural with the eagles taking the fish from the water rather than off the sea ice. 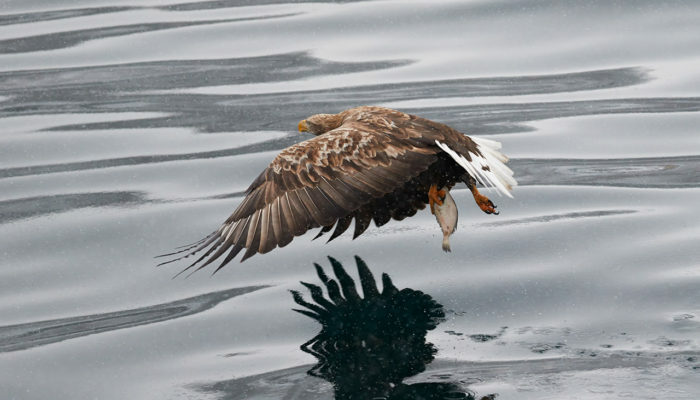 But of course, photographing the eagles sitting on top of a niece piece of sea ice would have been amazing, too. 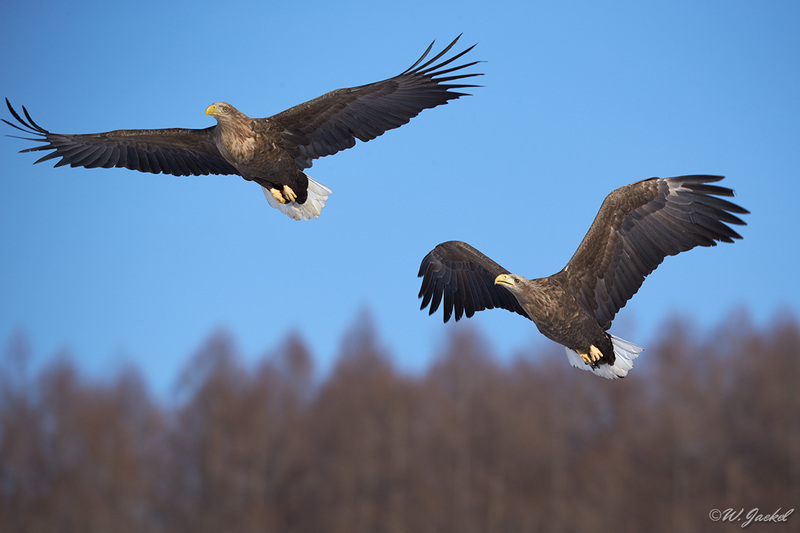 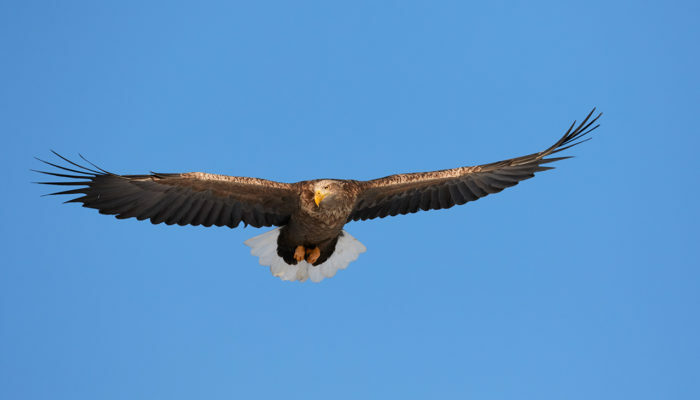 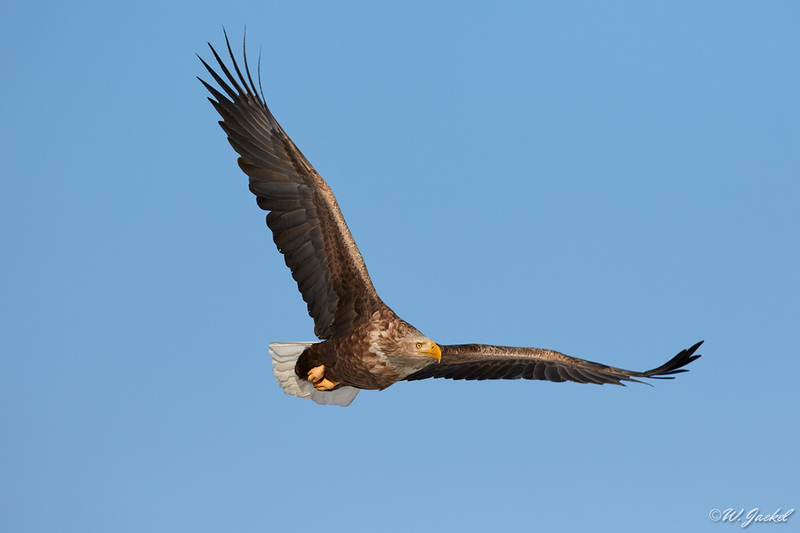 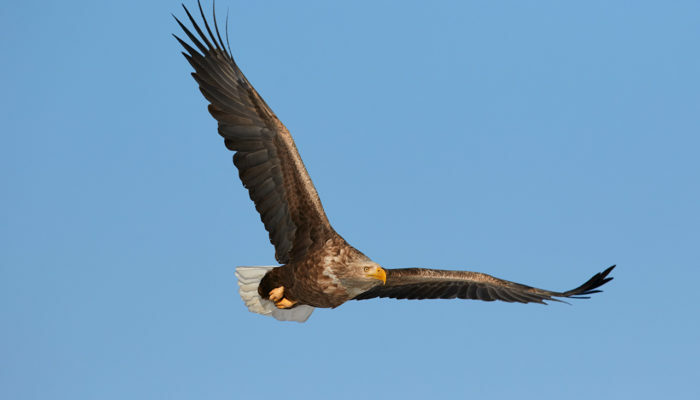 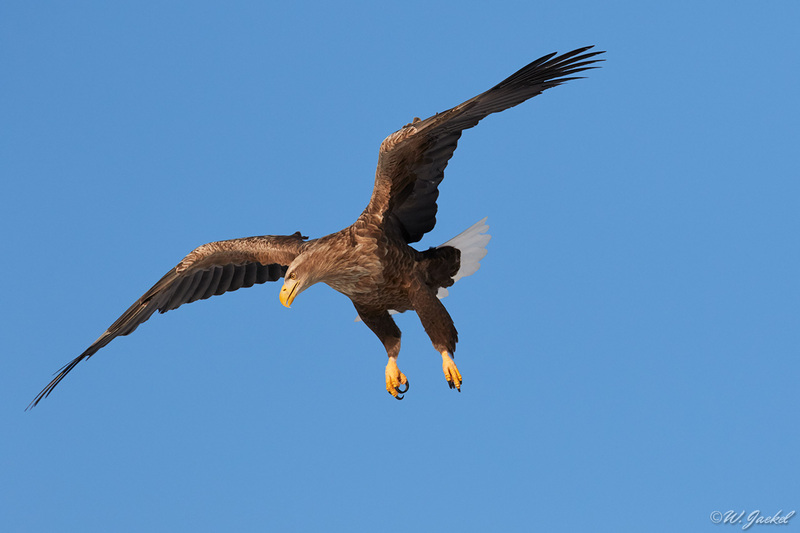 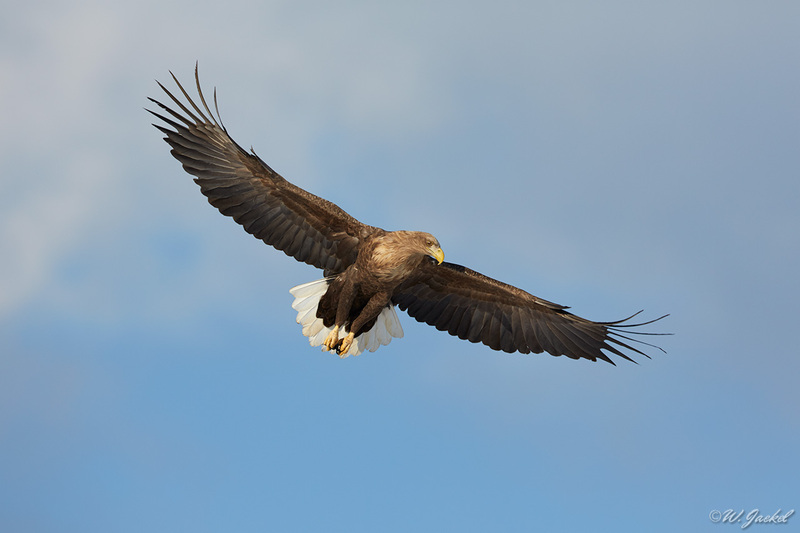 For shooting the eagles in flight I mainly used the 200-400mm/f4+1,4Ext and 100-400mm/f 4.5-5.6 II. 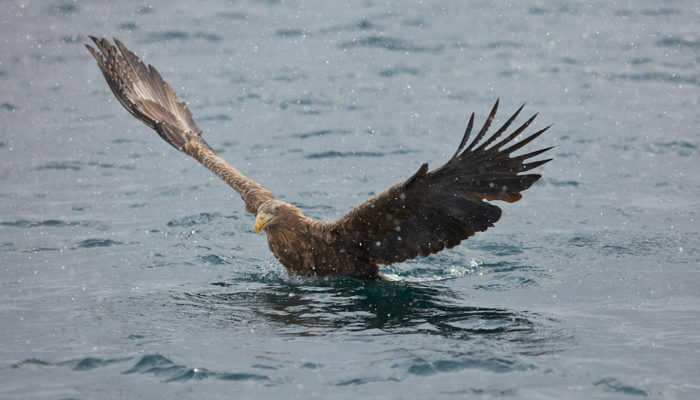 Retrospectively I rather would skip the fairly heavy 200-400mm on the bumpy boat and just go for the lighter 100-400mm which is more flexible there and offers very good image quality on the 7d Mark II, 1 Dx and even 5DsR. 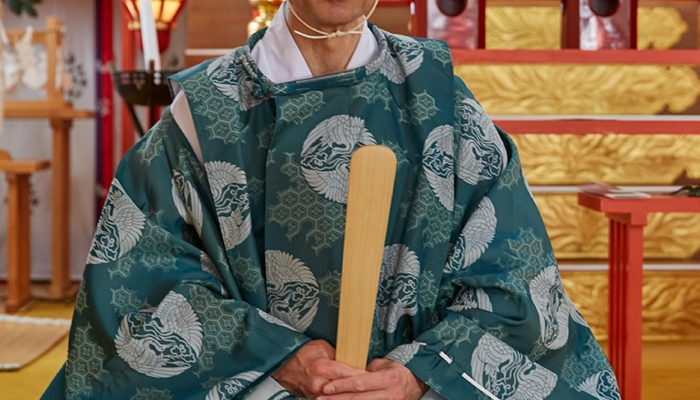 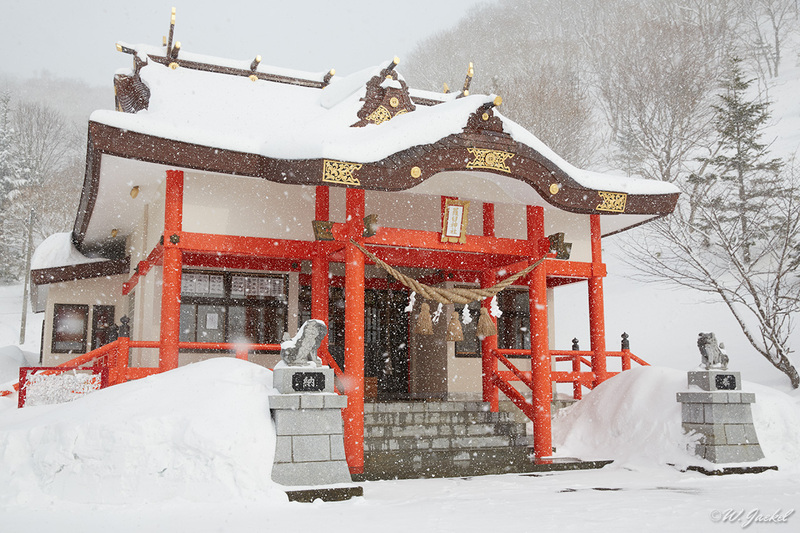 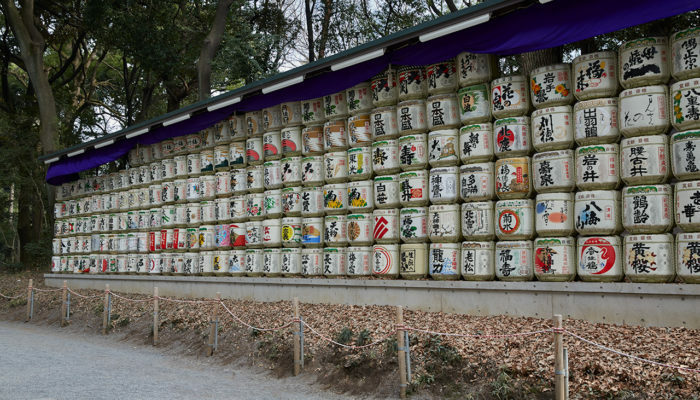 In Rausu we also visited a Shinto Shrine,attended the ceremony and received a traditional Shinto blessing there. 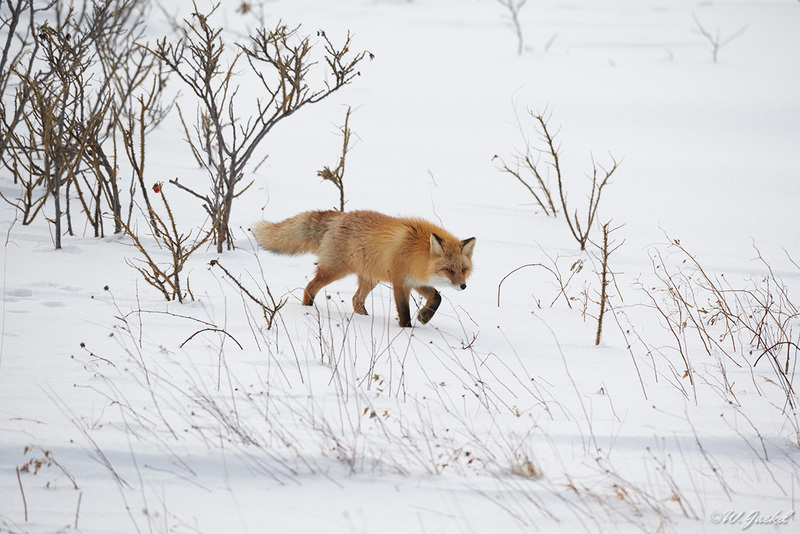 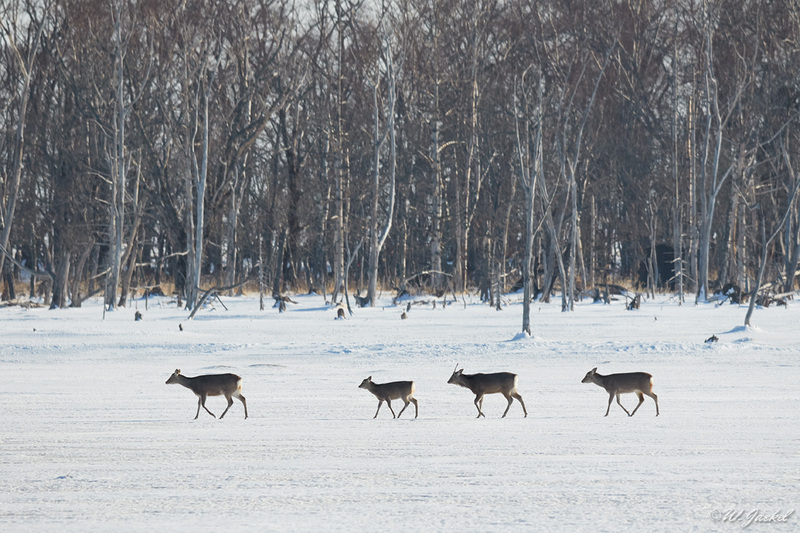 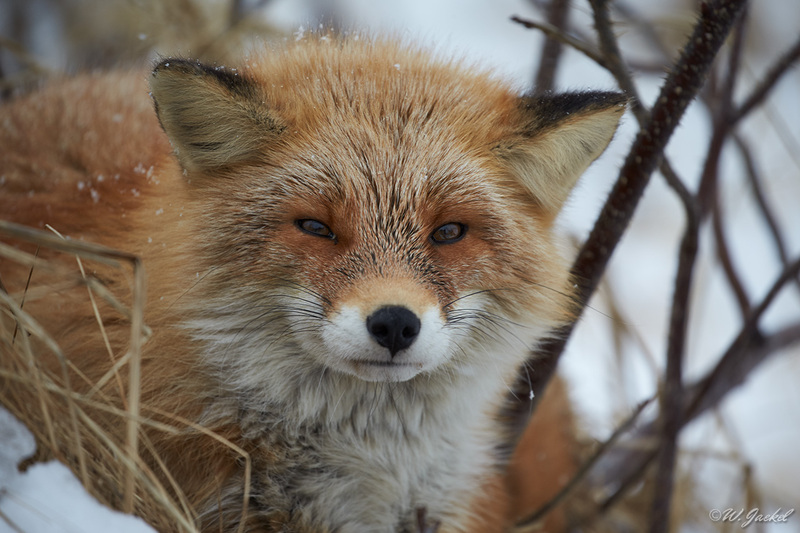 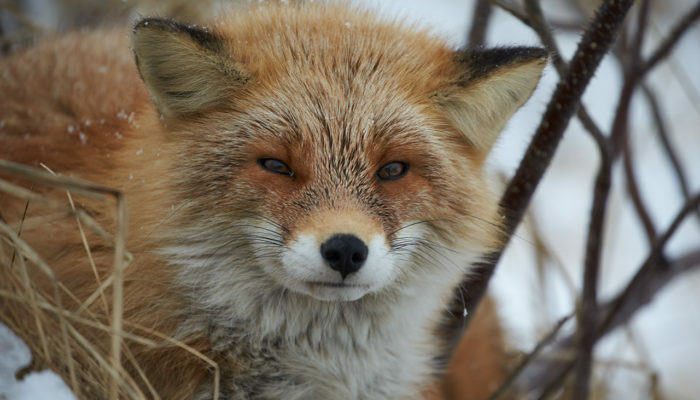 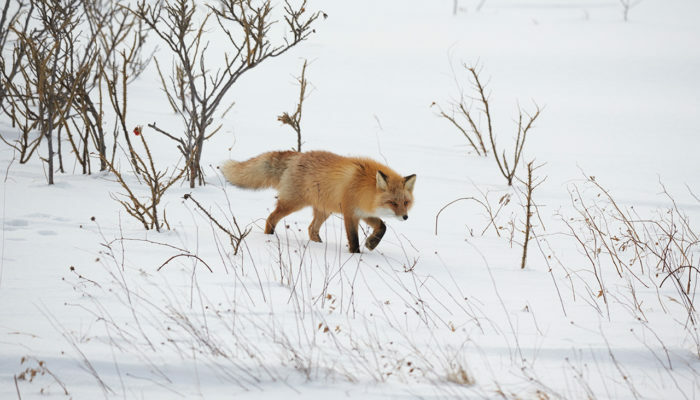 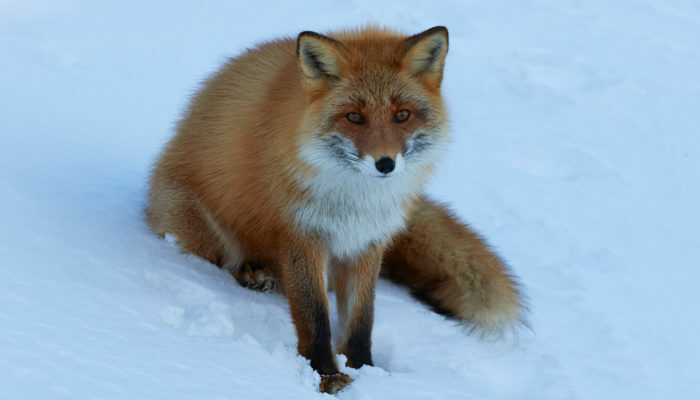 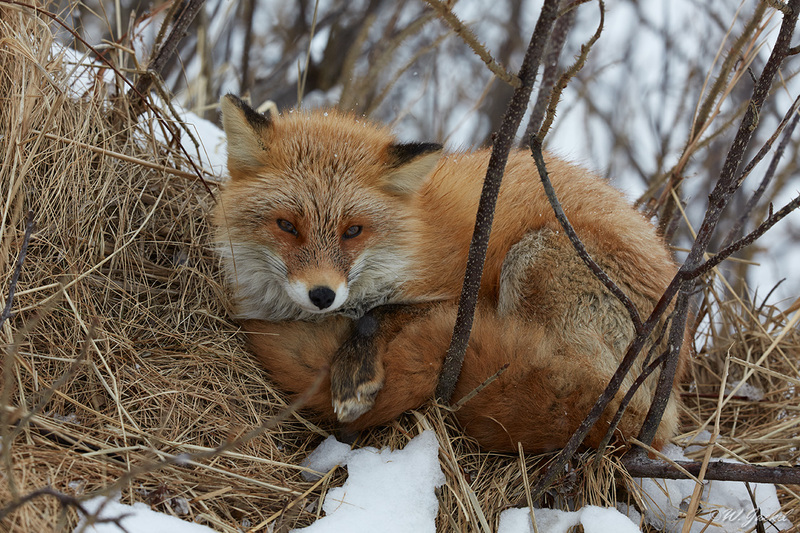 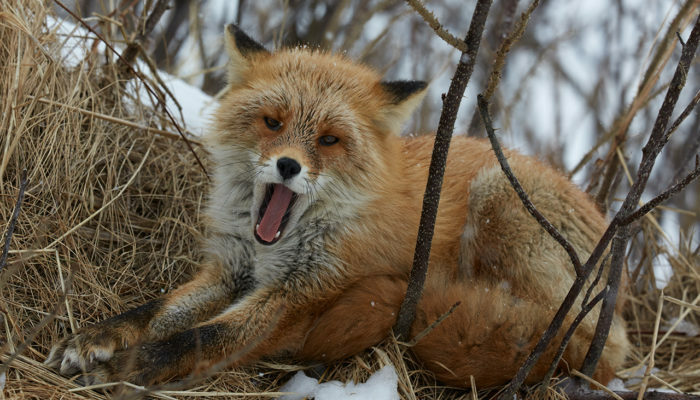 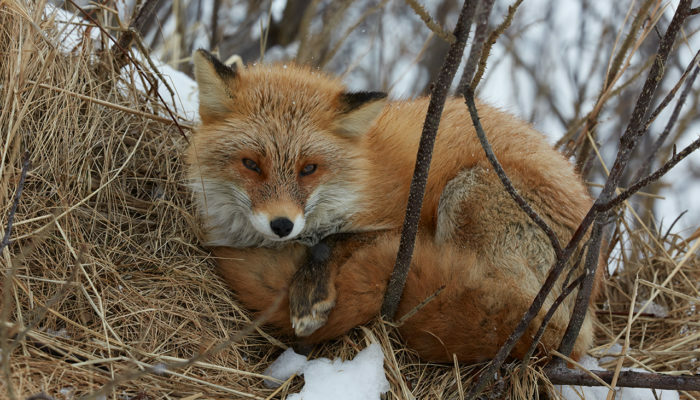 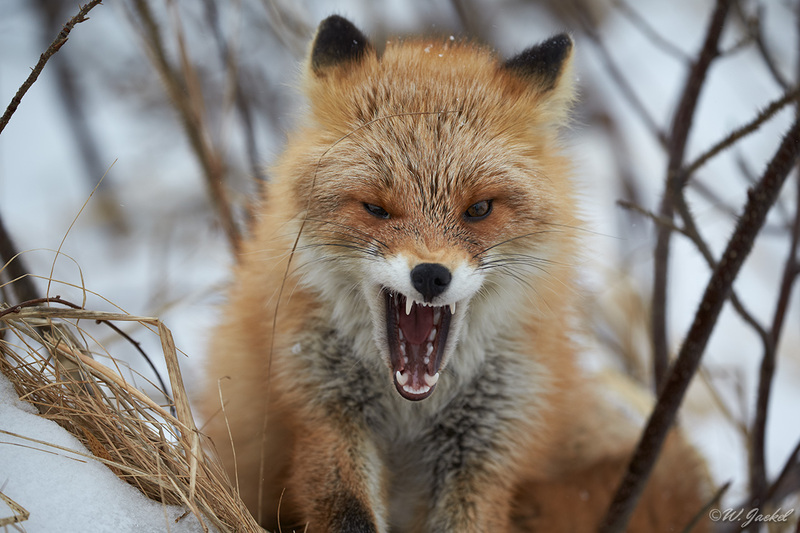 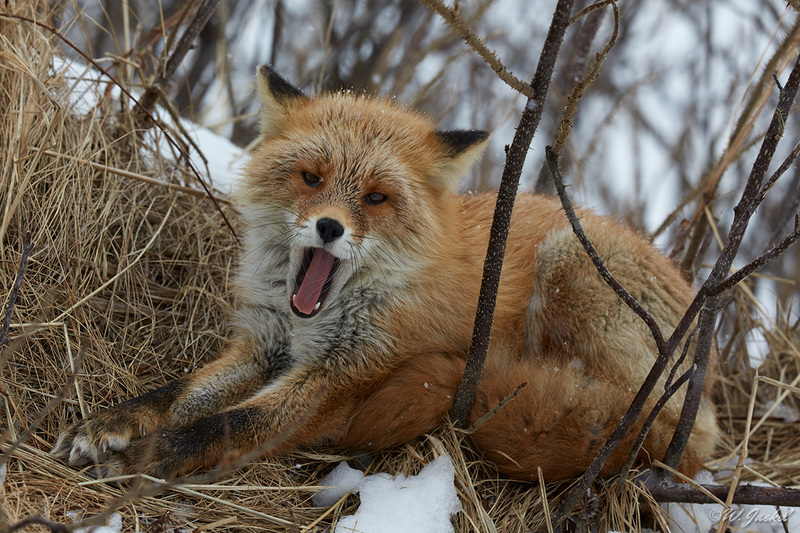 Furthermore, we drove out to the Notsuke Peninsula where we spotted some photogenic Red foxes and Ezo Deer. 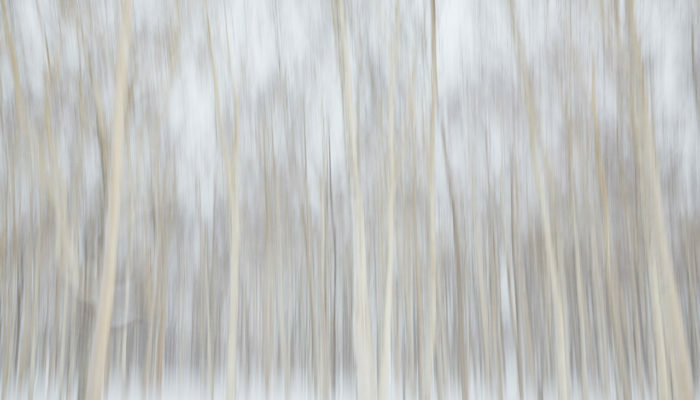 On the way around to the Utoro side of the Shiretoko Peninsula, we made stops along the way to photograph the landscape and birch tree groves as well as the Oshinkoshin Falls. 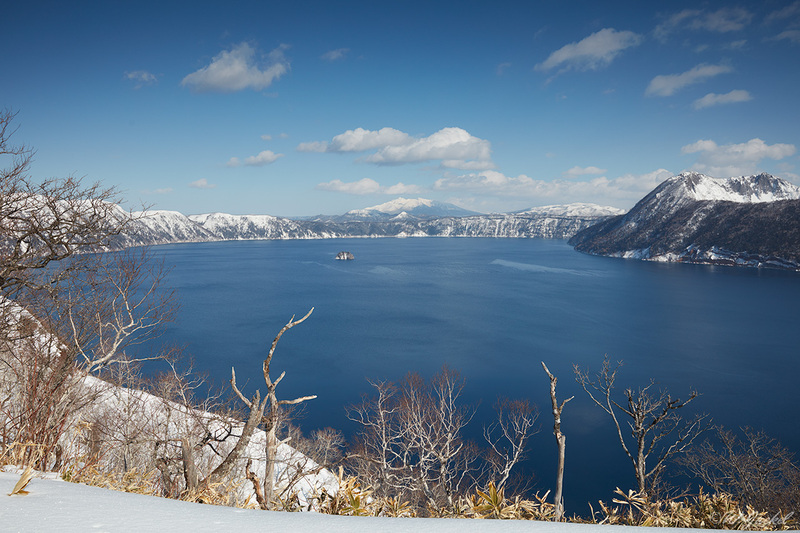 For a finally stop we made our way into the Shiretoko National Park before we took our flight back to Tokio. 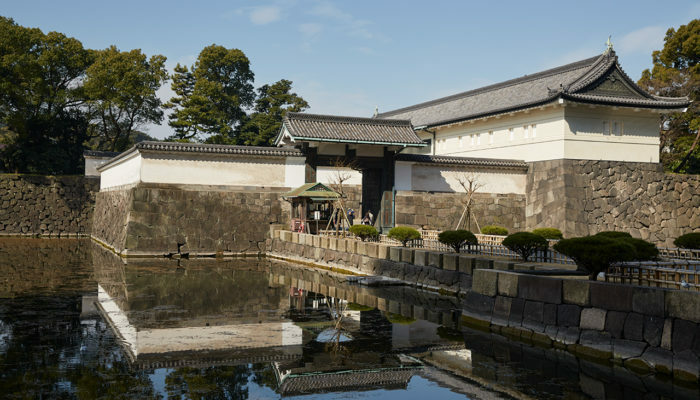 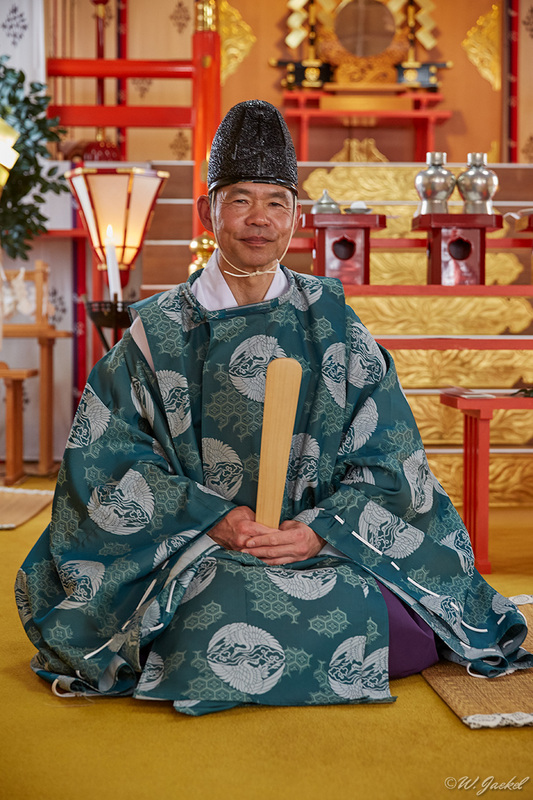 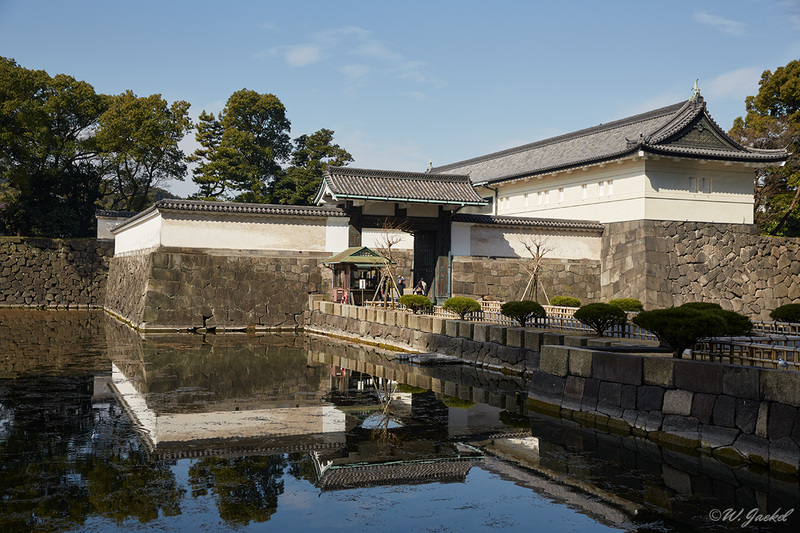 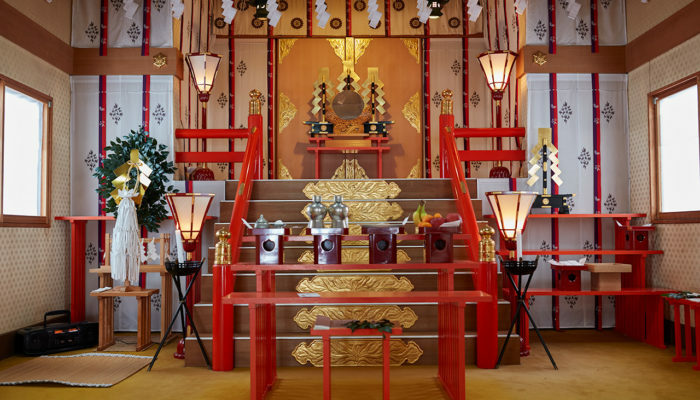 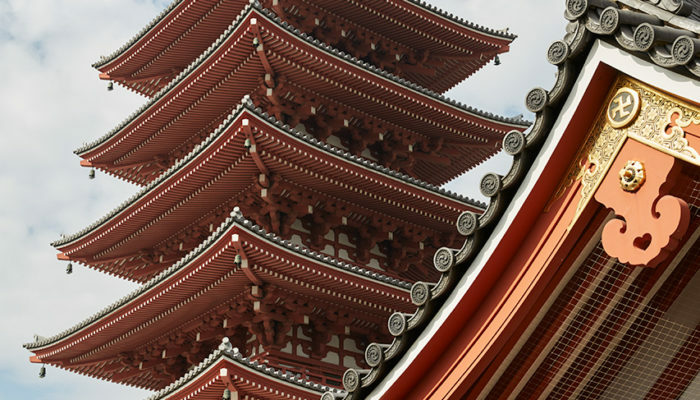 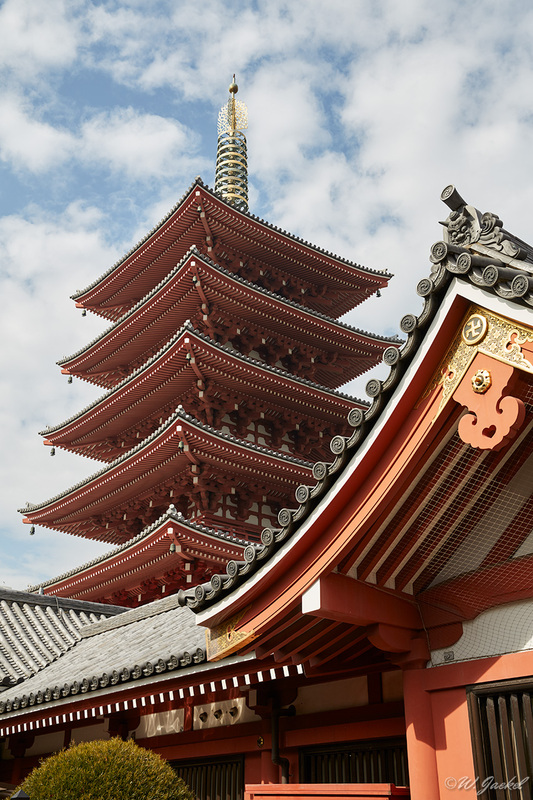 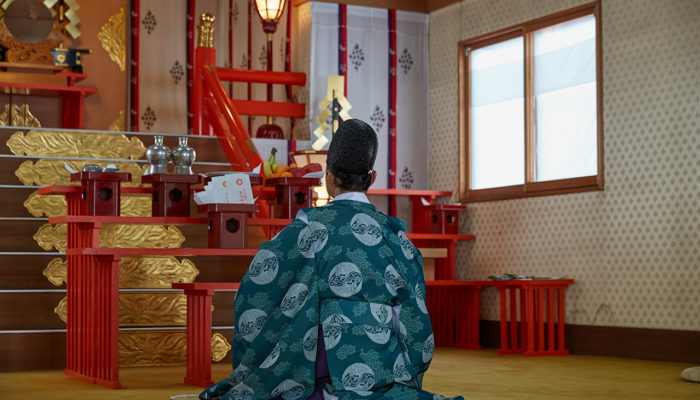 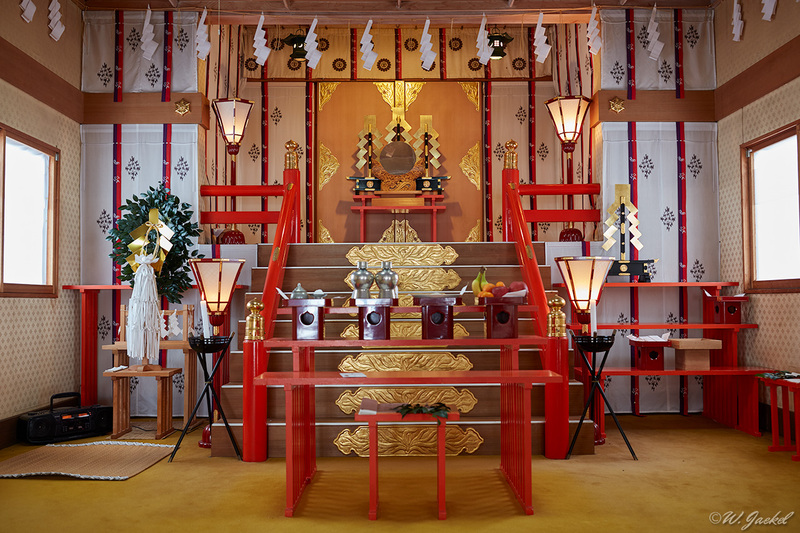 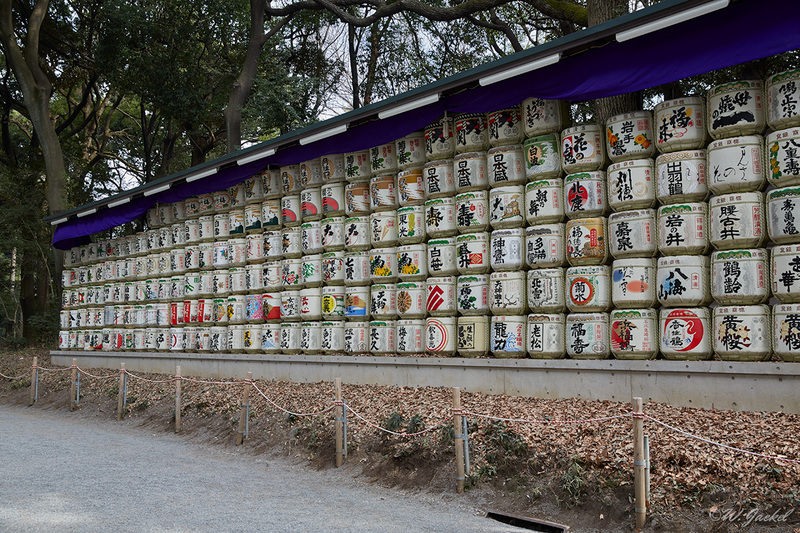 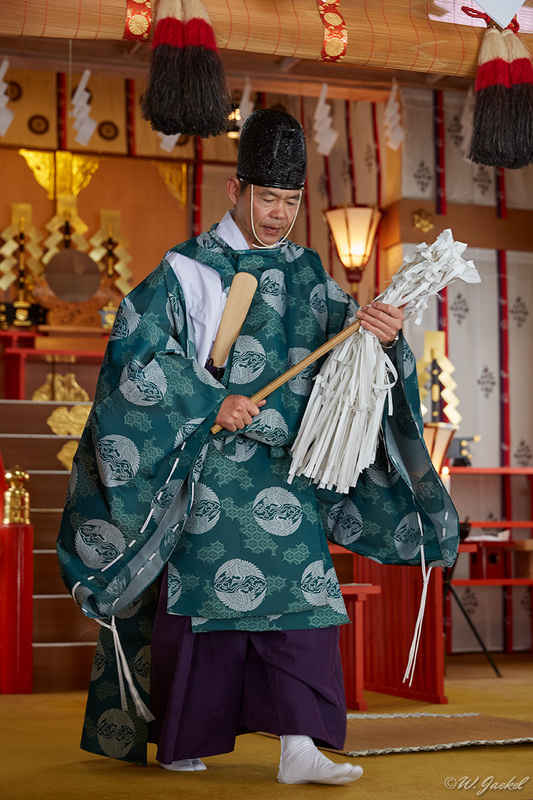 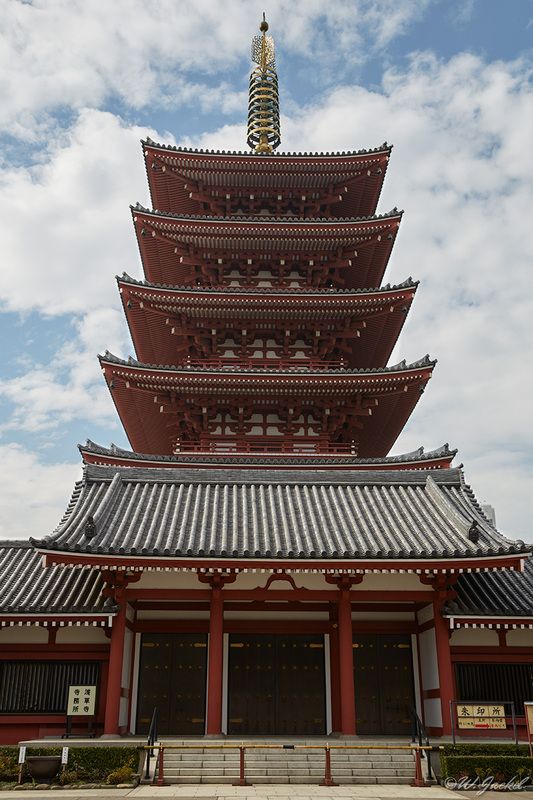 On the last day there, we took part in a City Tour visiting some of Tokyo’s main attractions, such as the Imperial Palace & East Garden, Akasuka Kannon Temple and Meji Shrine, where we could watch the traditional wedding ceremony. 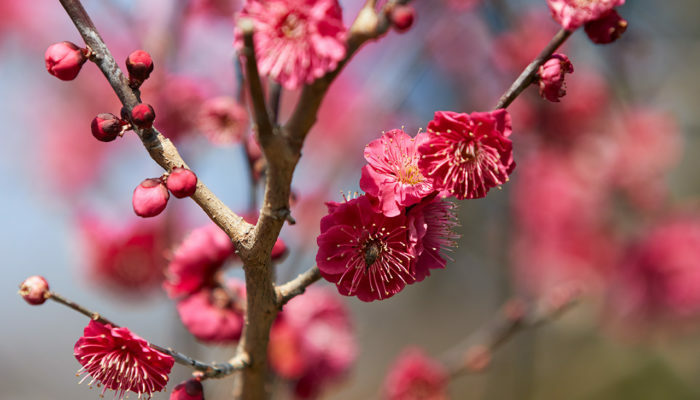 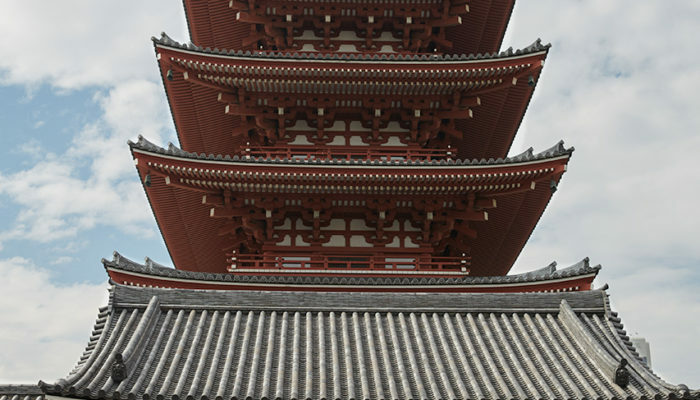 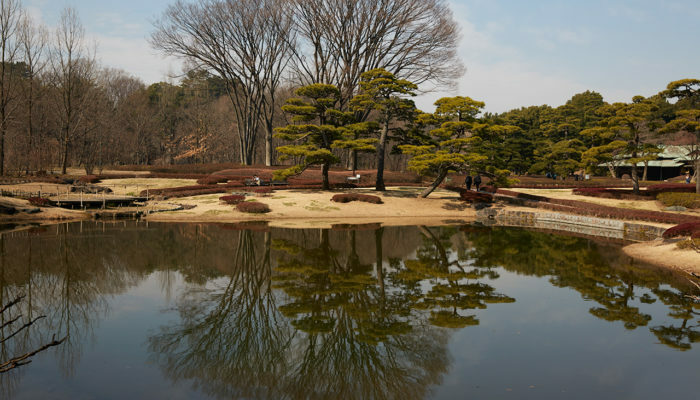 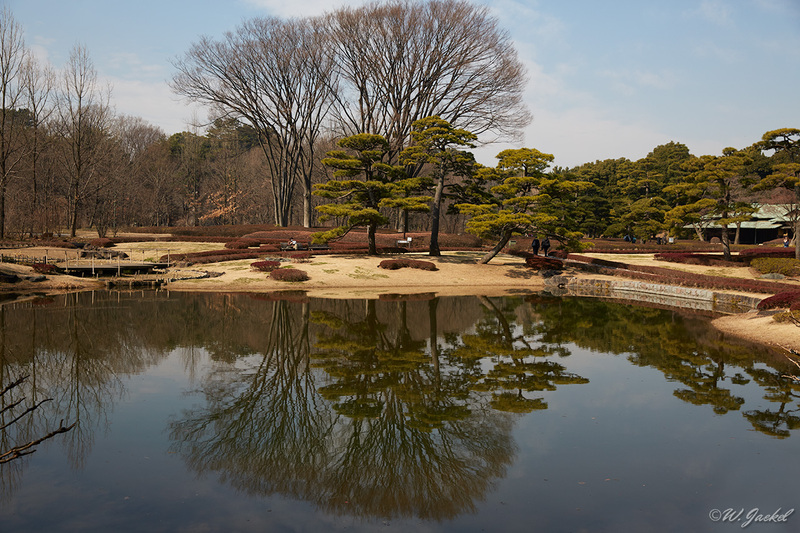 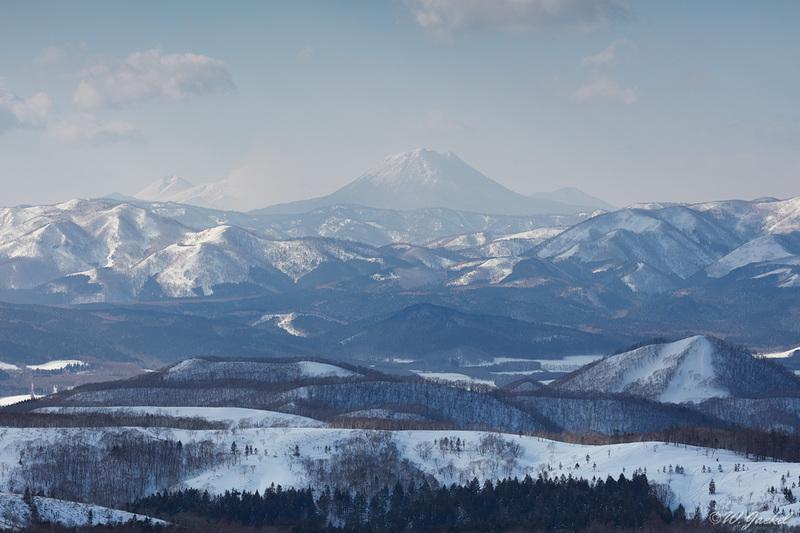 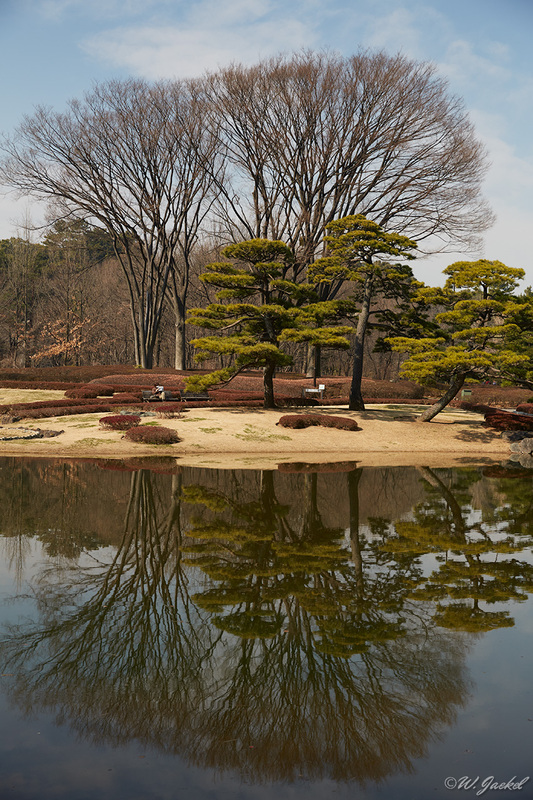 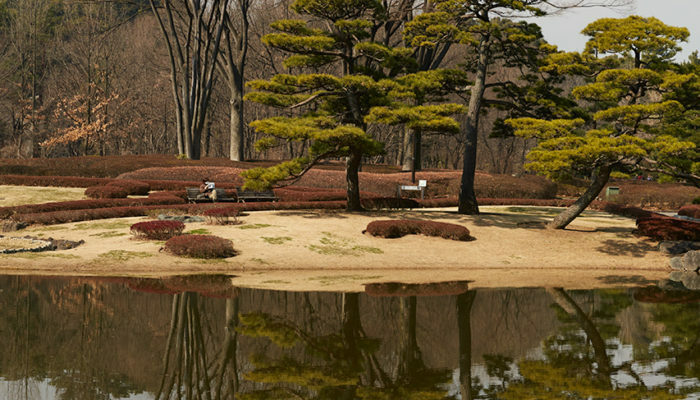 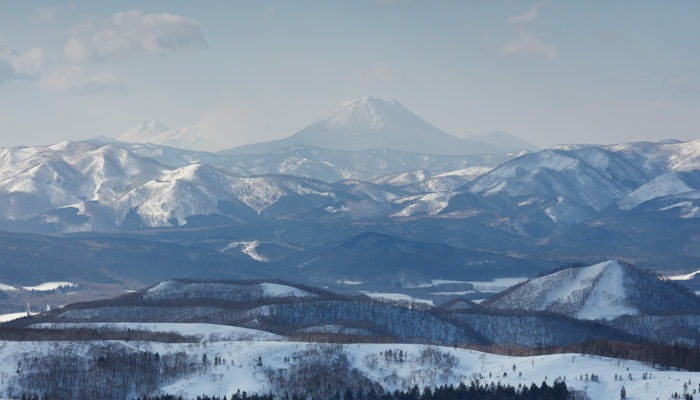 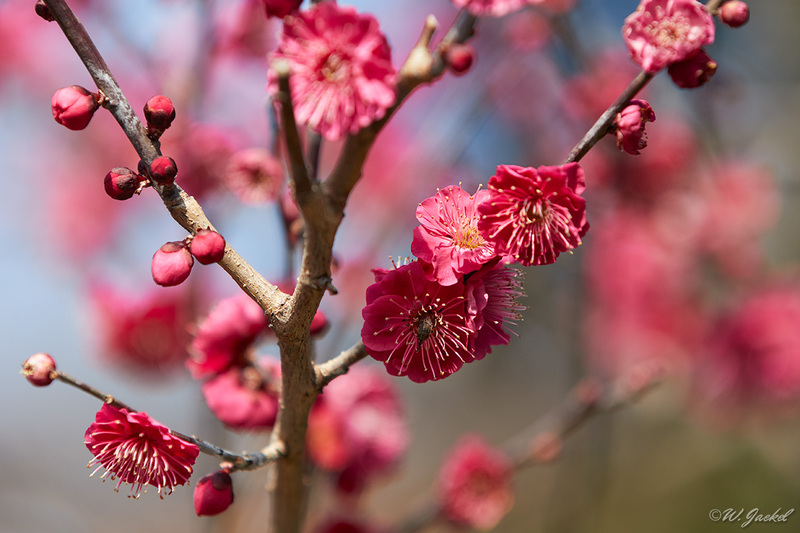 In summary my first trip to Japan was a great experience and extremely productive for photography although the weather conditions weren’t the best because of the unusual mild winter. 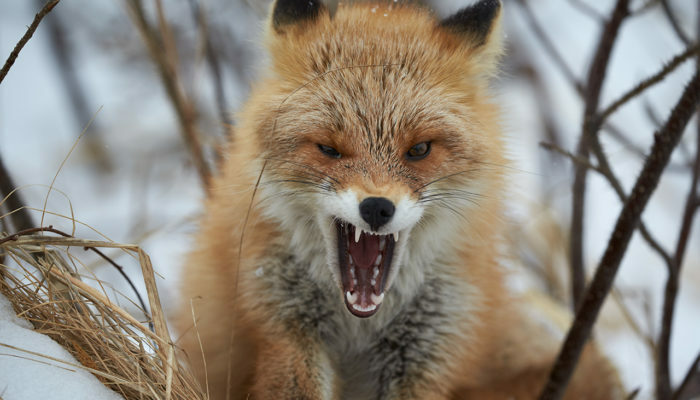 I came home with around 14000 images and it took me some months to organize and post process the selected images the gallery just shows a small fraction of.